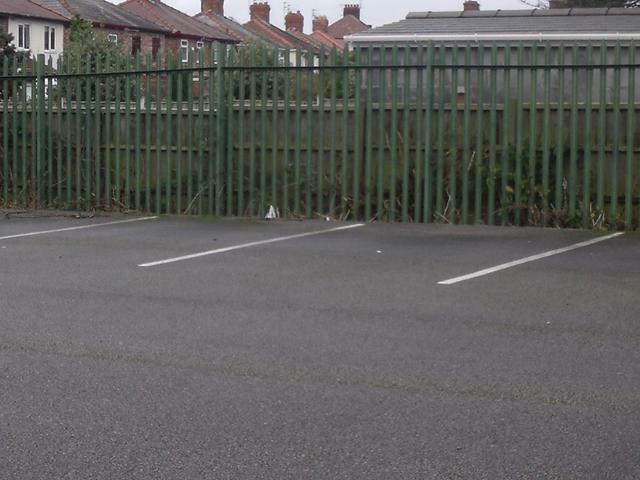 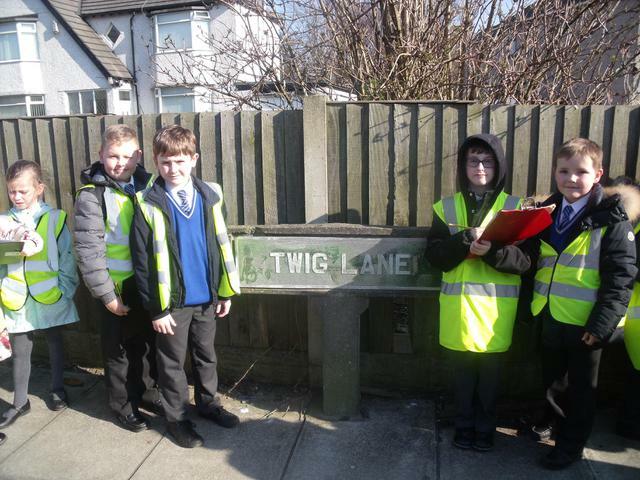 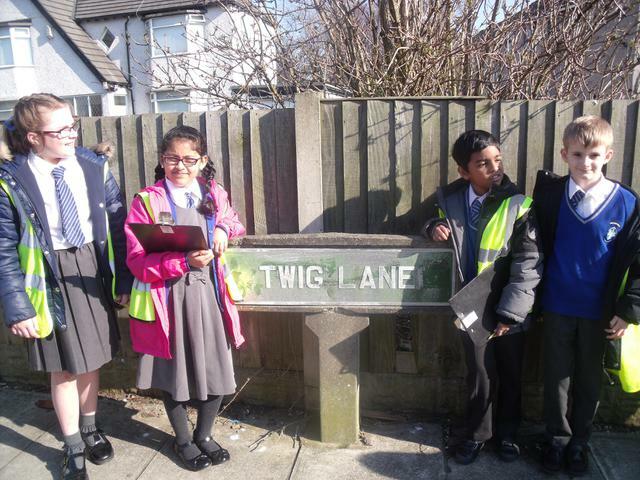 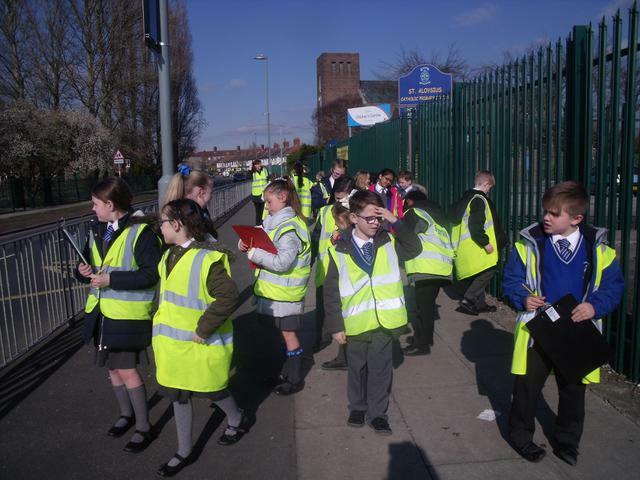 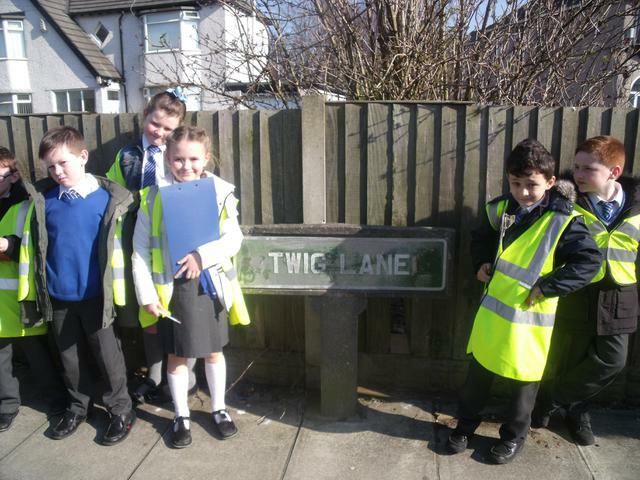 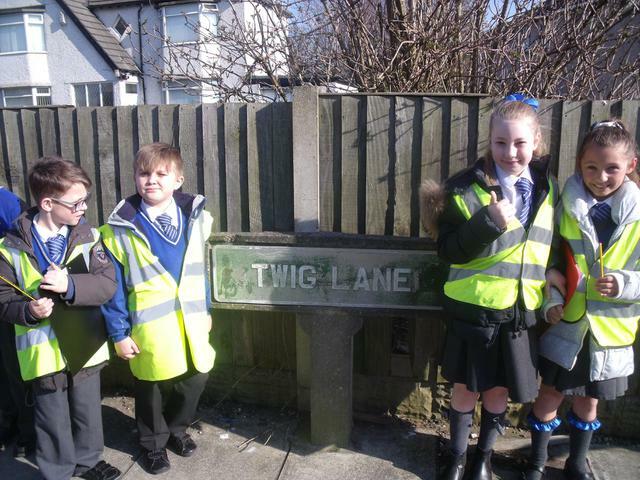 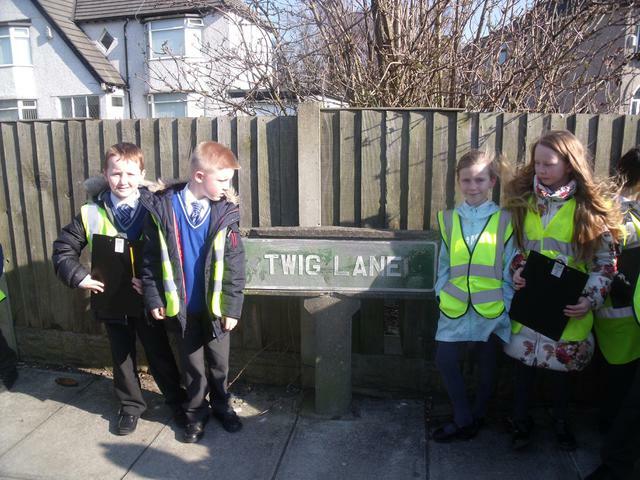 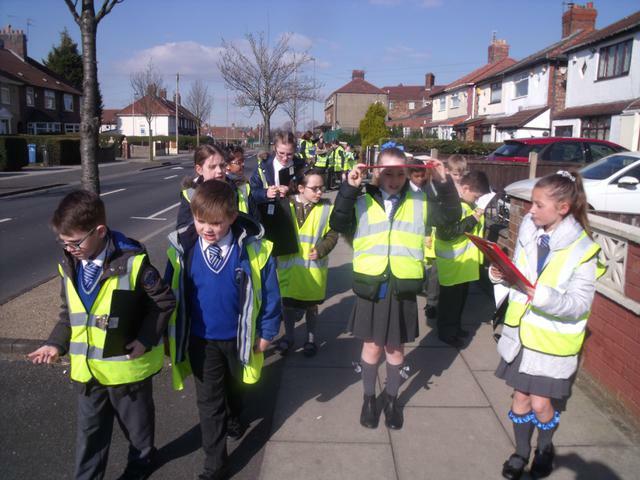 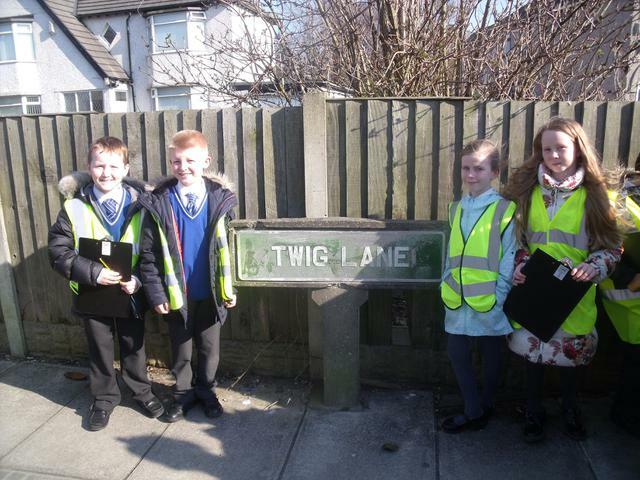 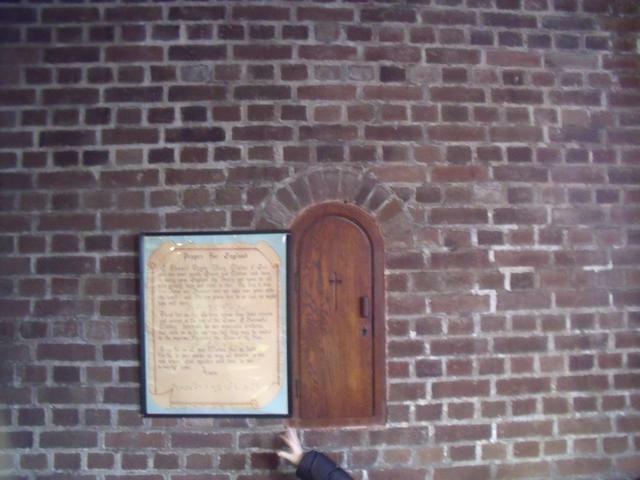 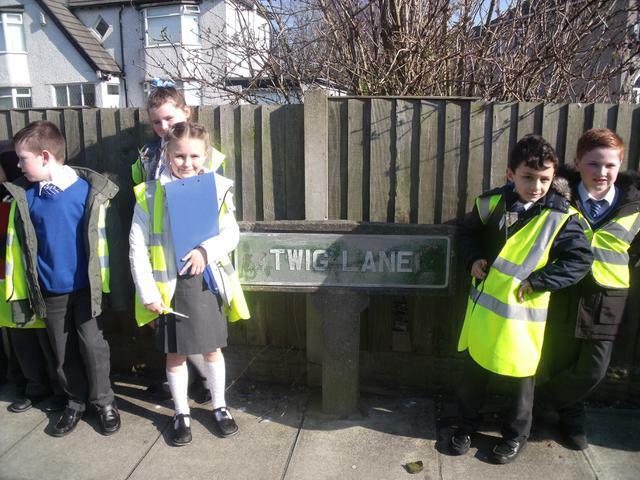 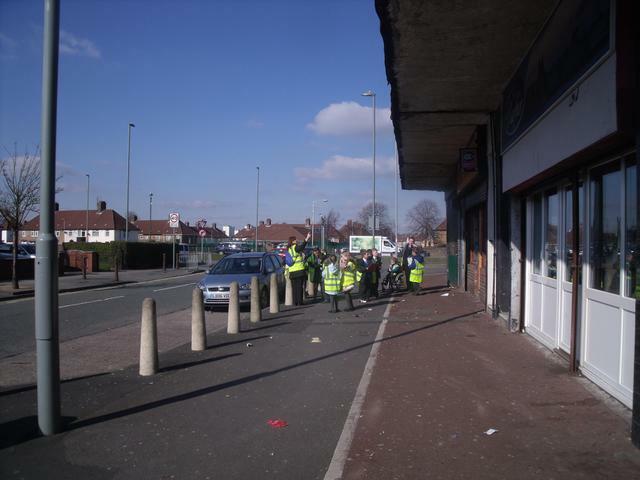 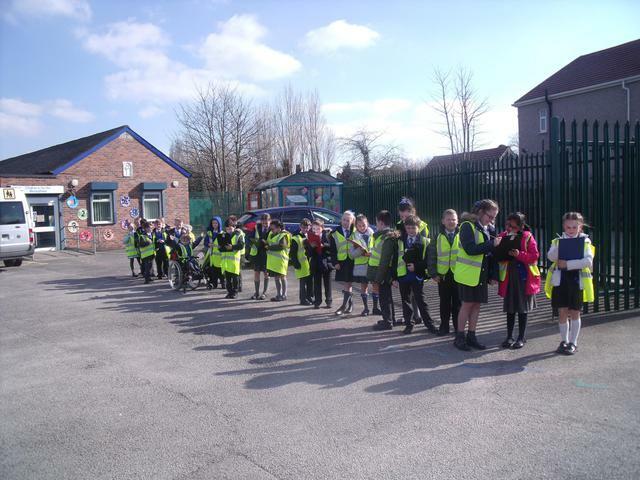 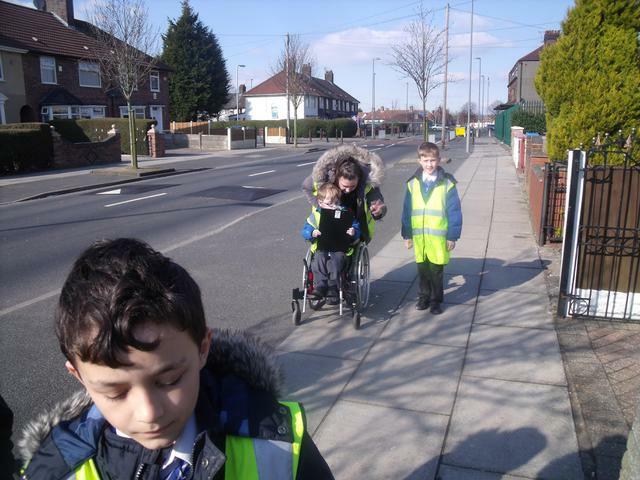 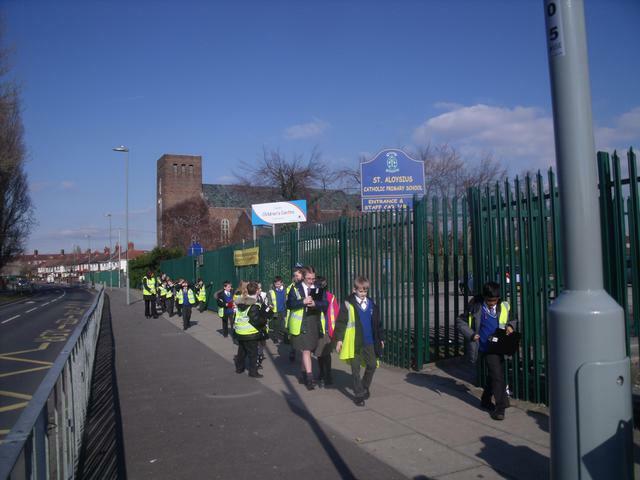 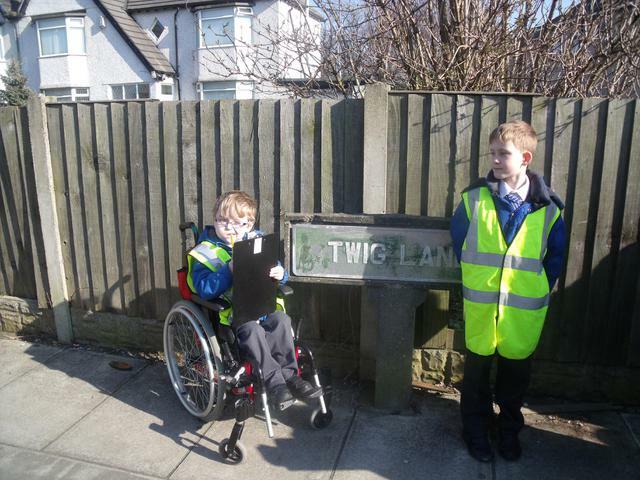 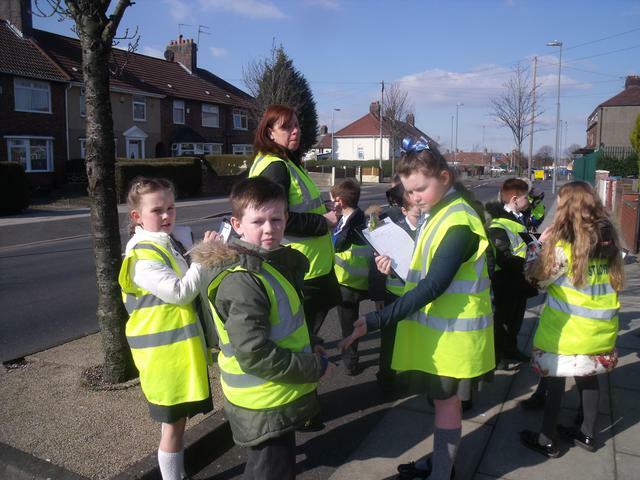 On Wednesday 16th March the children went and surveyed Twig Lane. 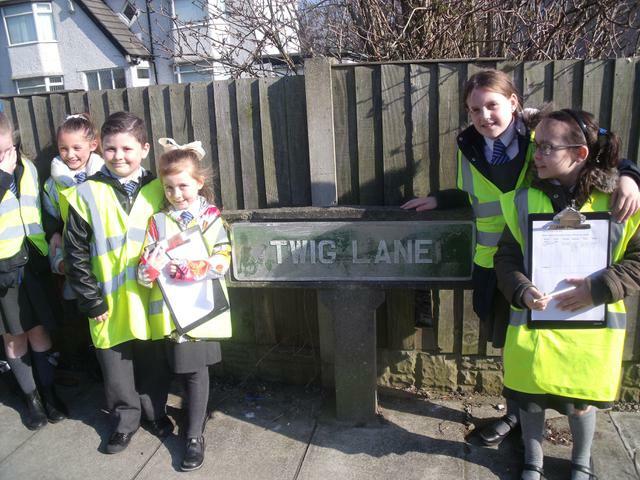 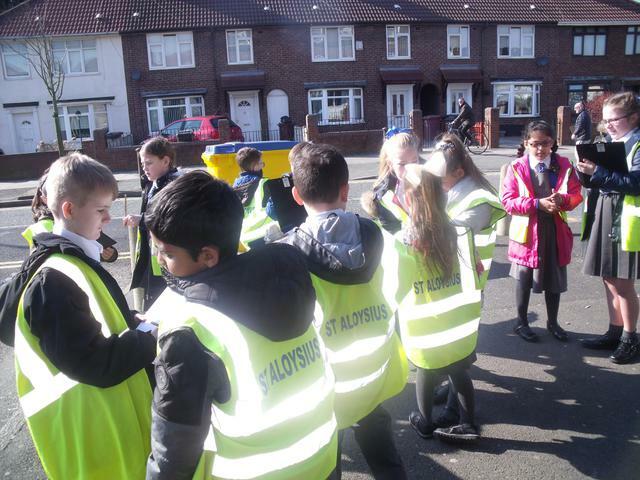 The children completed a tally chart to research different types of houses, litter, door colours and street furniture.We were surprised to find that there was only one litter bin, but happily there were a lot of trees- over 35 to brighten up our lane. 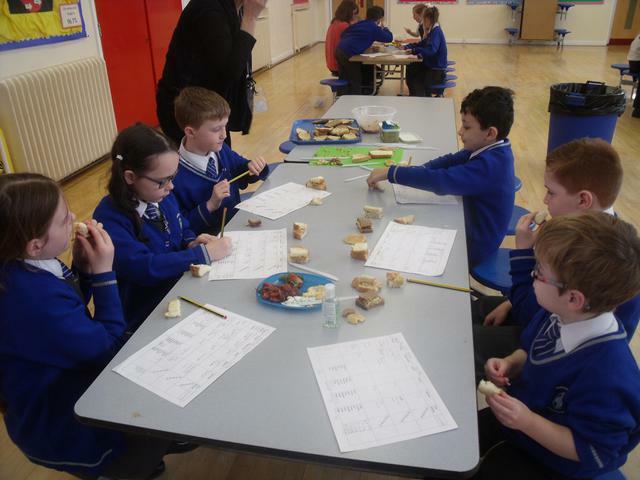 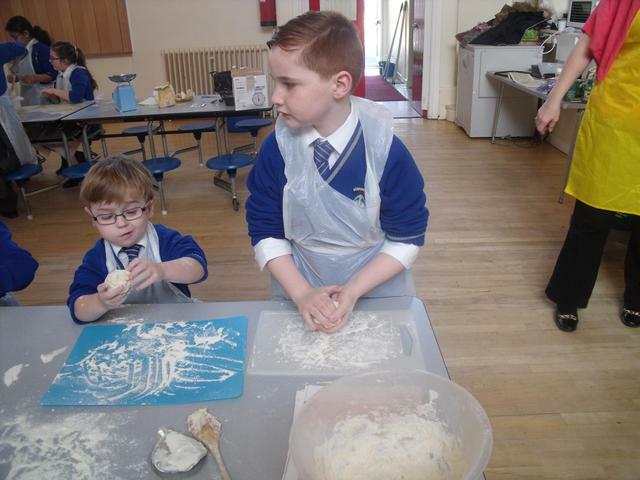 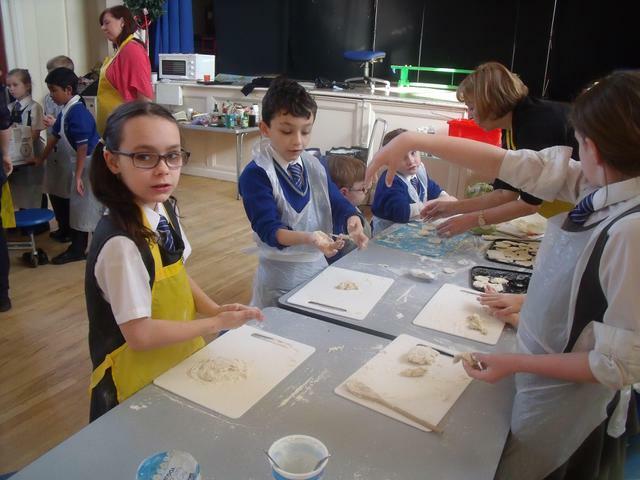 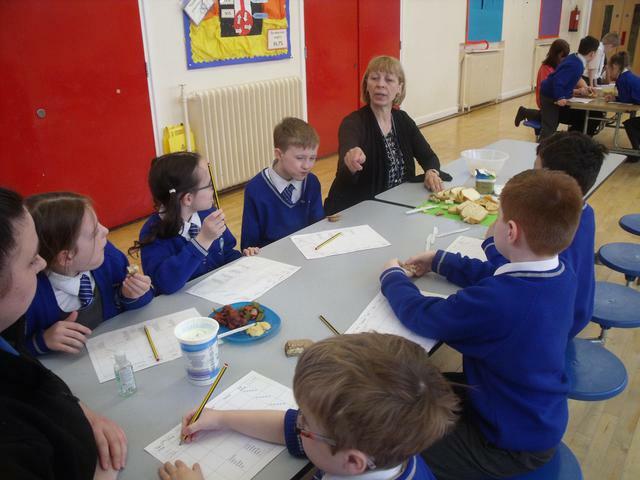 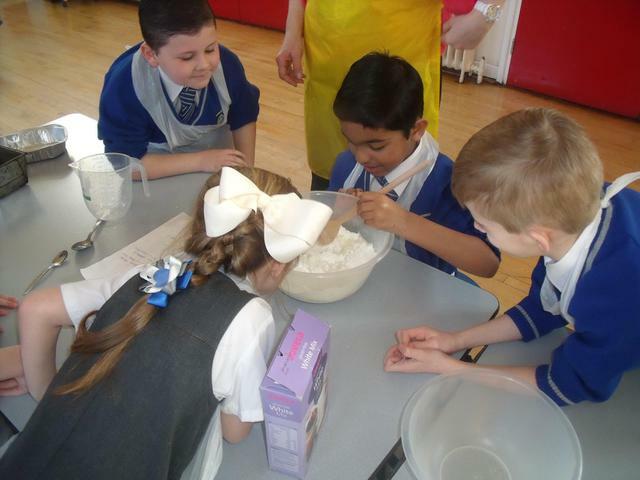 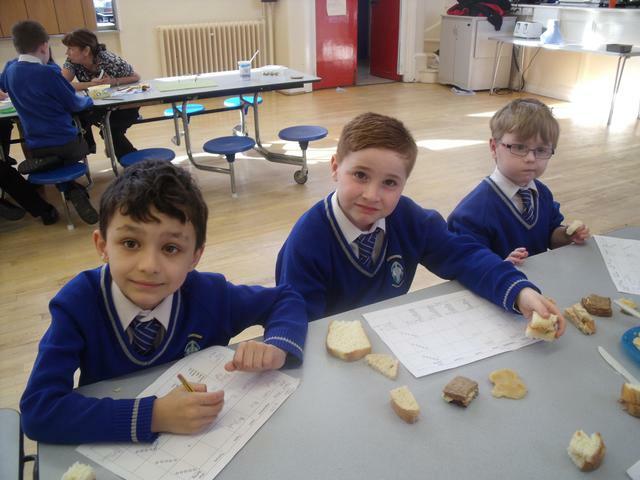 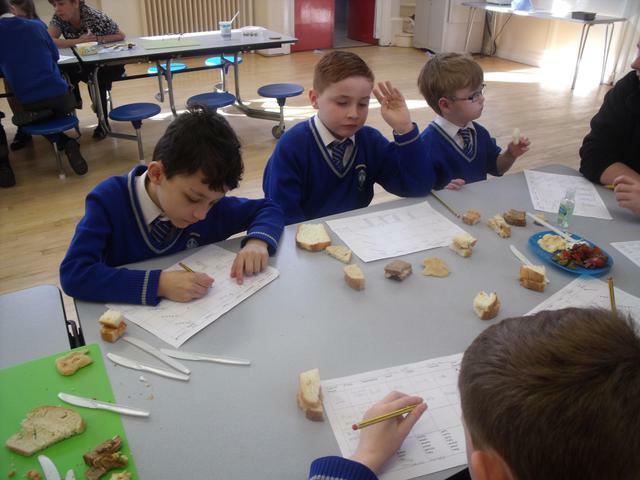 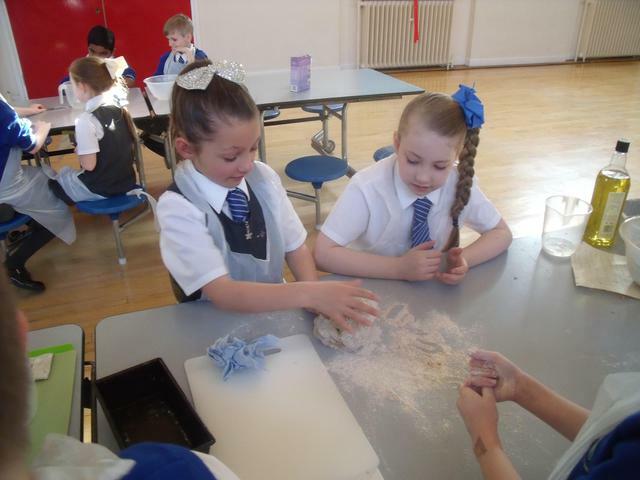 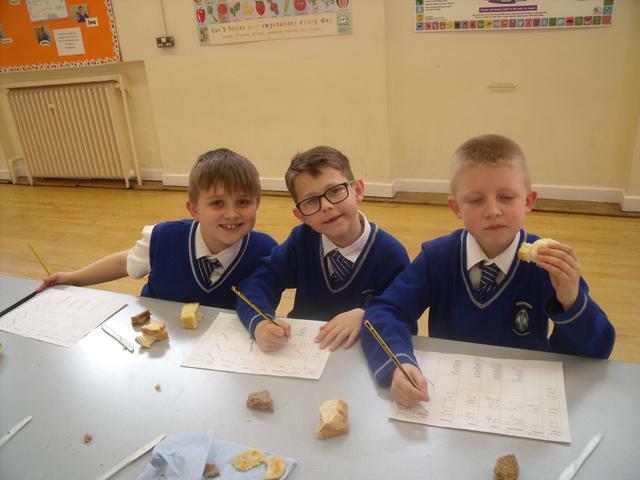 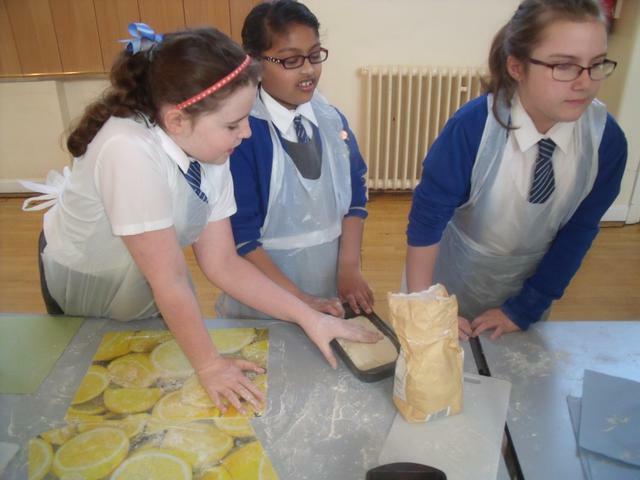 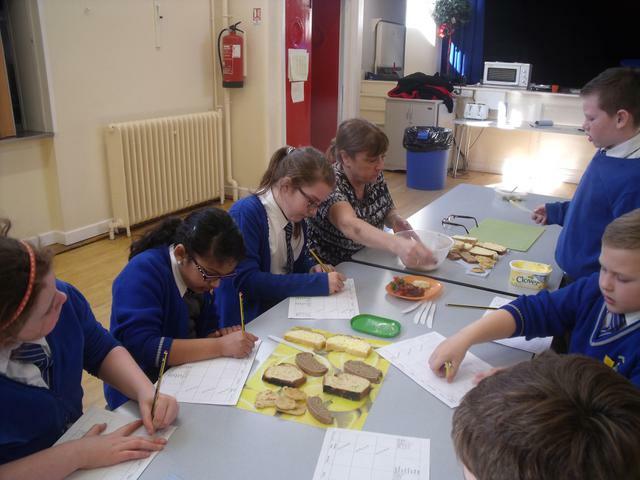 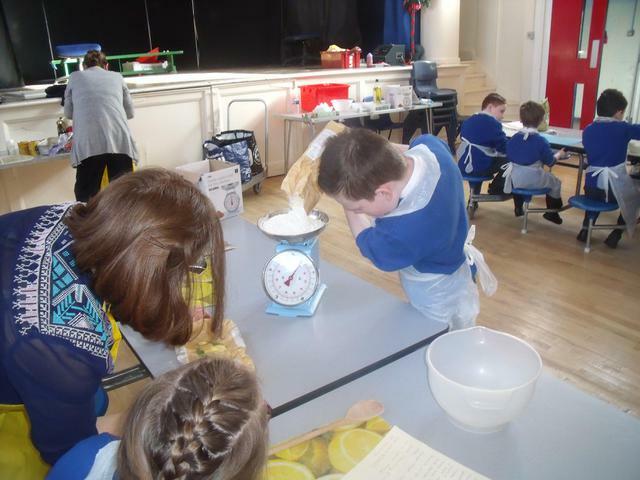 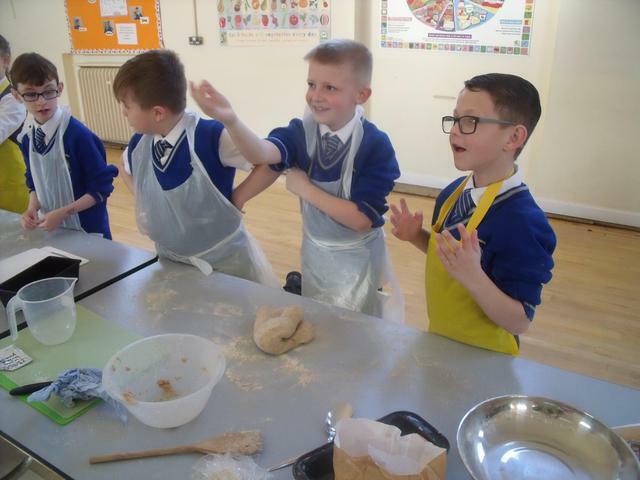 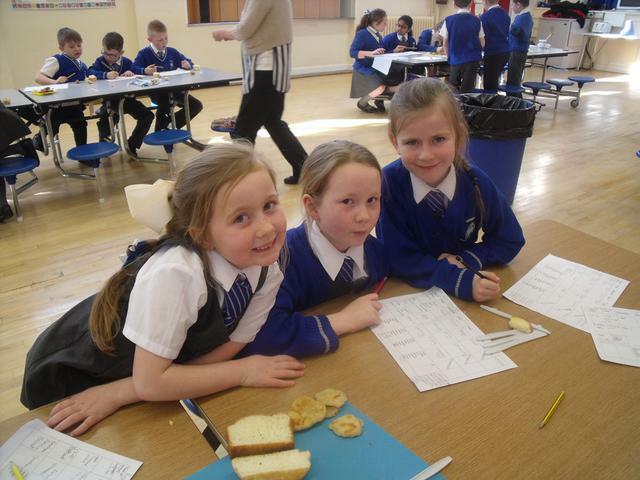 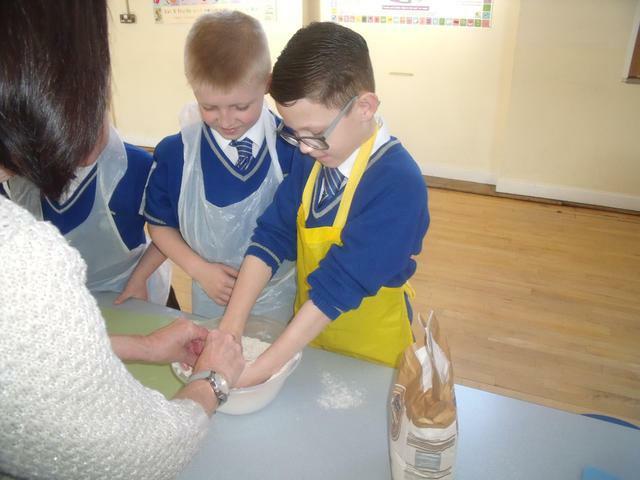 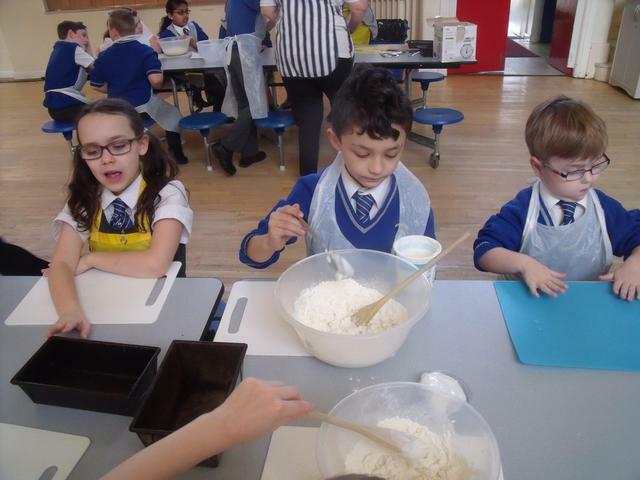 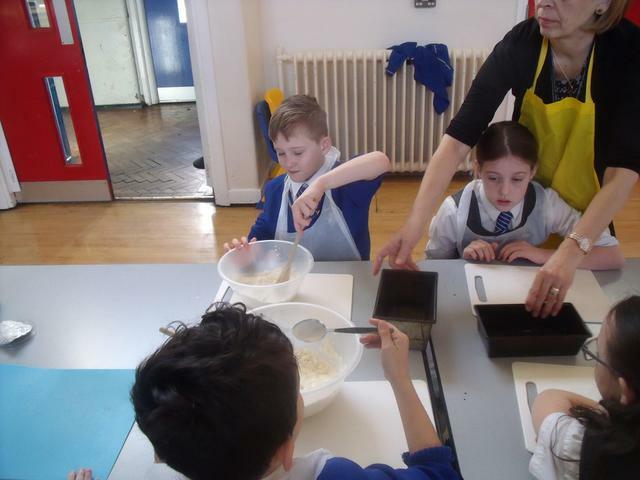 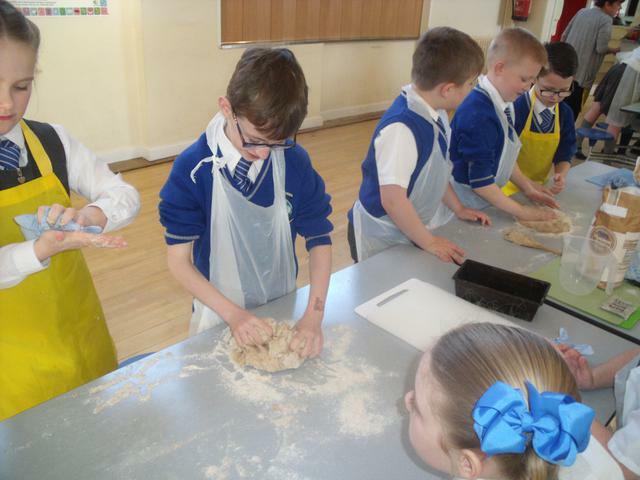 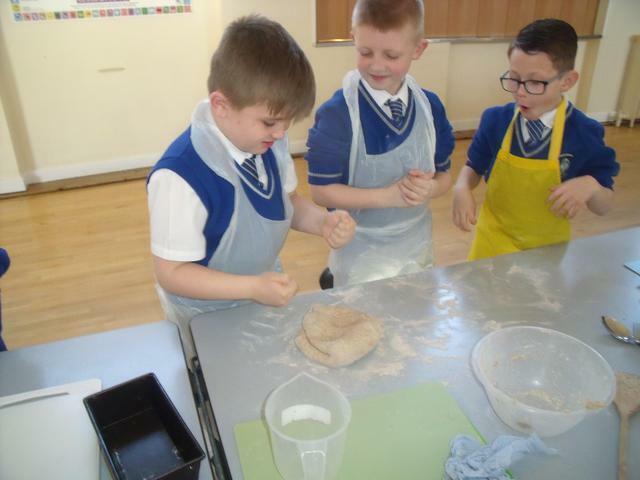 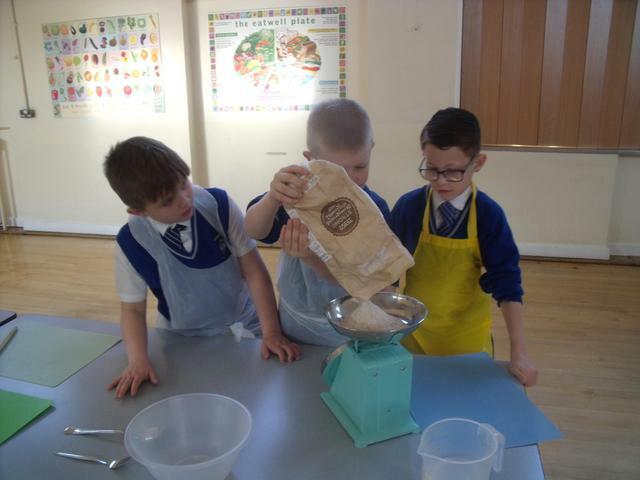 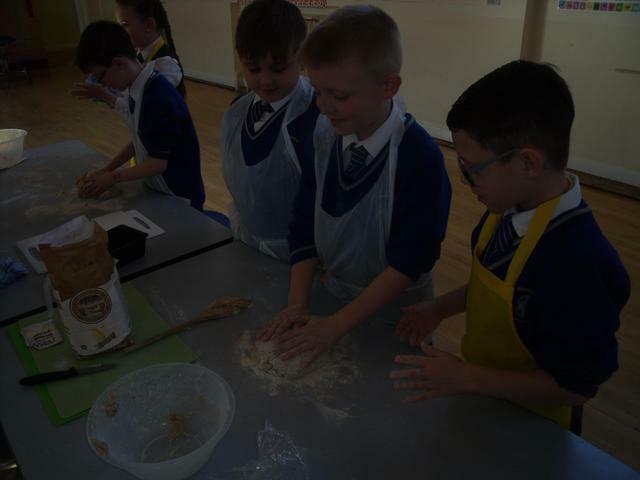 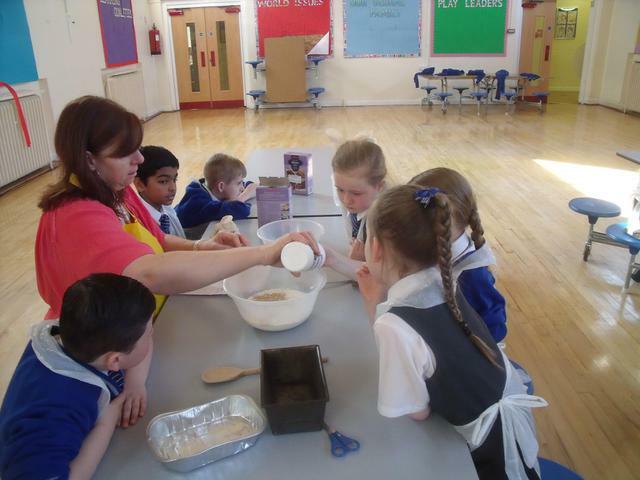 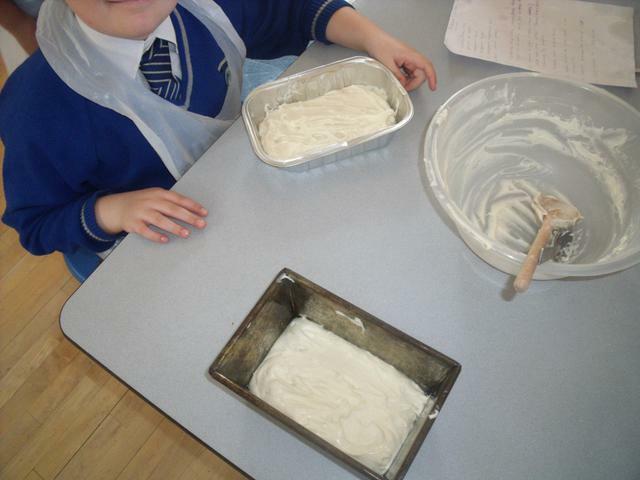 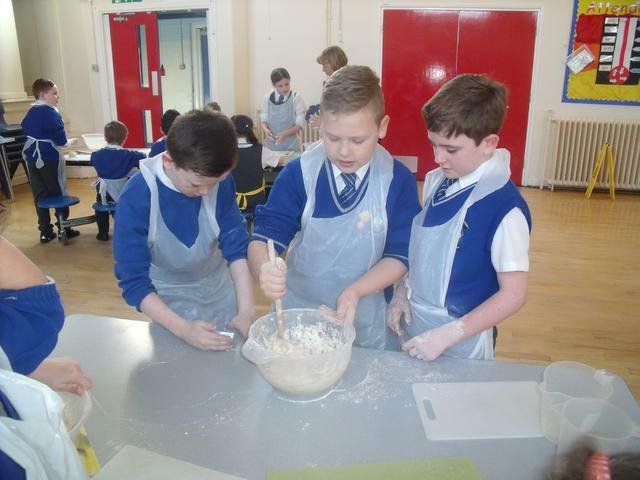 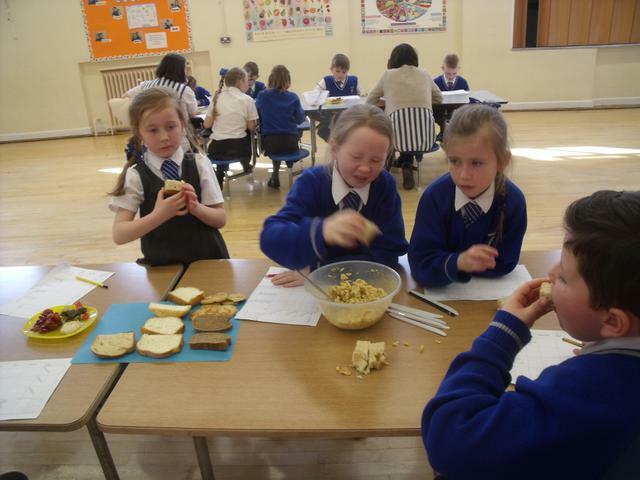 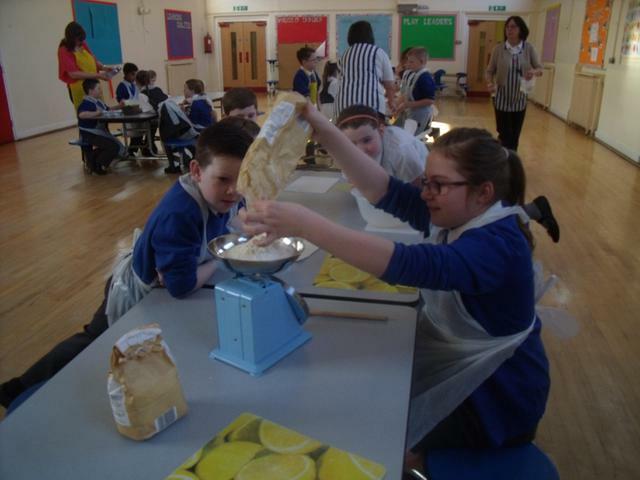 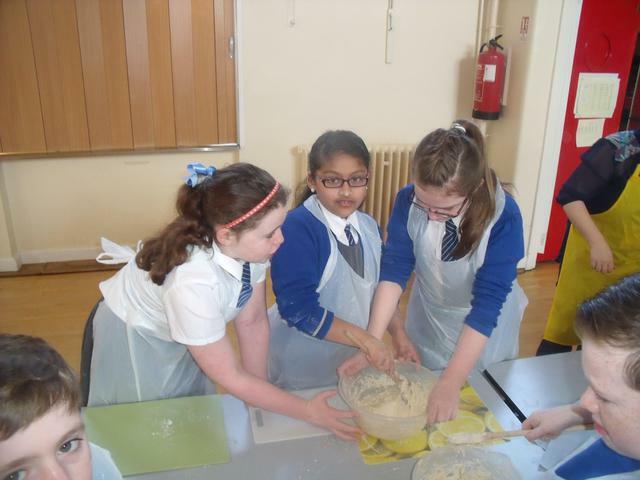 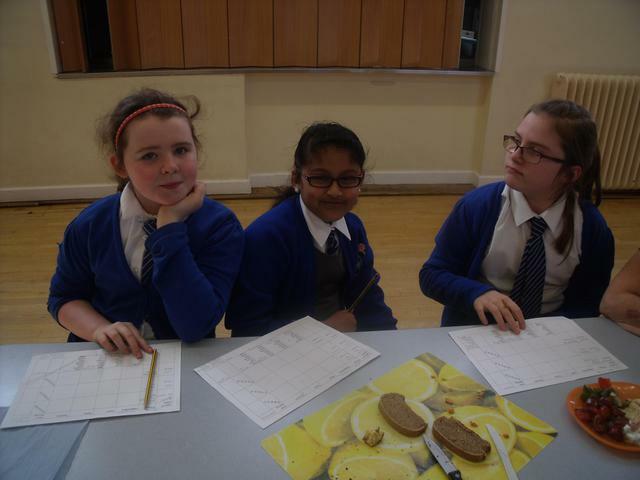 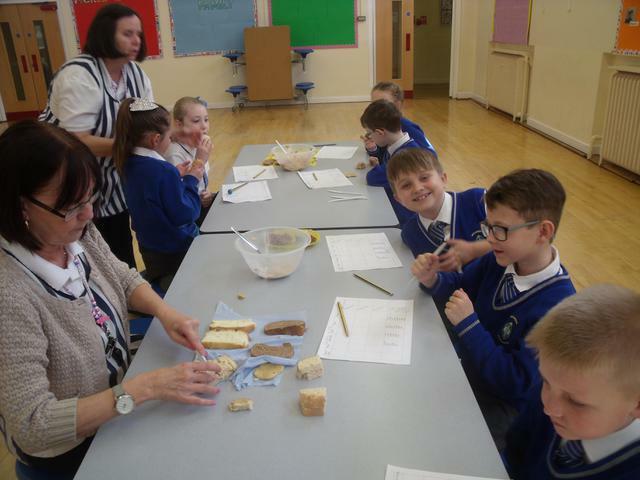 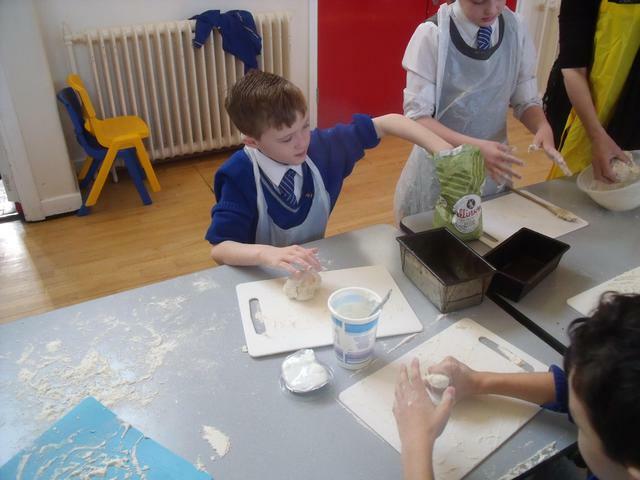 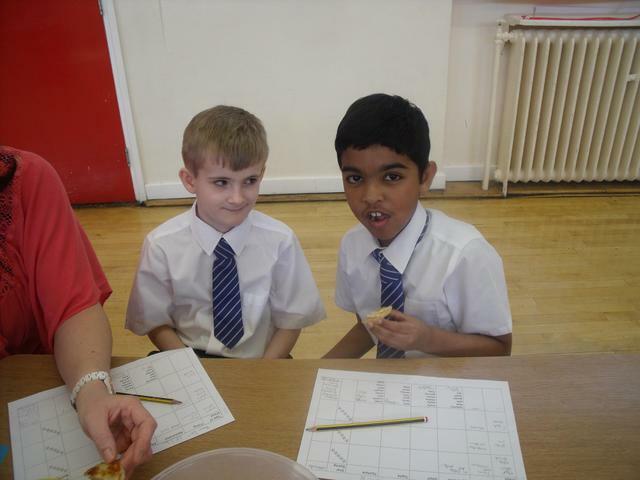 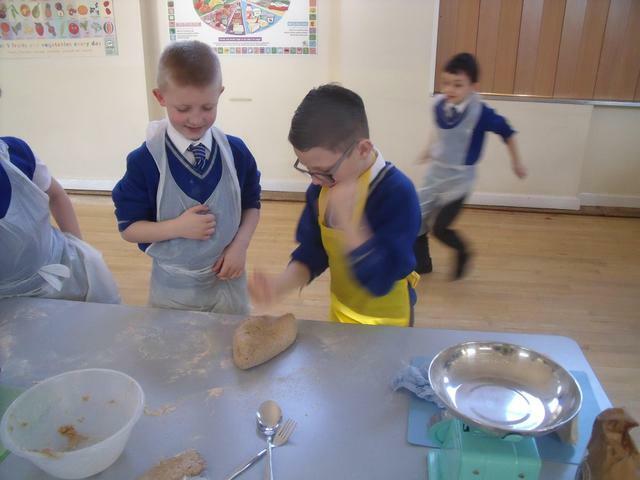 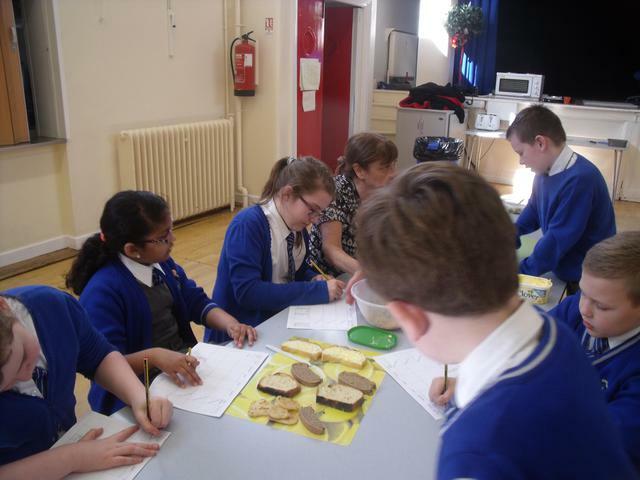 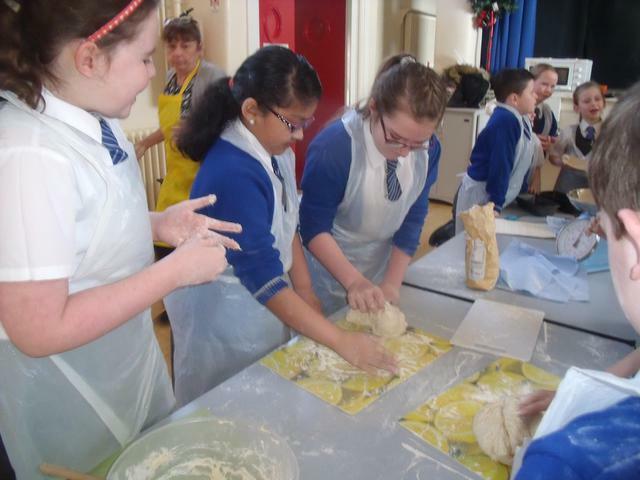 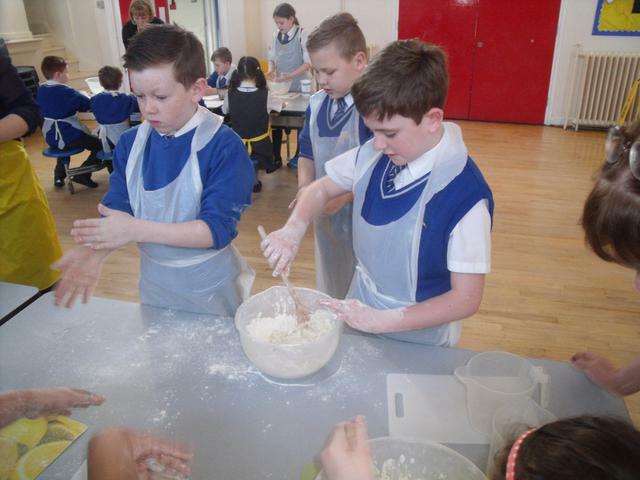 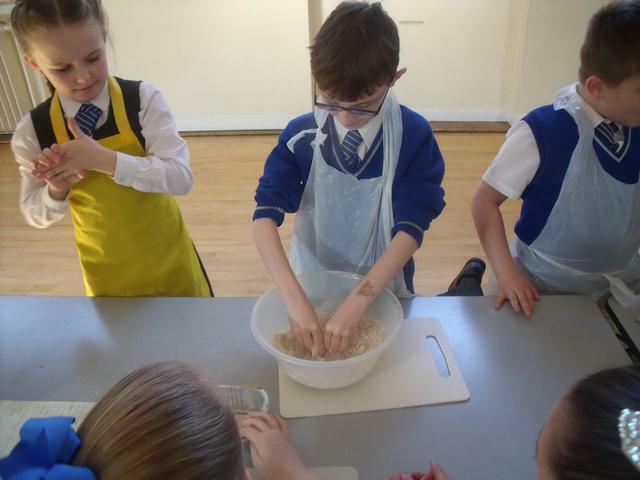 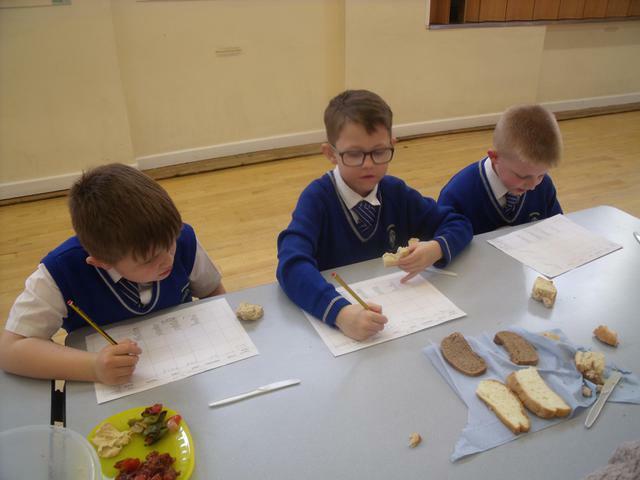 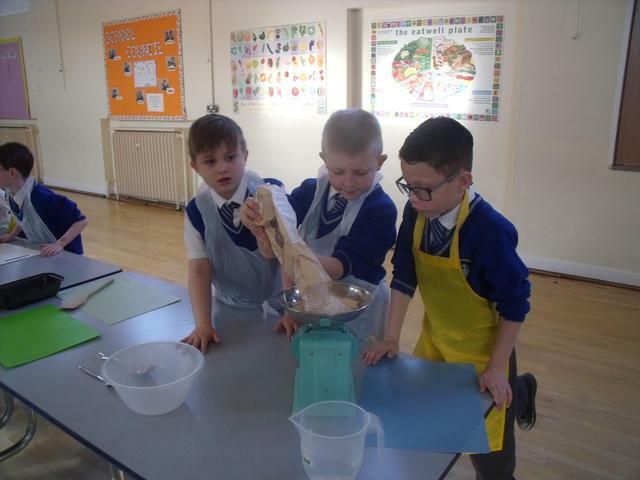 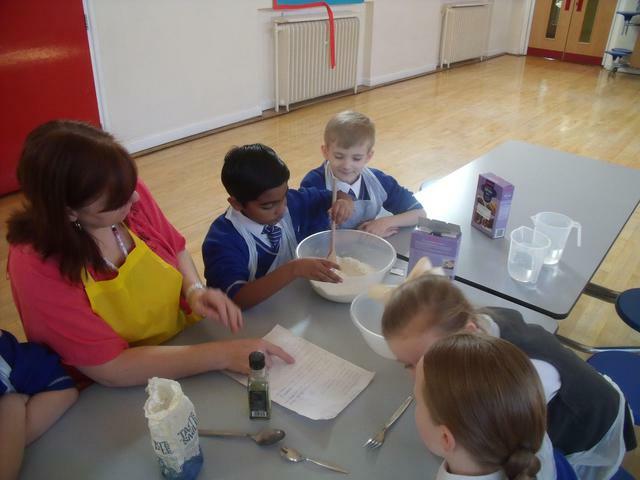 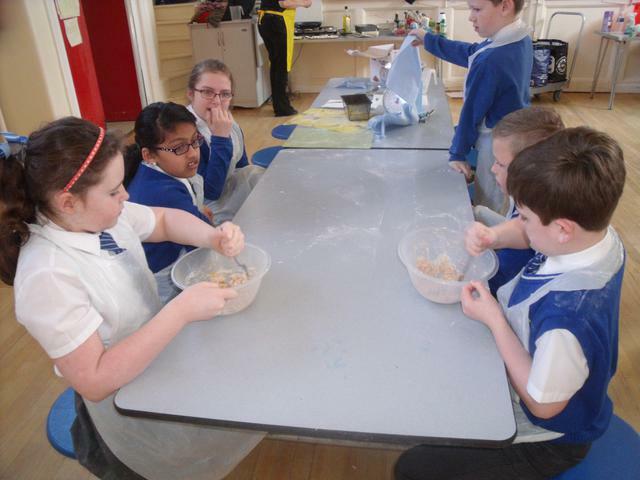 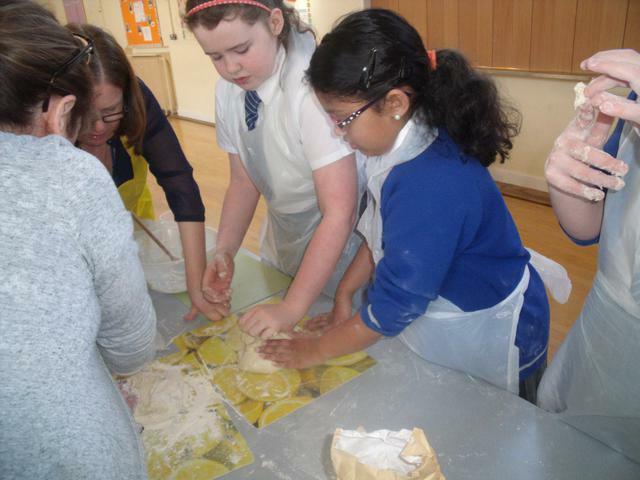 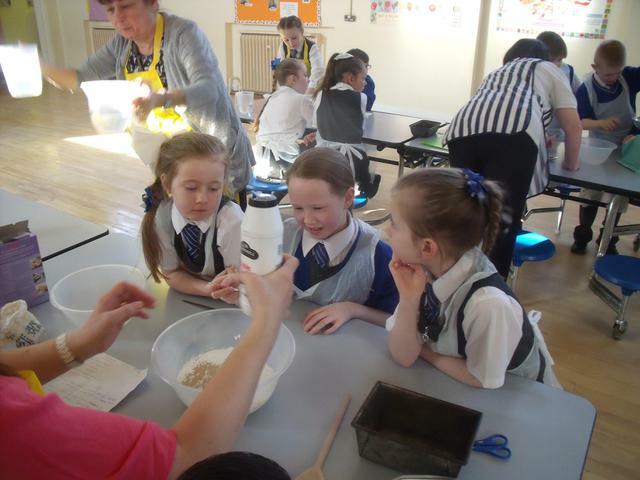 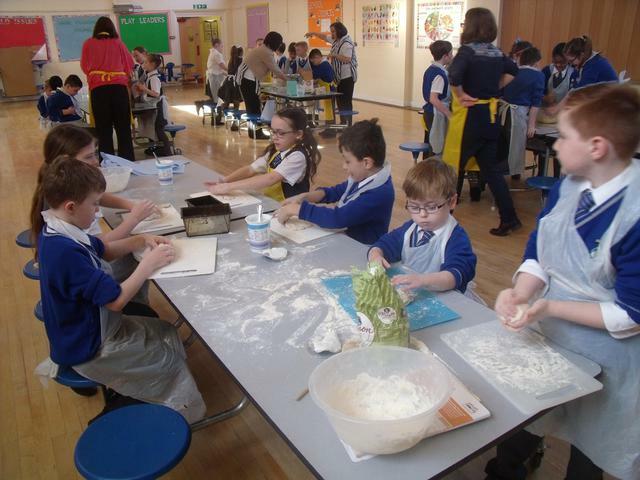 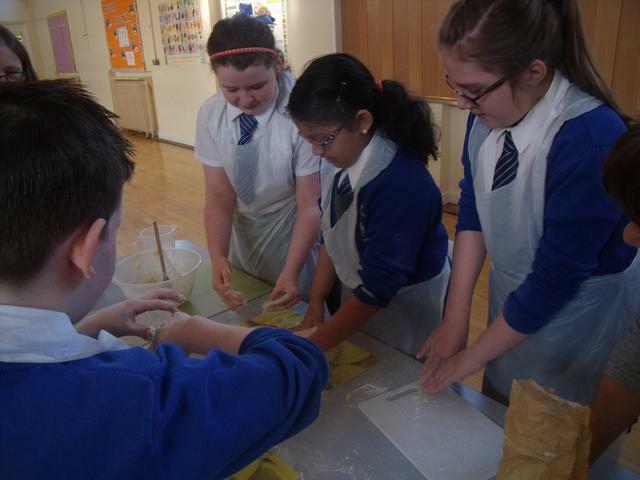 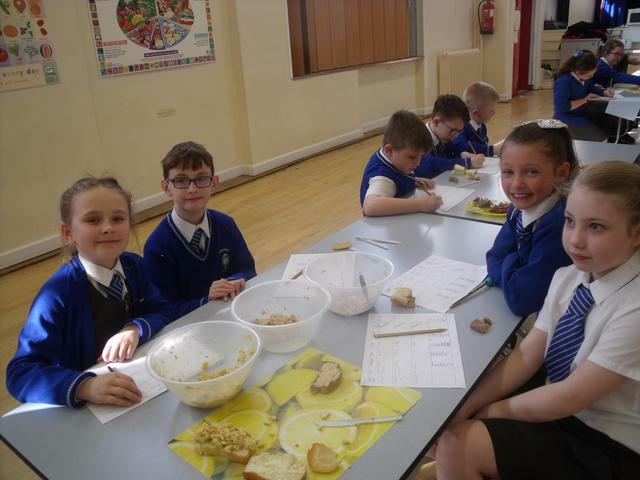 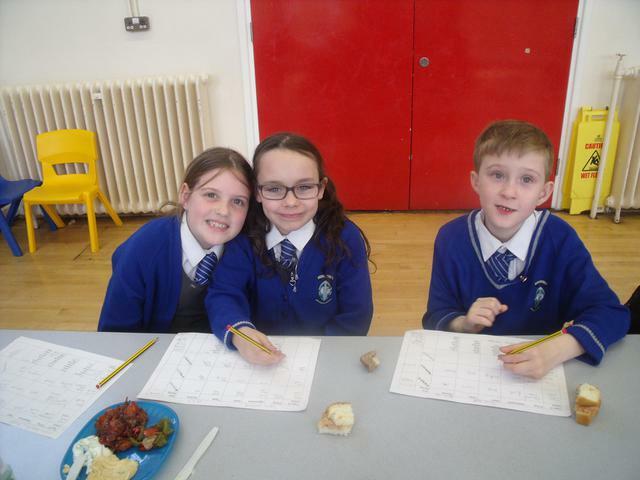 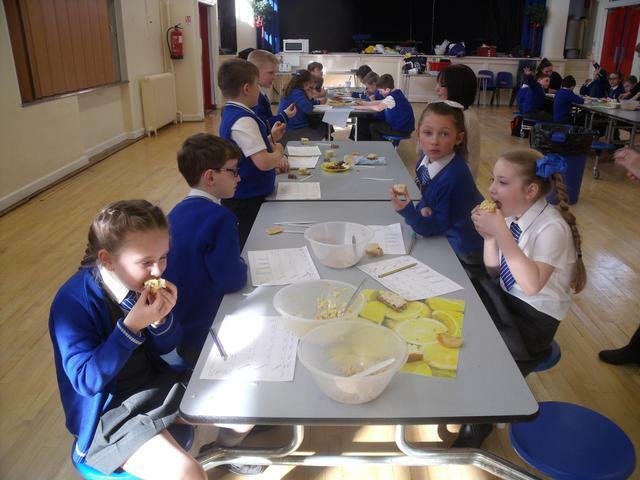 The children had a great time making bread including wholemeal, white, gluten free and flat bread. 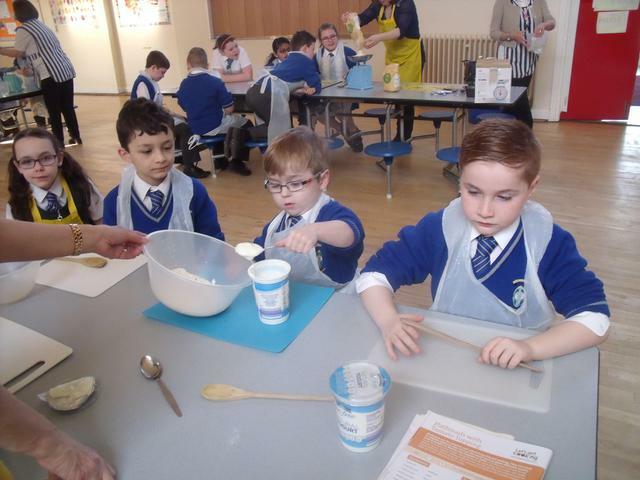 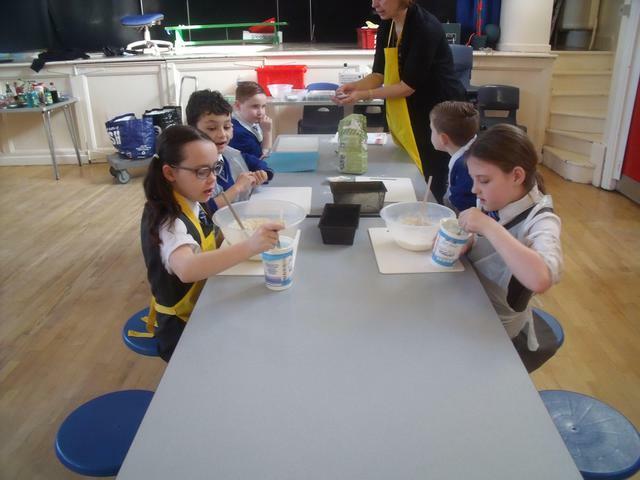 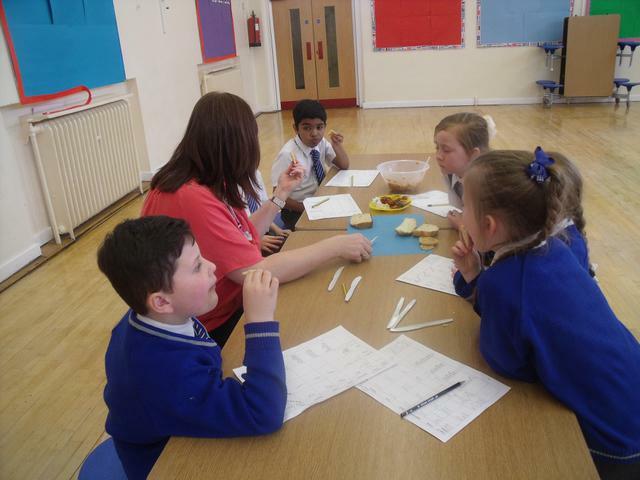 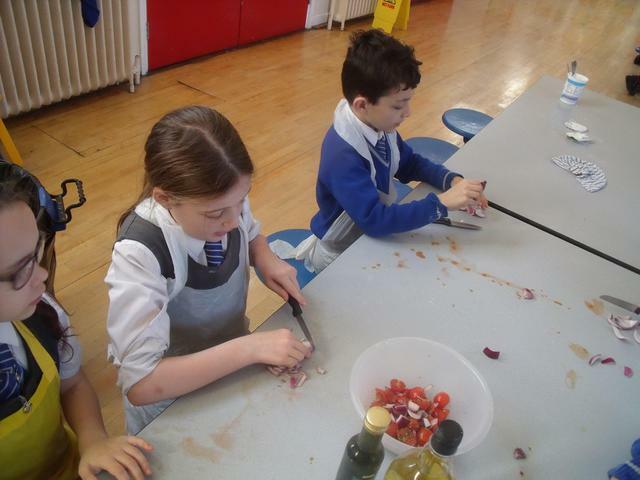 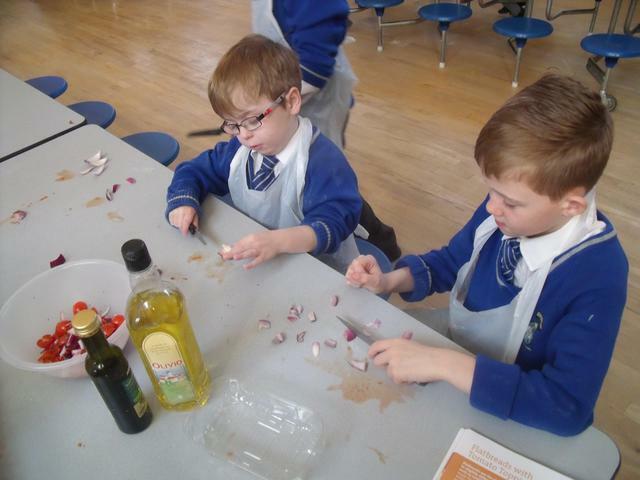 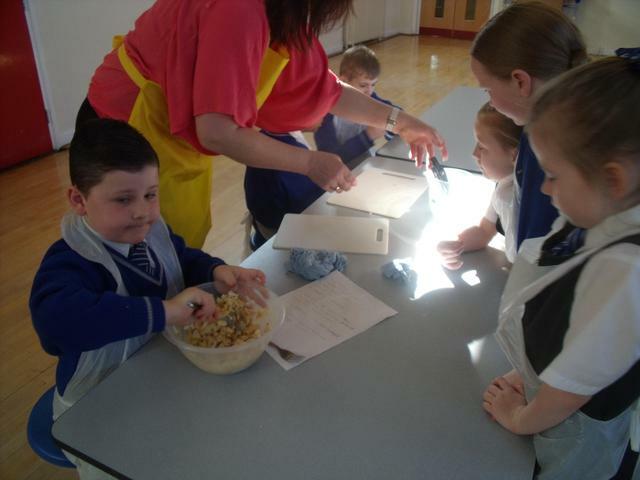 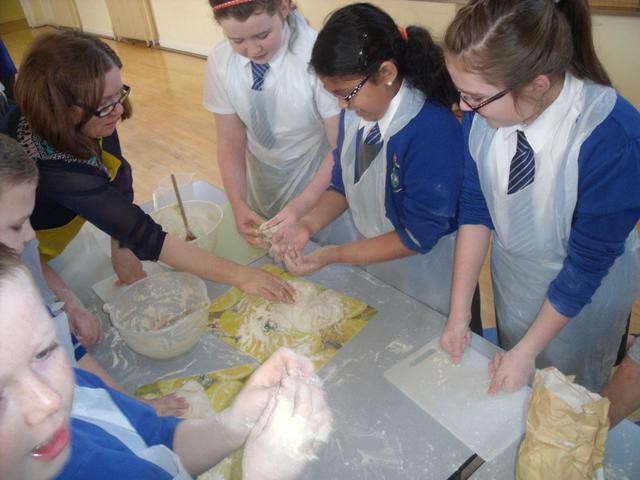 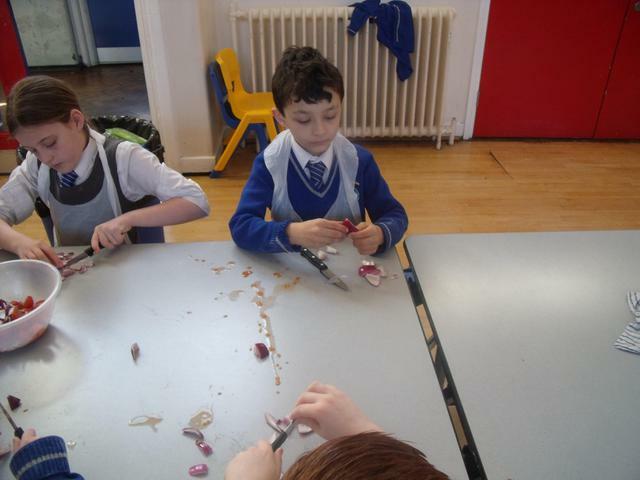 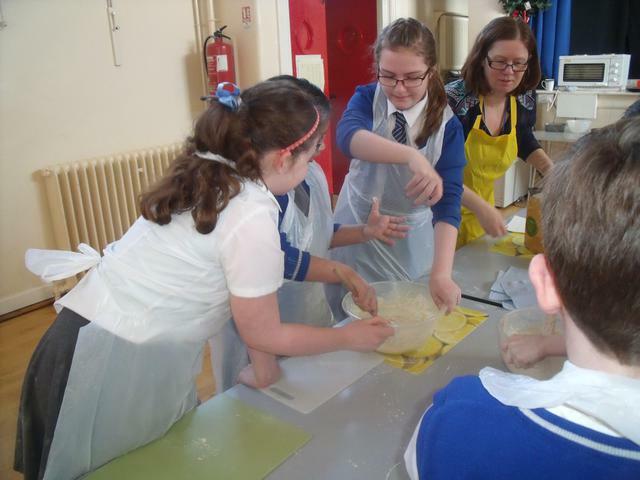 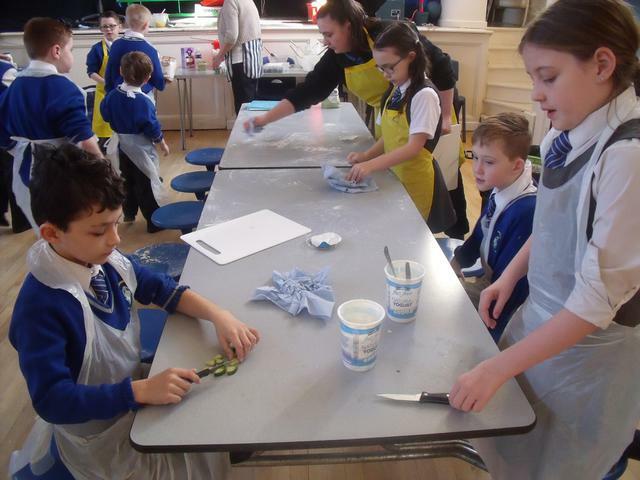 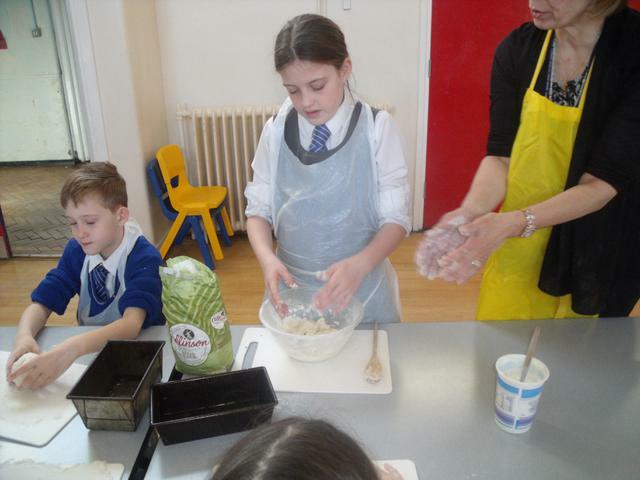 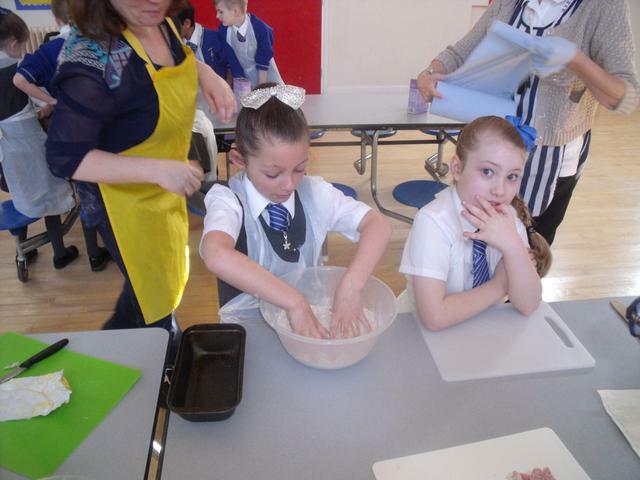 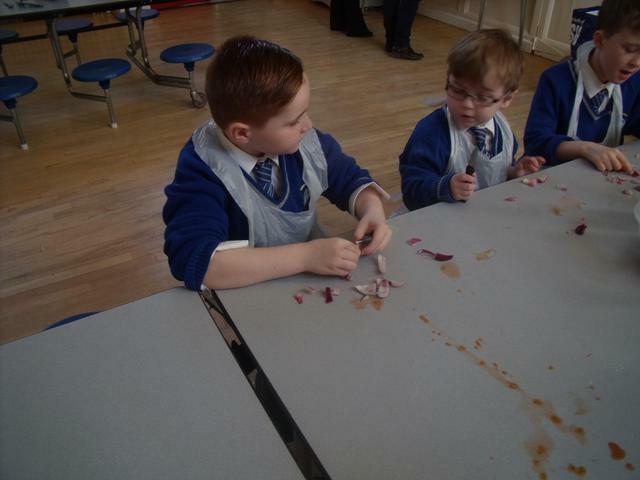 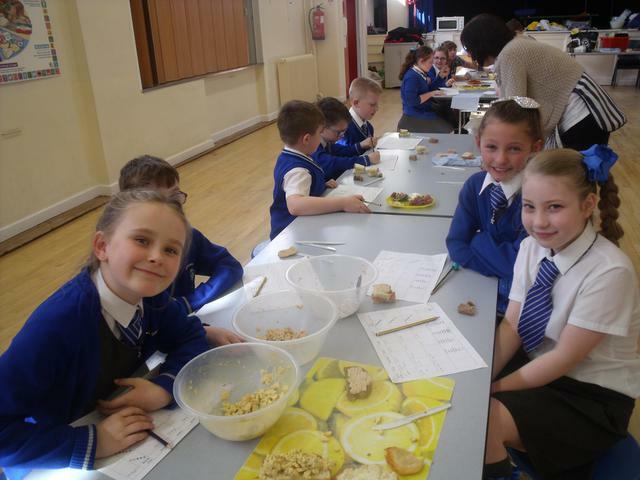 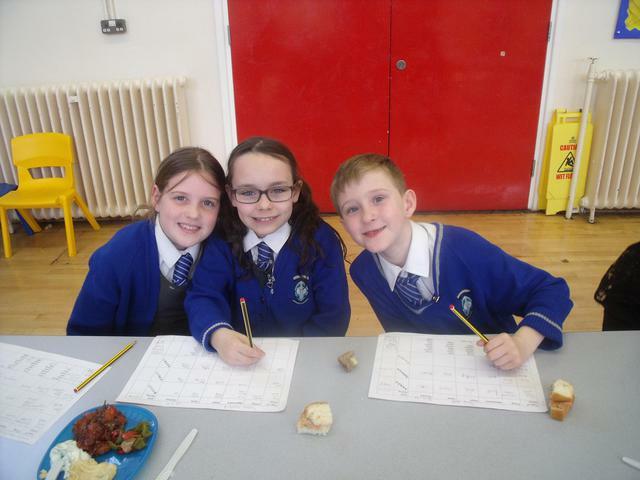 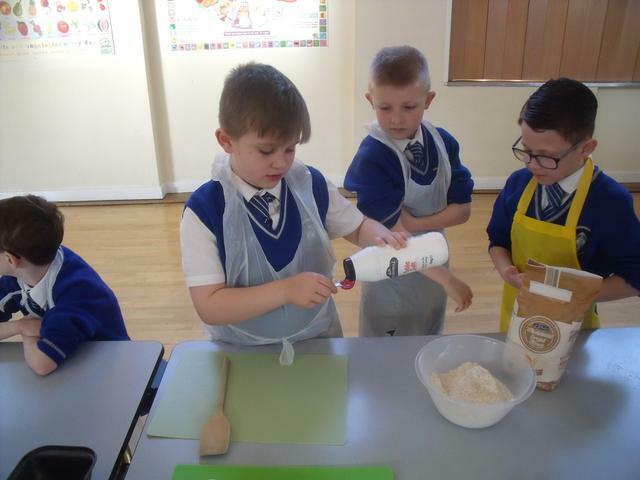 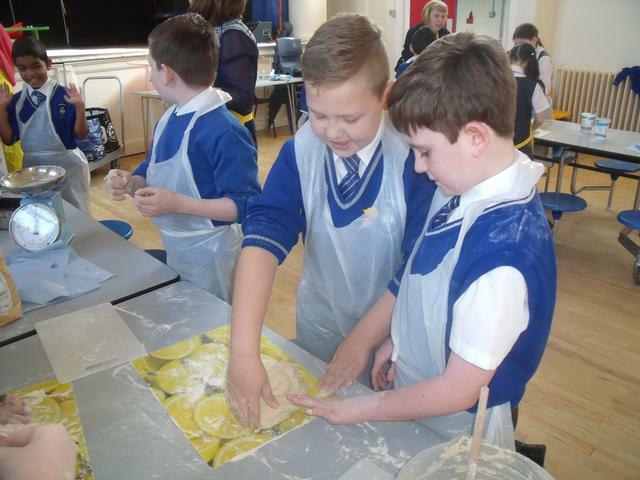 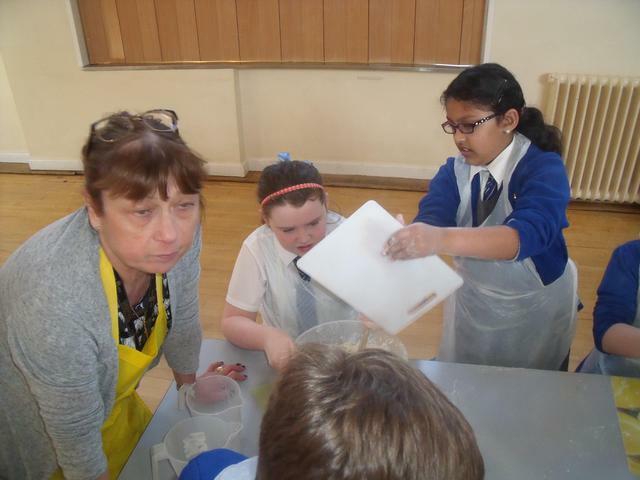 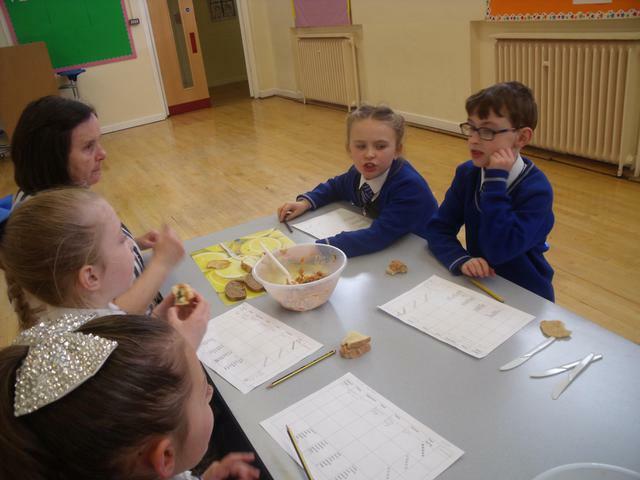 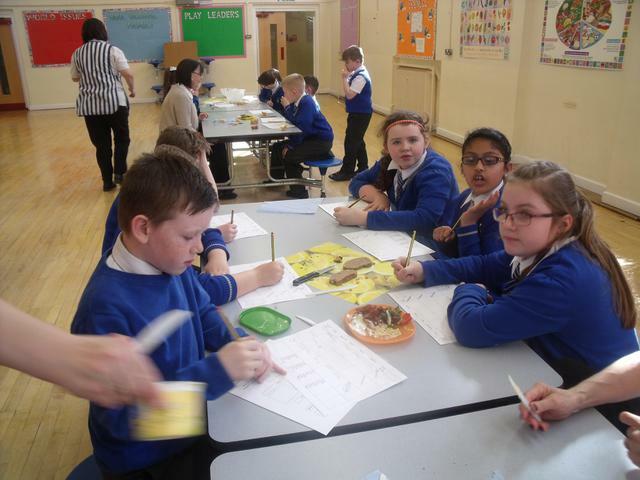 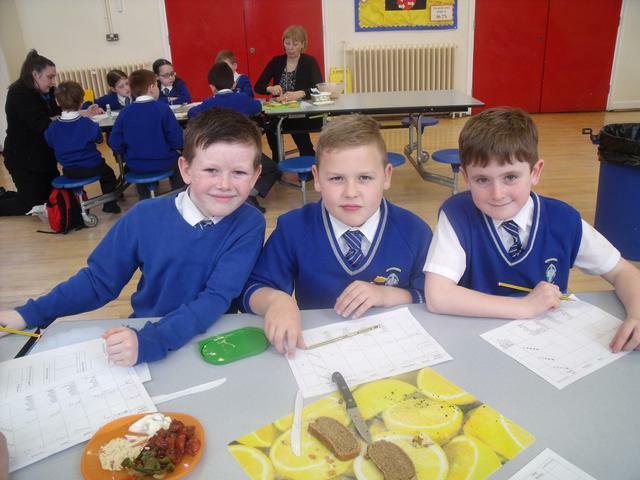 They also made toppings including tuna and mayonnaise, tuna and sweetcorn, salmon and cucumber, Coronation chicken and tomato and red onion topping. 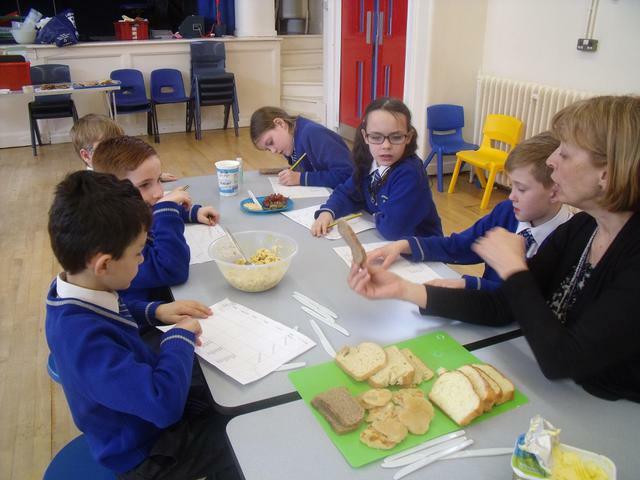 They made the bread and toppings in the morning and then in the afternoon they prepared and ate their sandwiches. 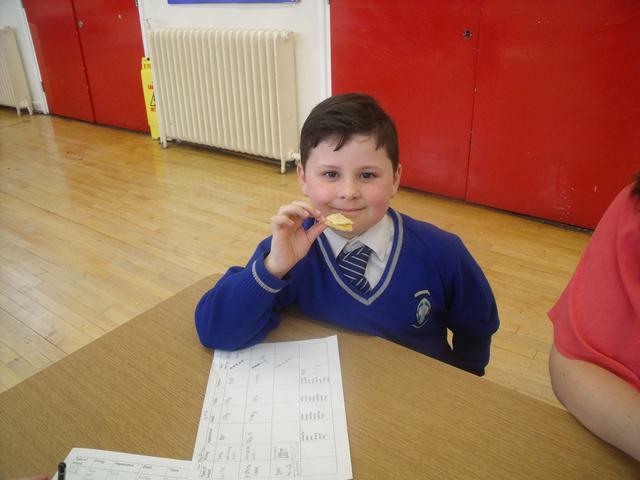 Delicious!!!!!! 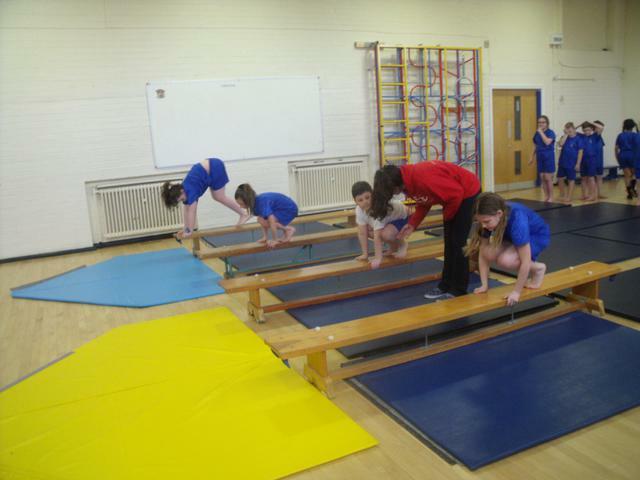 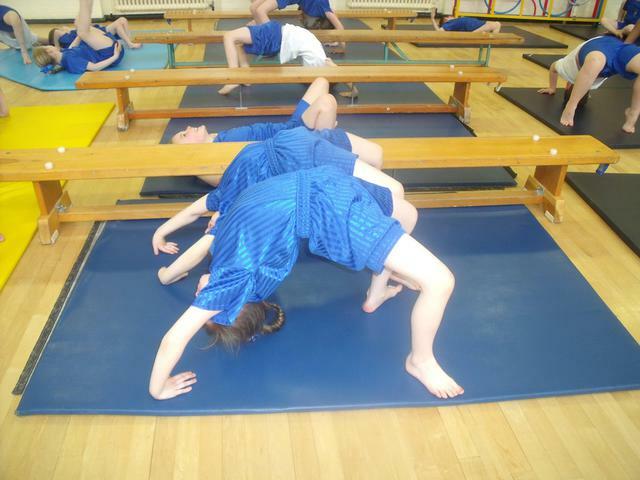 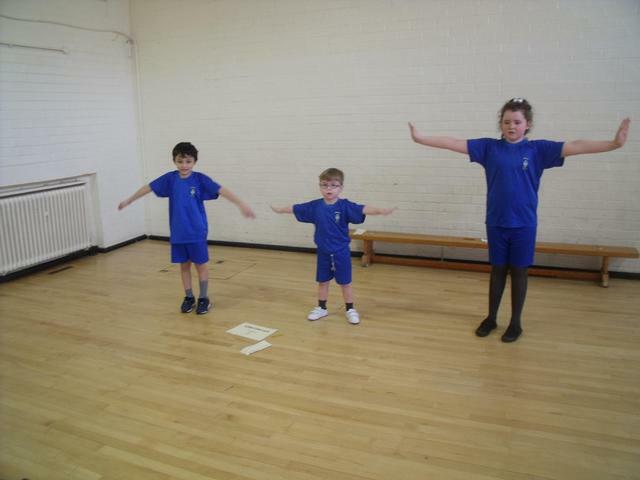 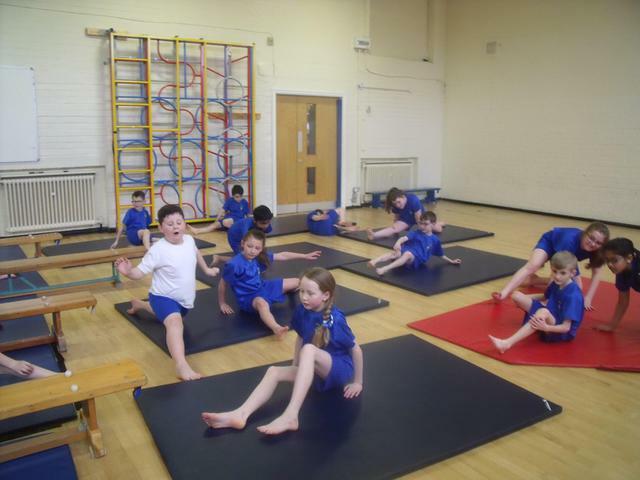 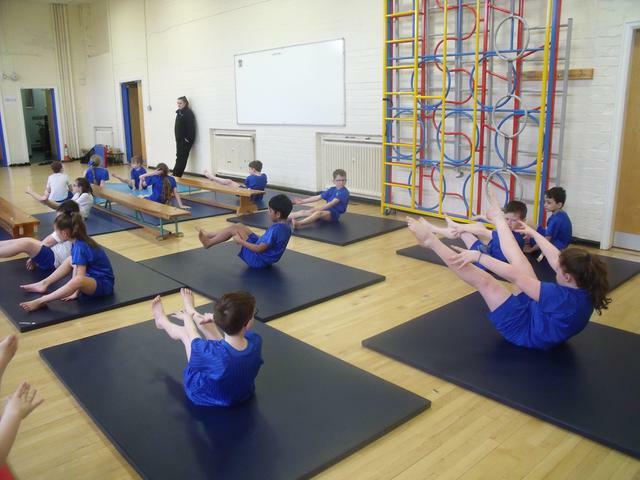 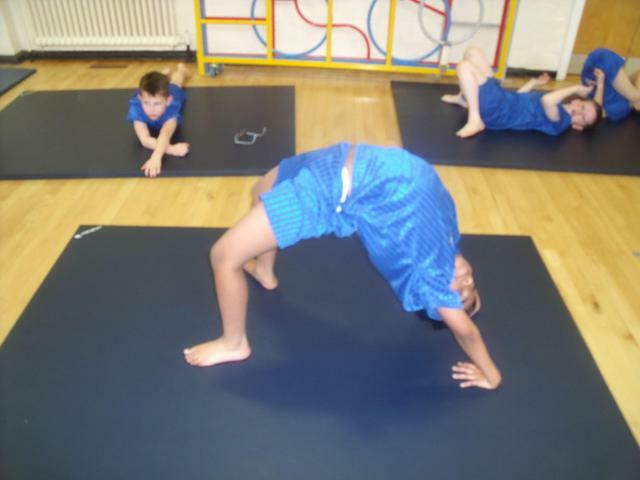 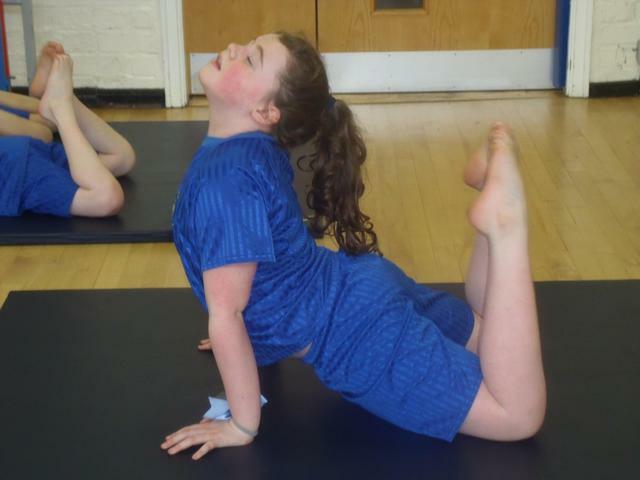 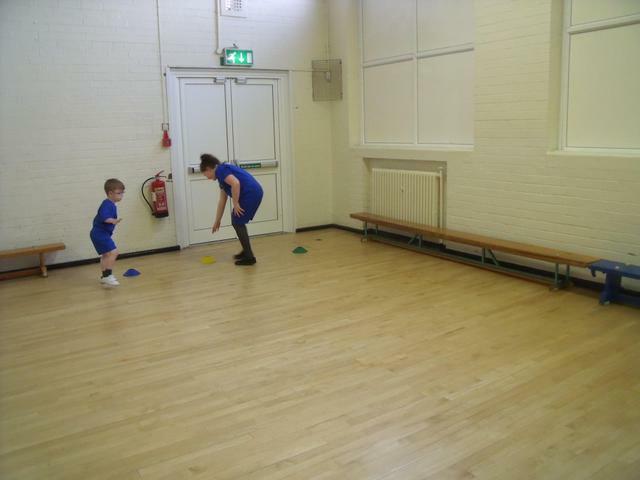 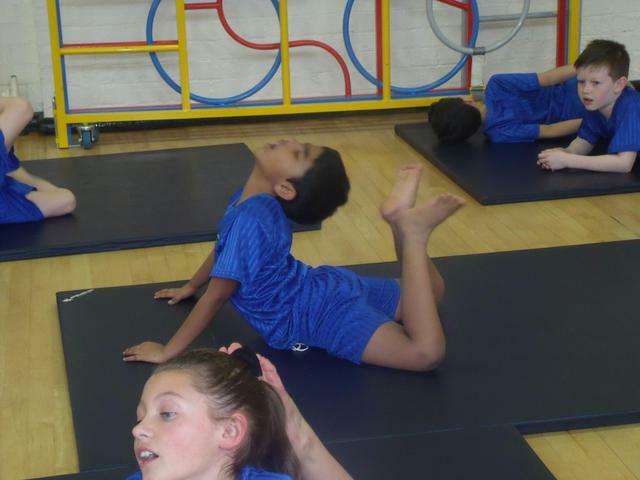 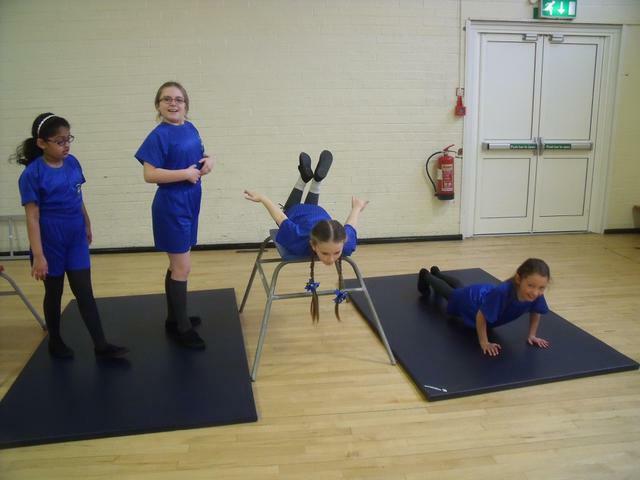 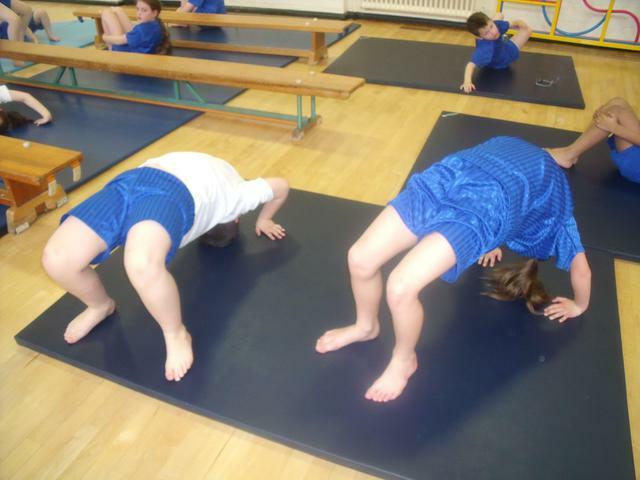 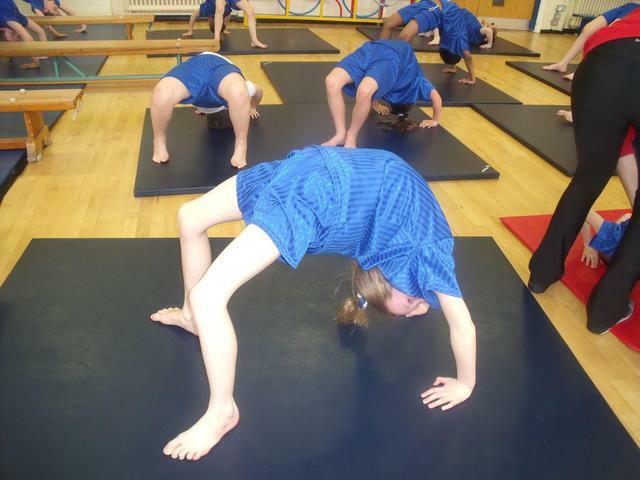 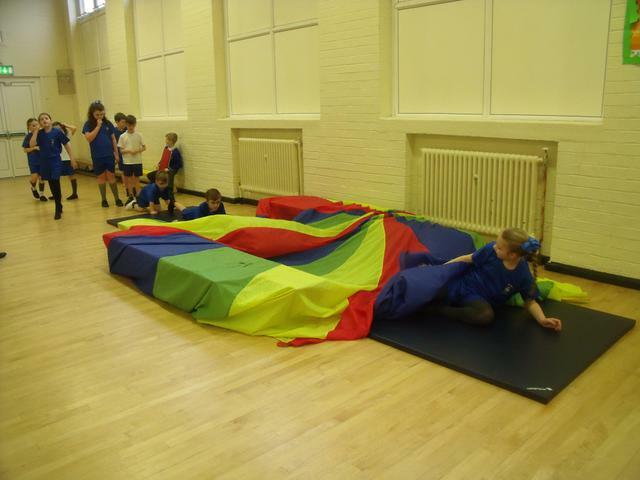 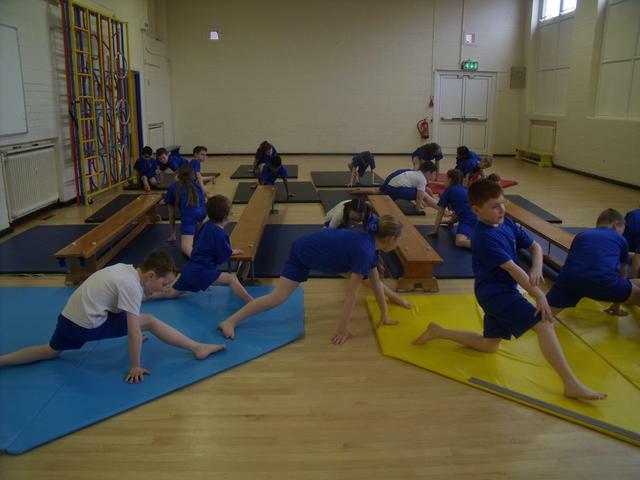 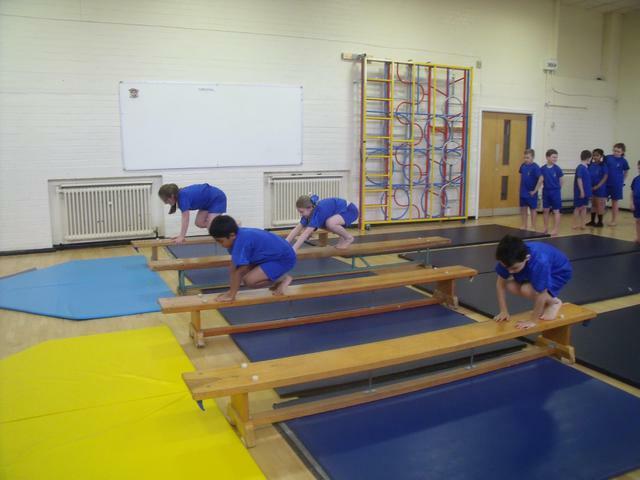 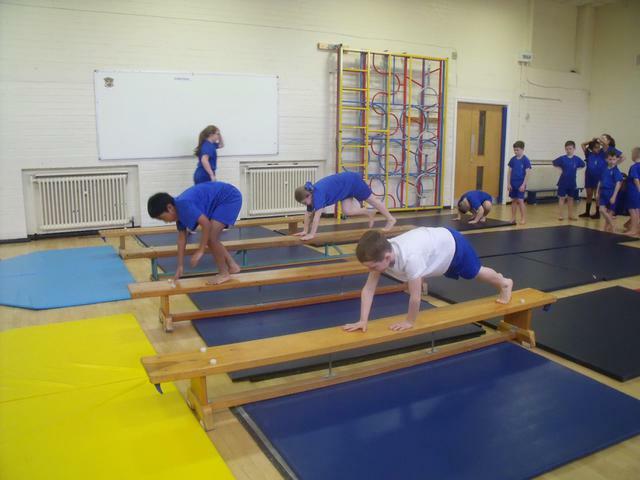 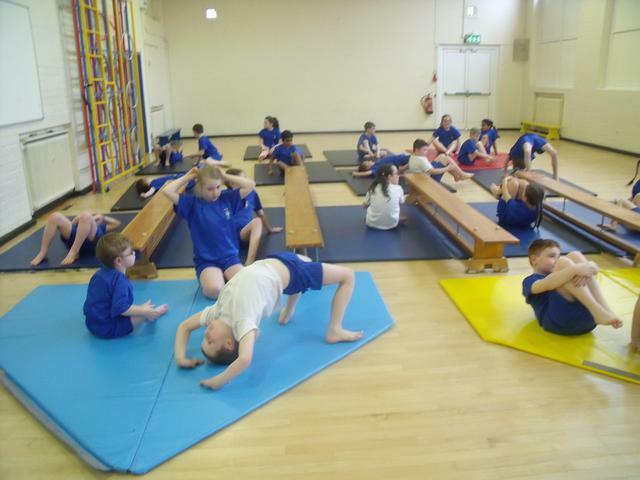 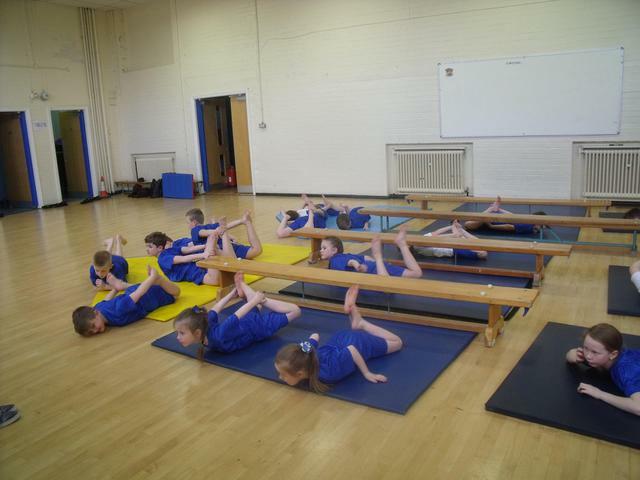 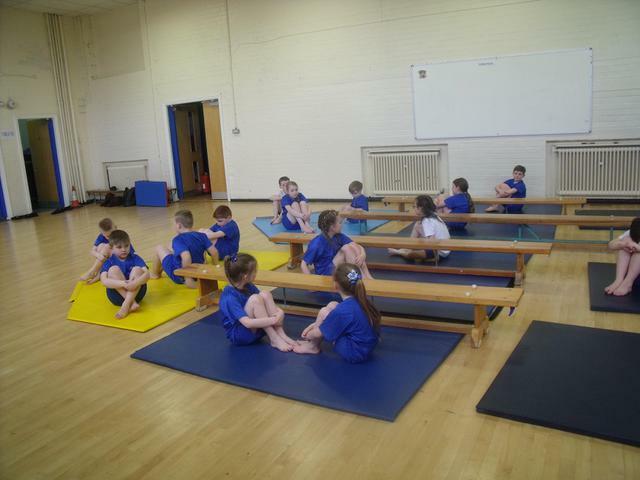 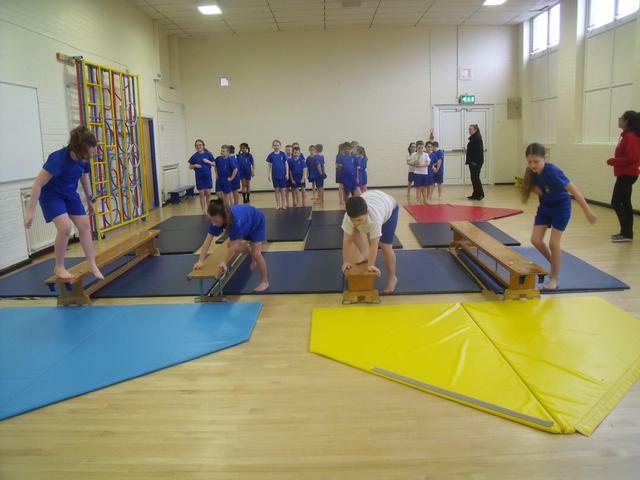 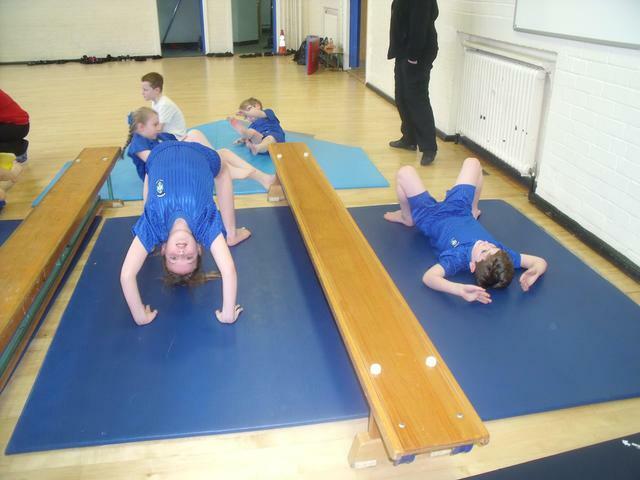 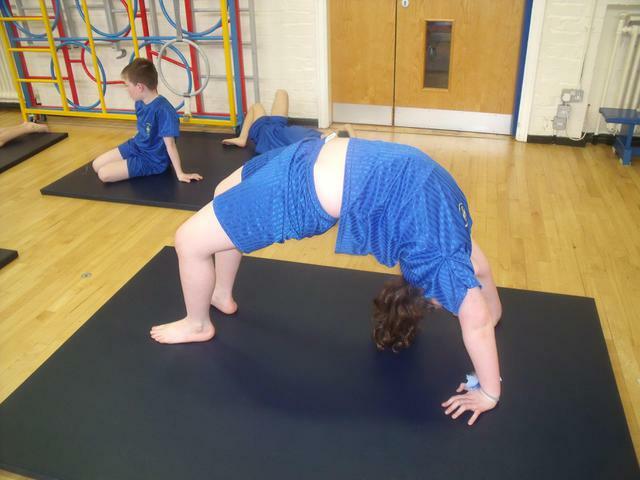 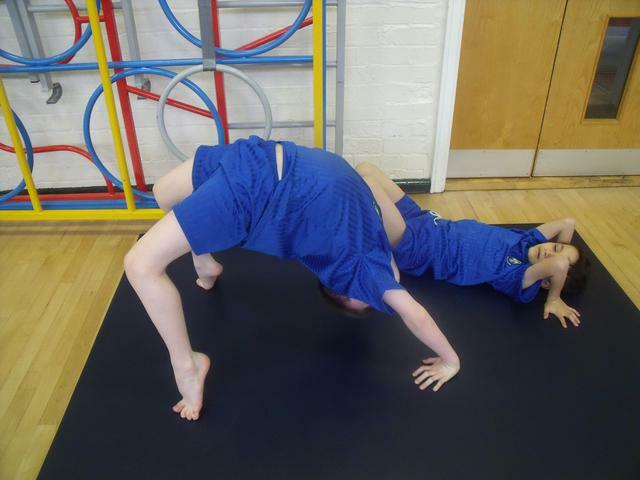 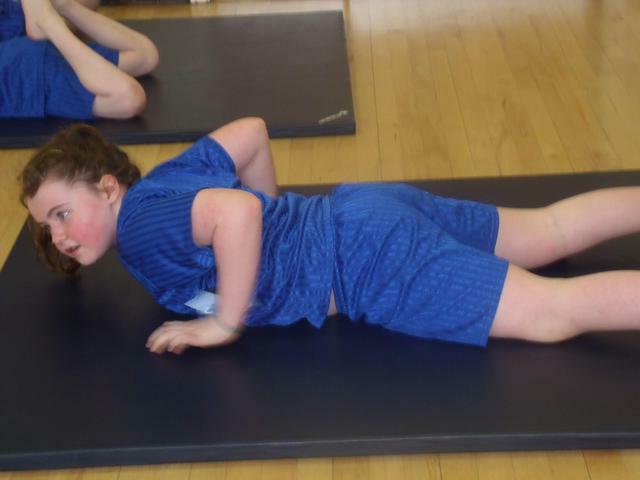 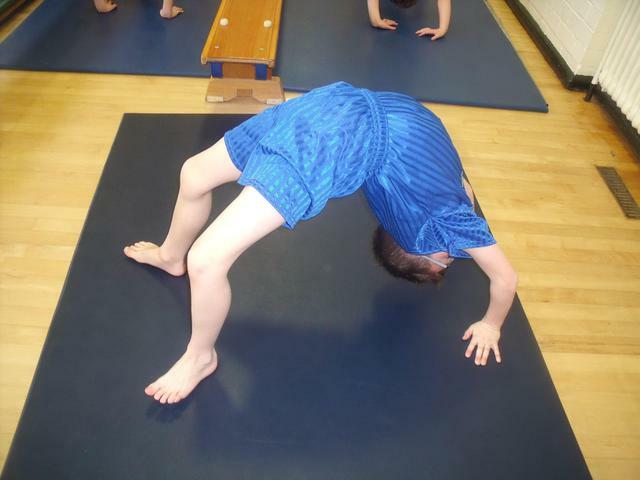 The children have been taking part in Gymnastics lesson with Nicky. 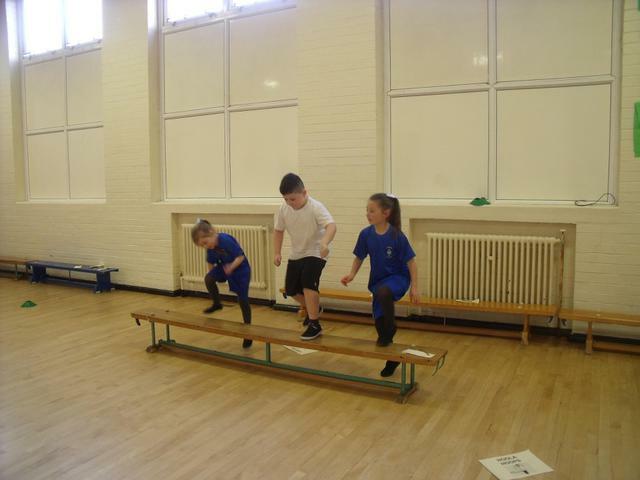 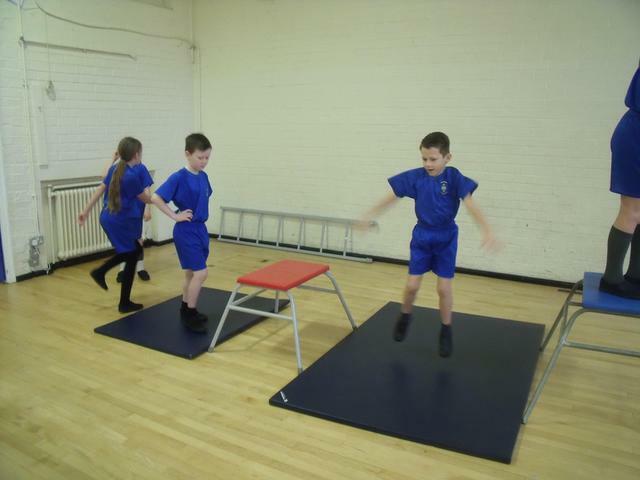 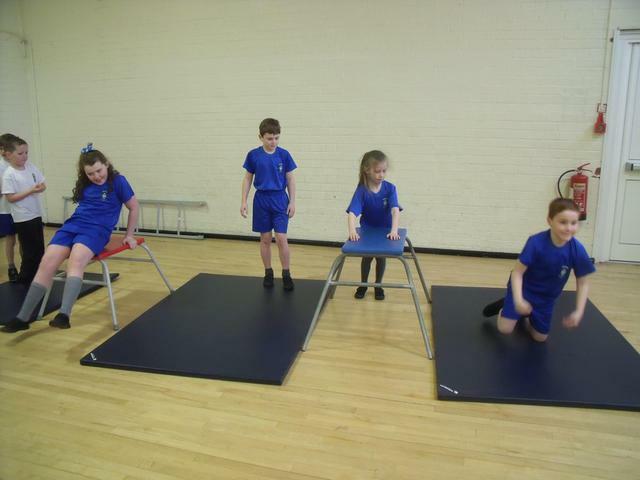 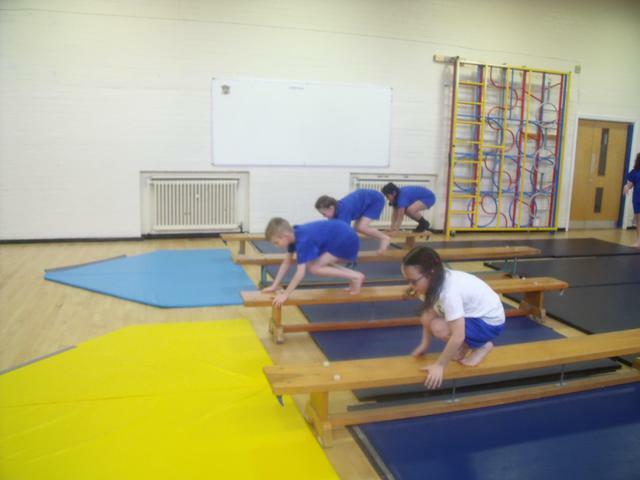 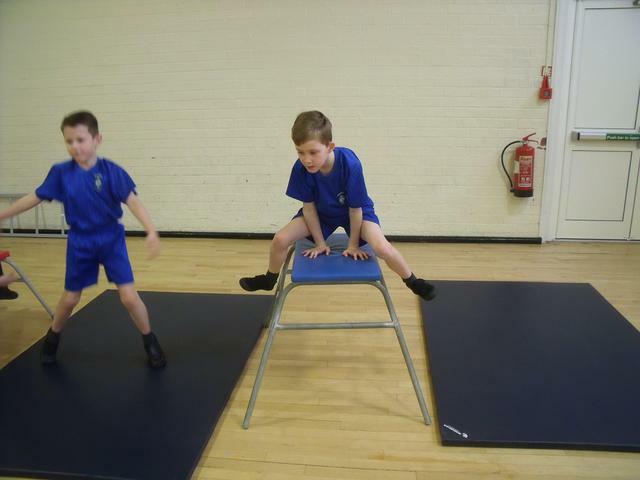 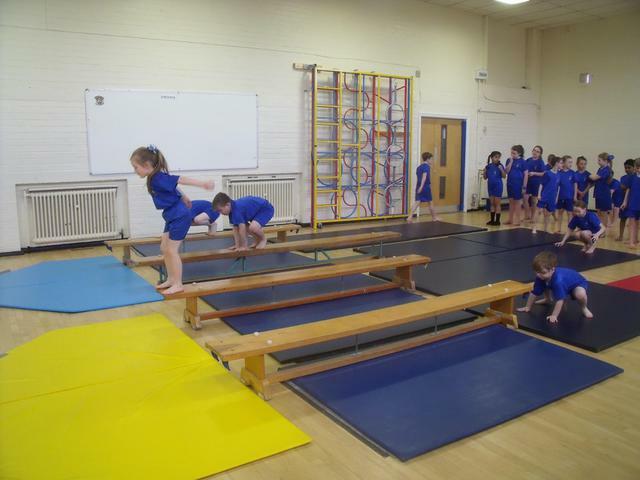 They are learning how to balance, stretch and hold different shapes-pike, tuck, squat, jump onto and off equipment correctly as well as practicing forward rolls and making a bridge. 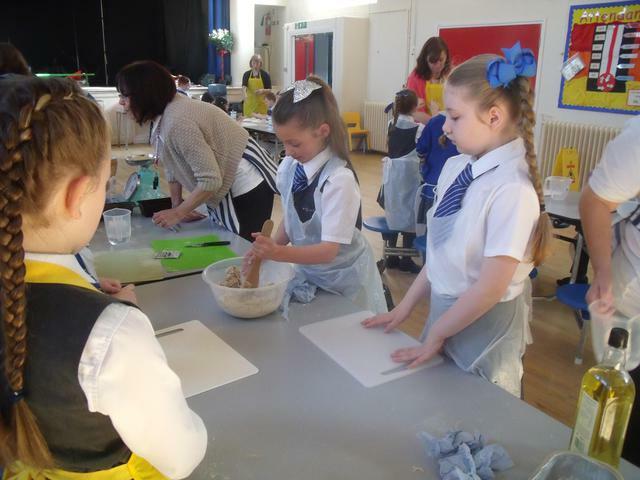 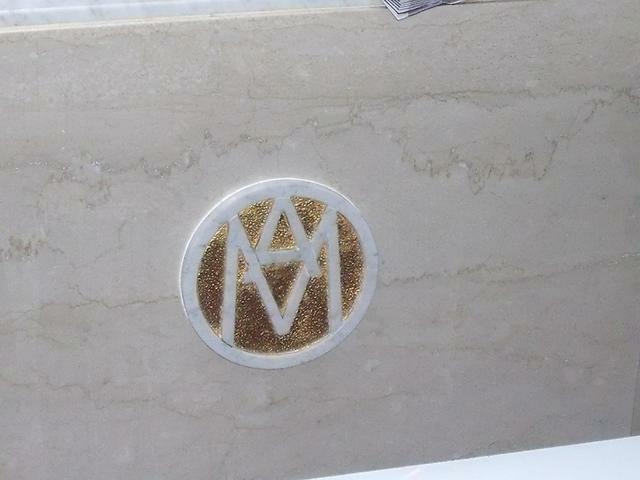 They are improving every week! 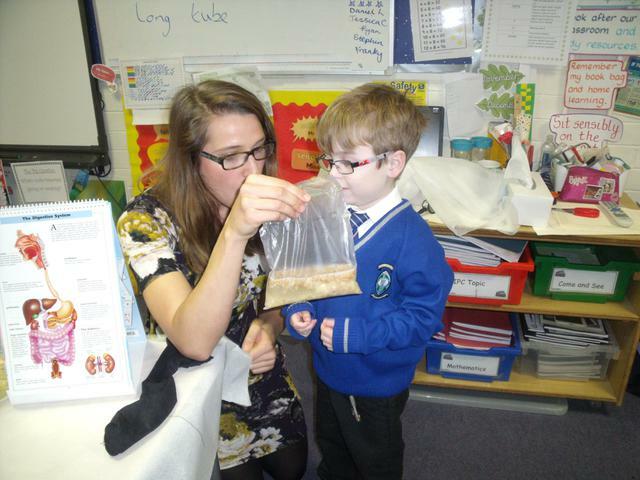 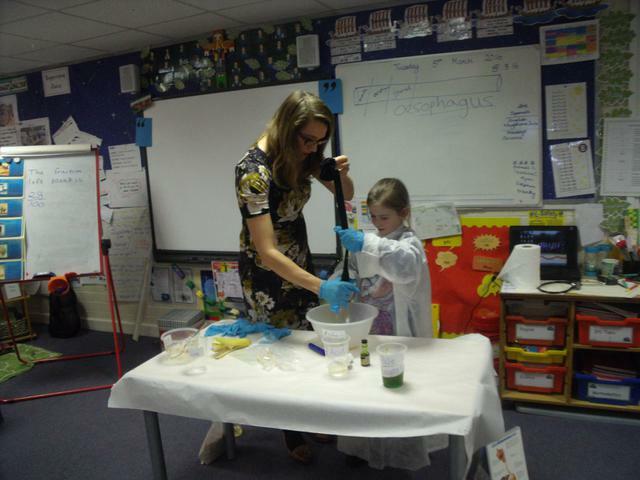 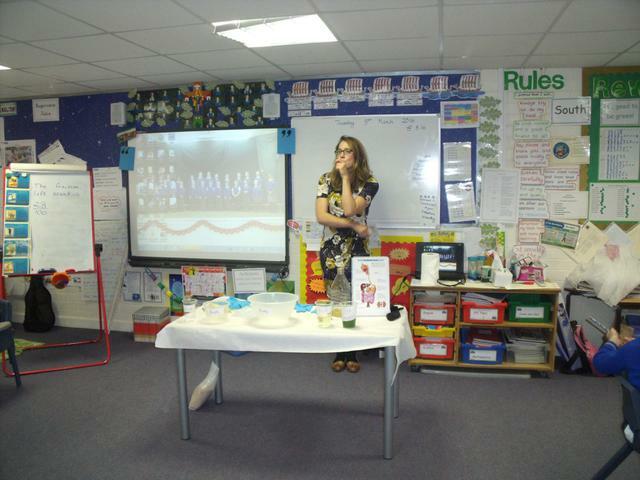 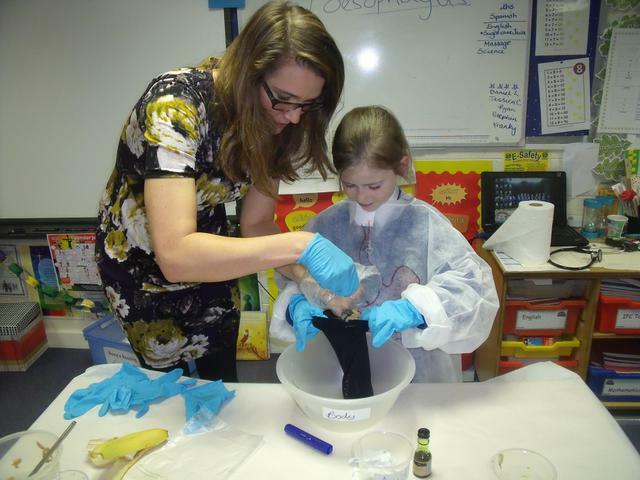 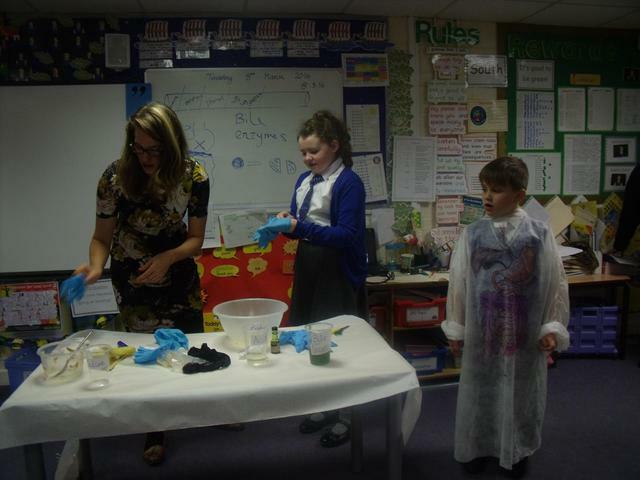 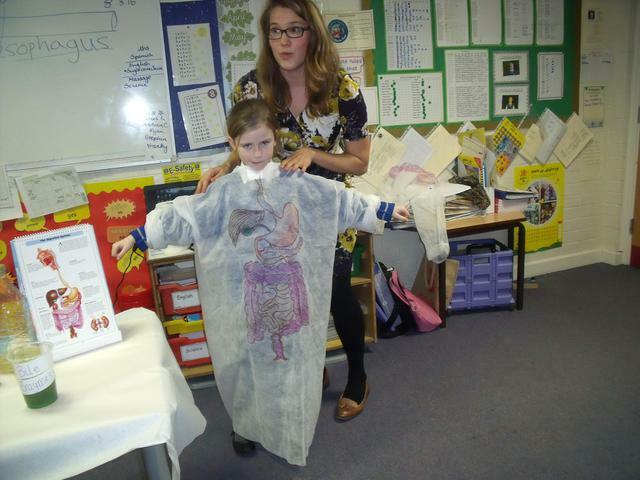 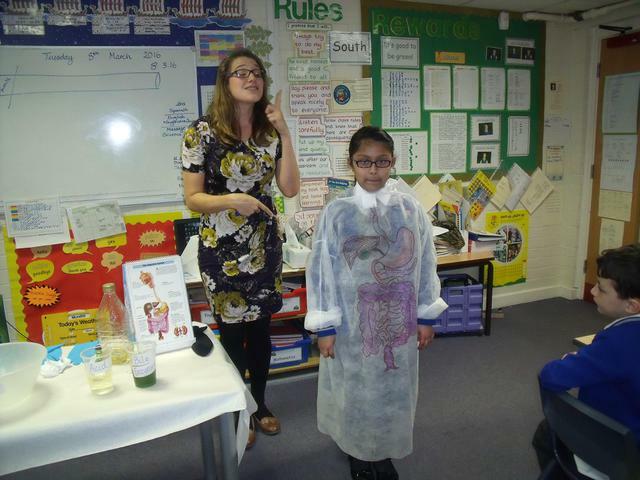 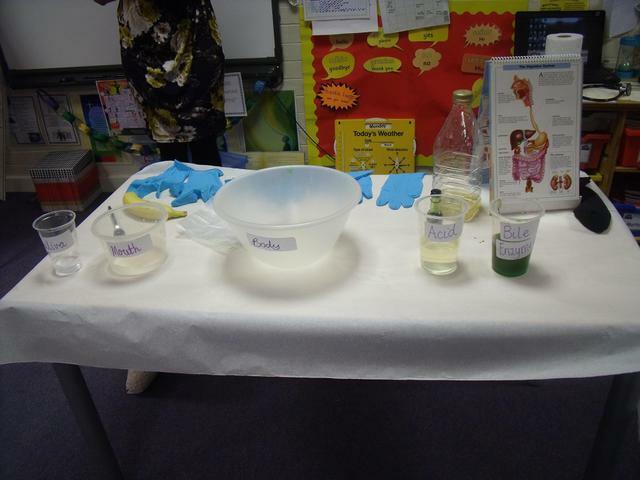 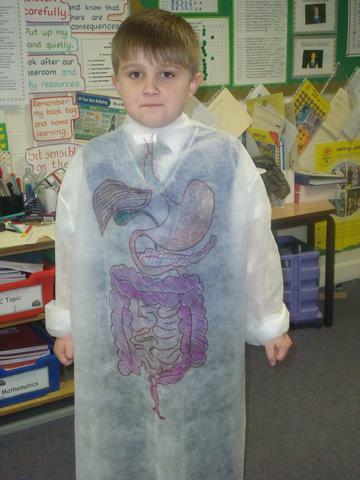 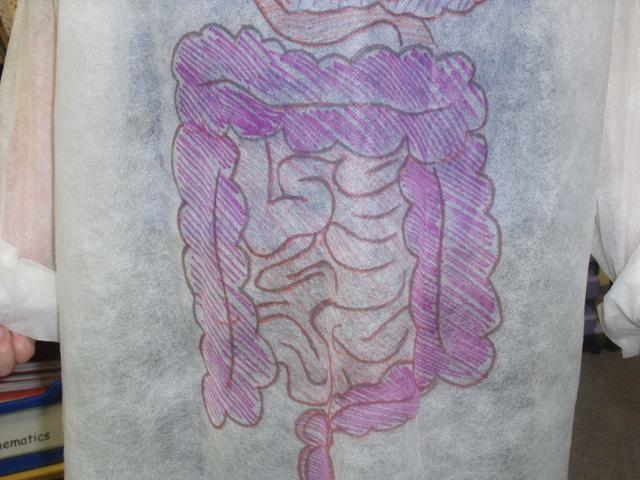 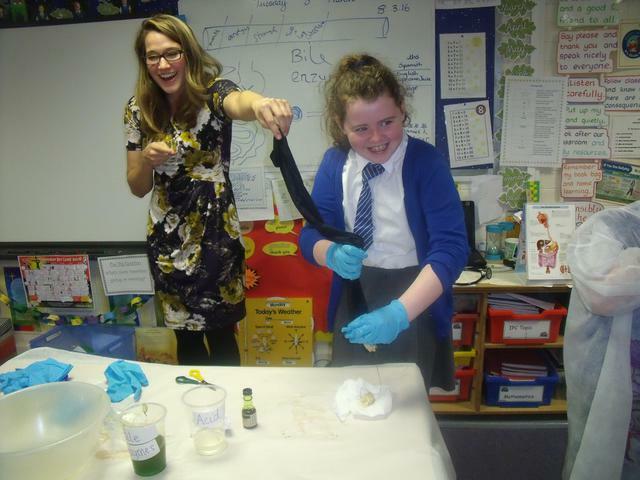 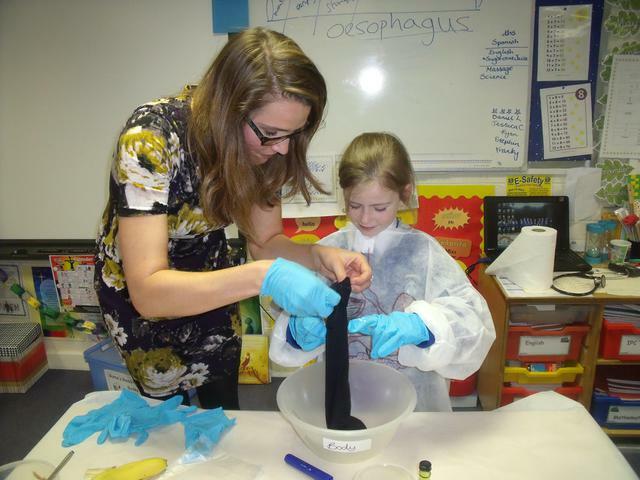 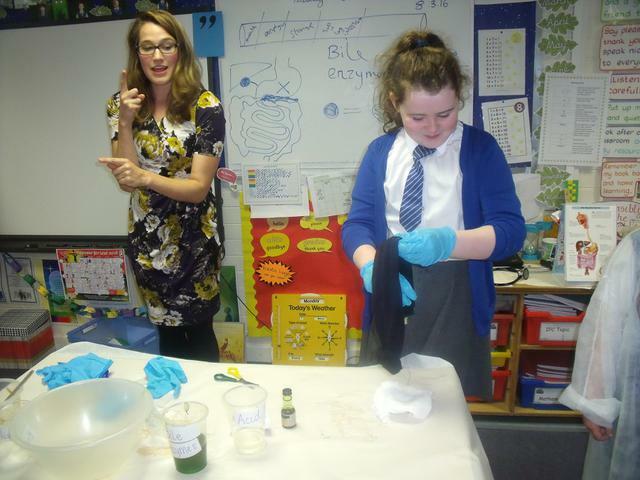 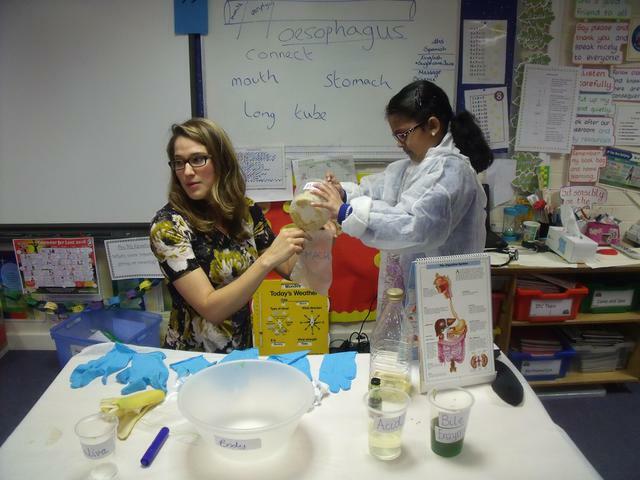 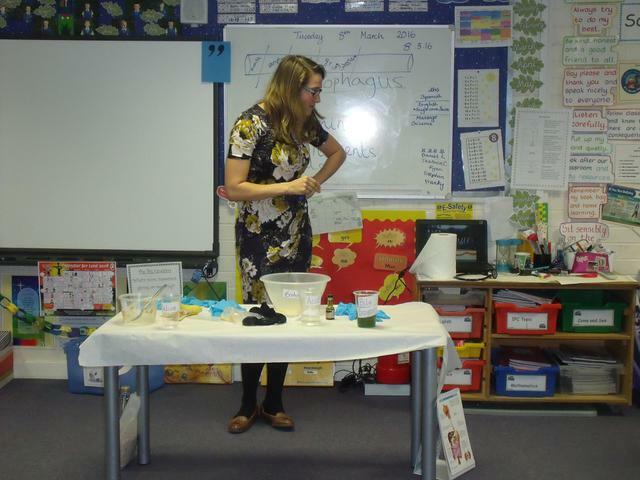 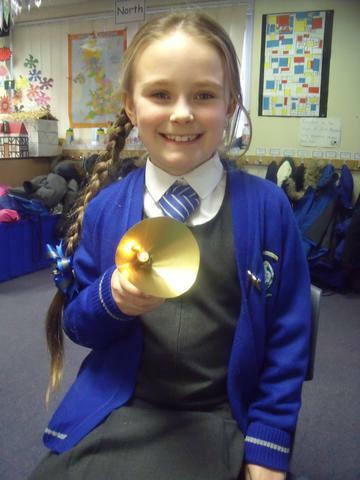 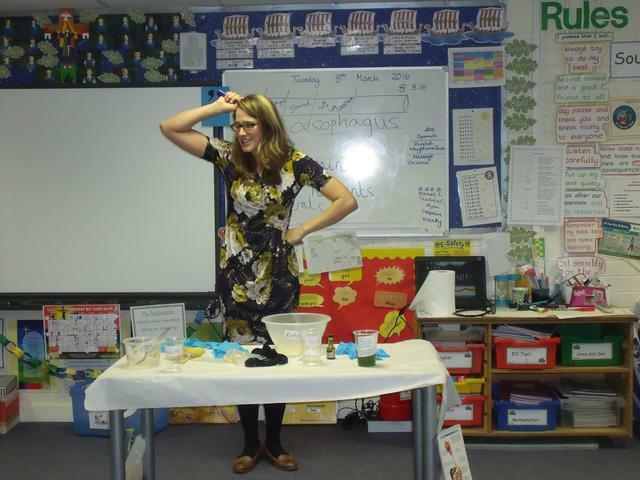 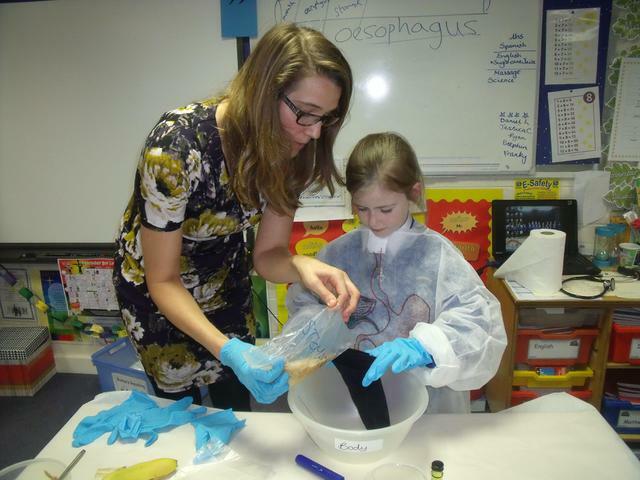 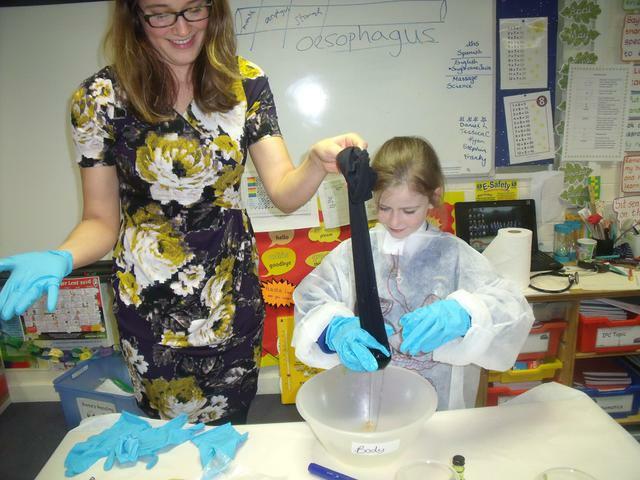 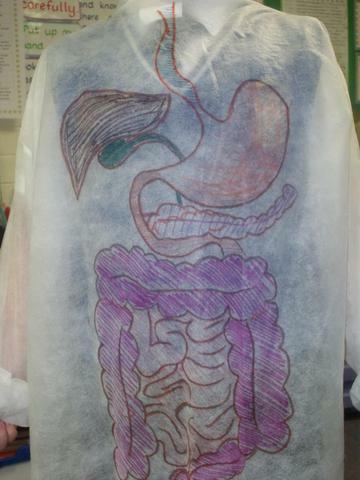 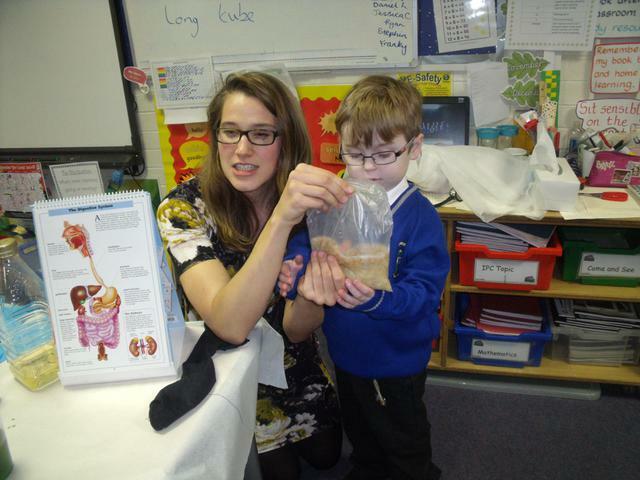 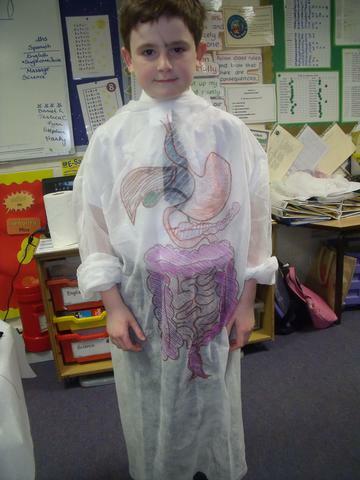 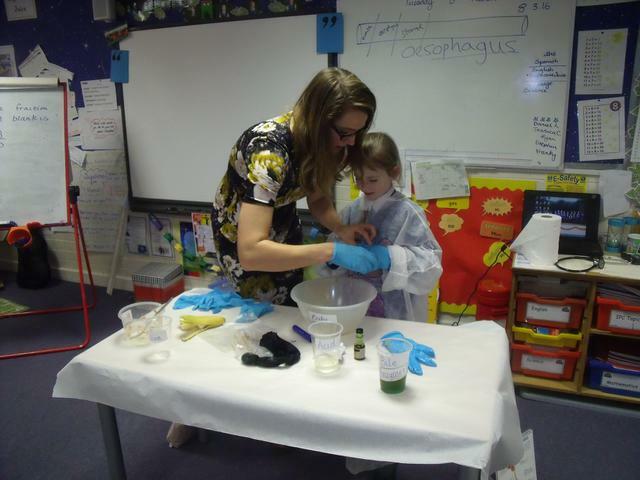 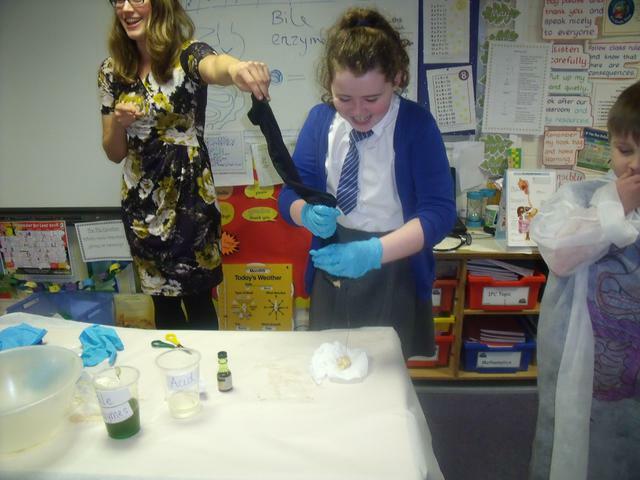 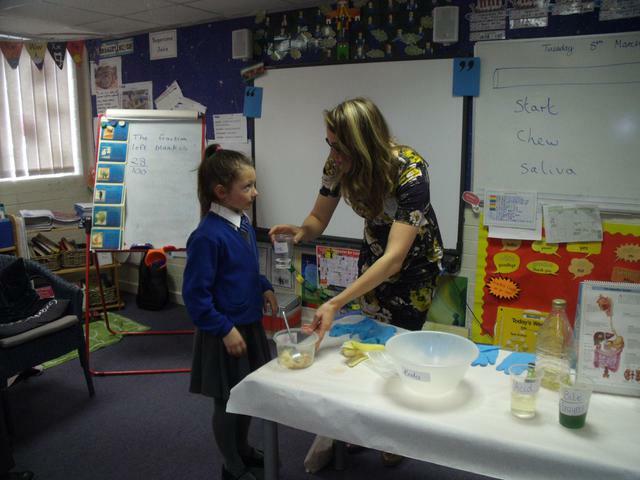 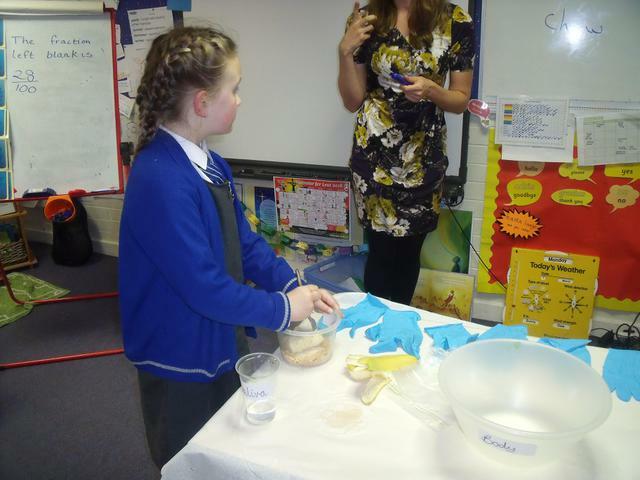 Doctor Alice came to school to help the children investigate and explore the Digestive System. 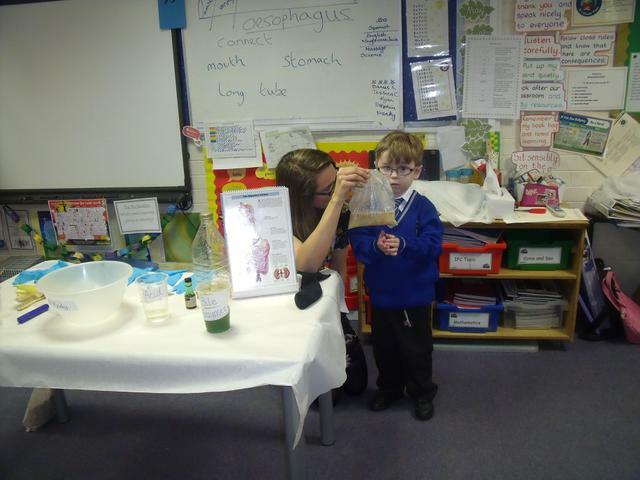 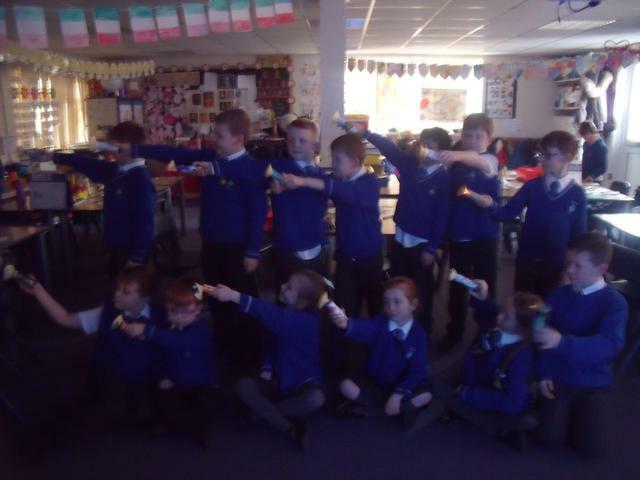 The children learnt how food travels and is used in our bodies from the moment it enters our mouths to the moment it is flushed down the toilet! 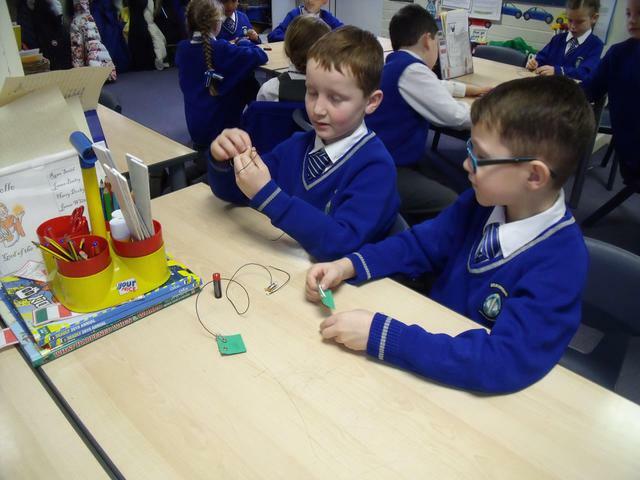 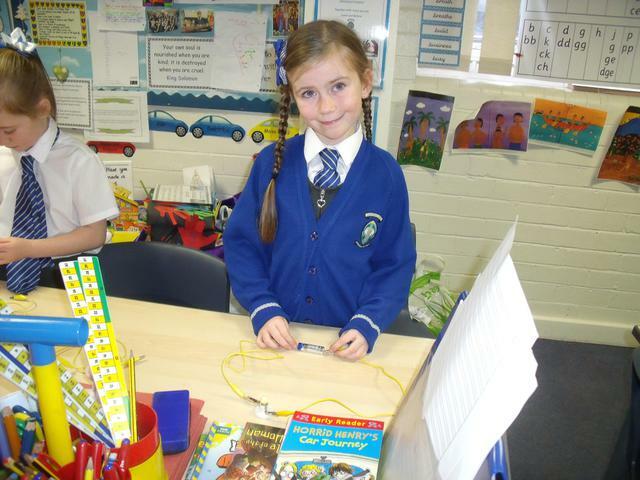 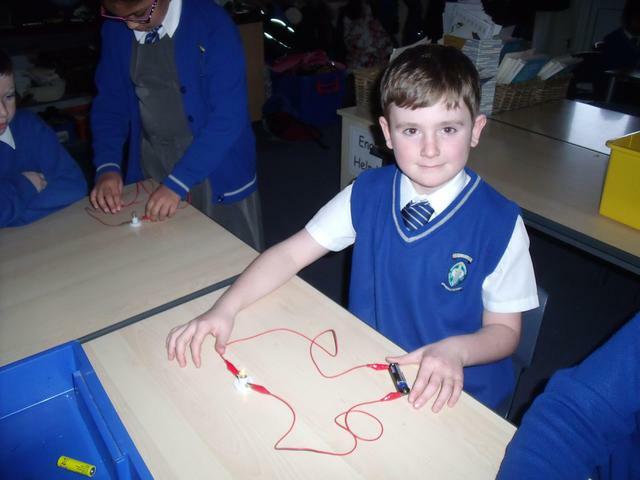 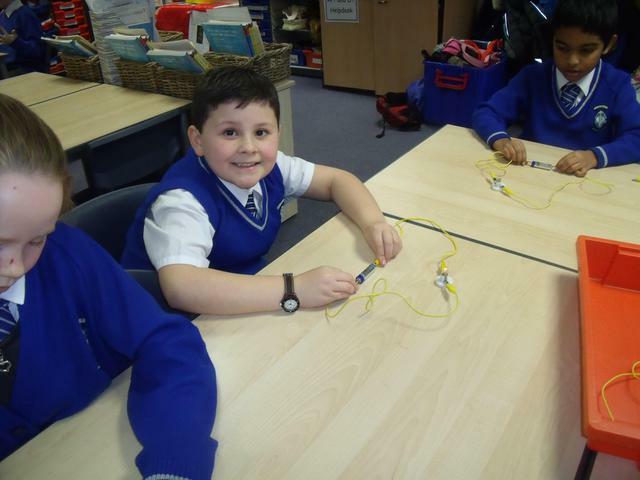 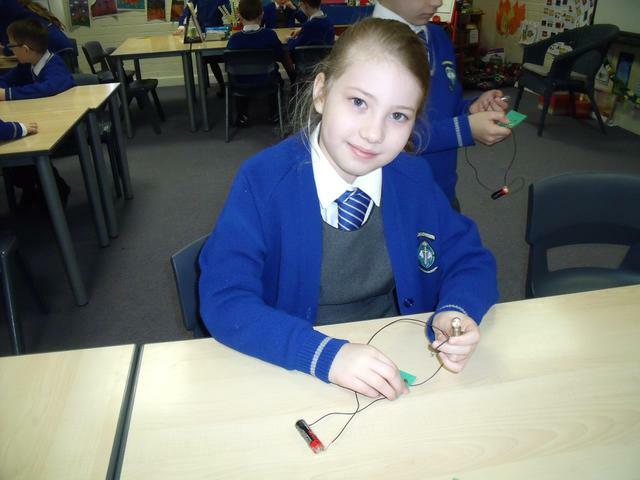 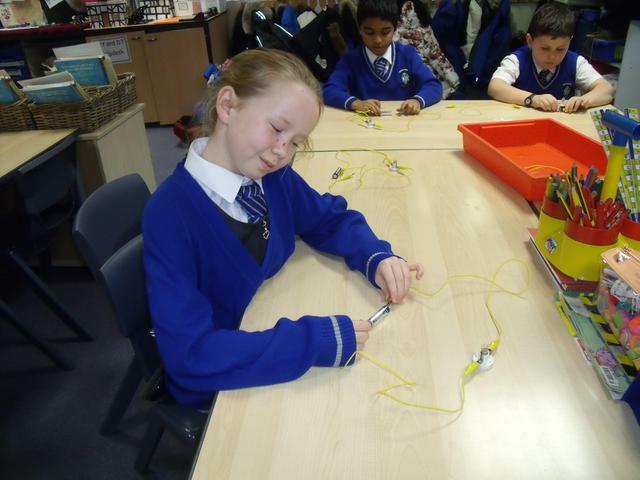 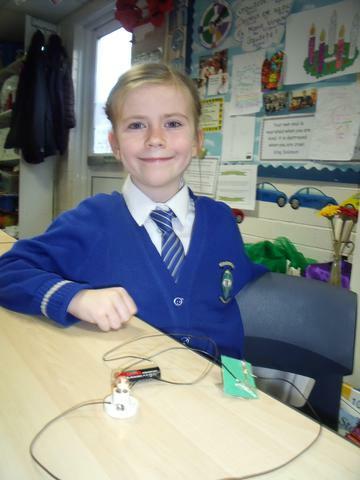 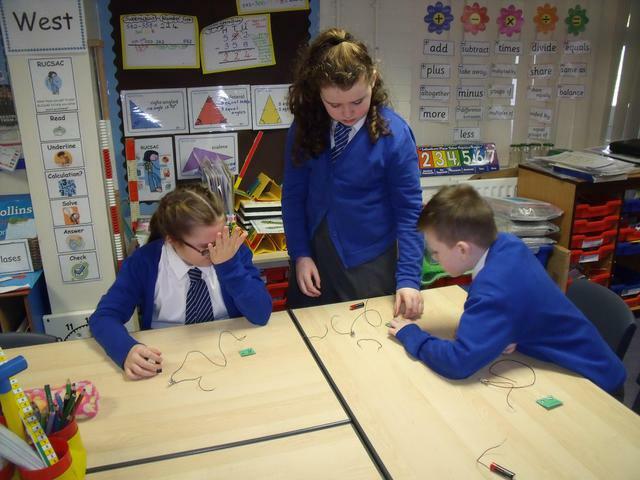 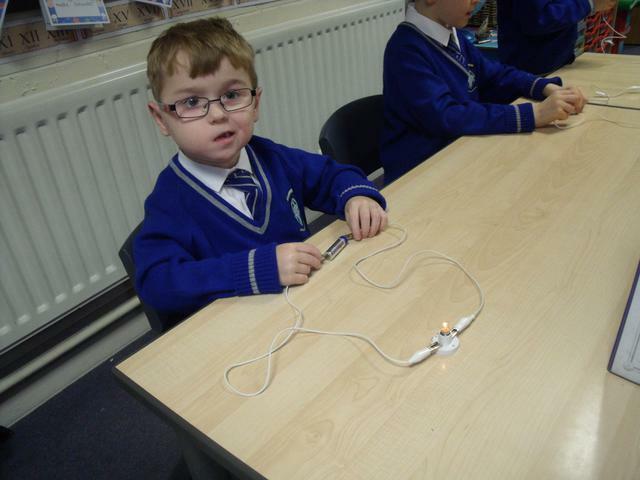 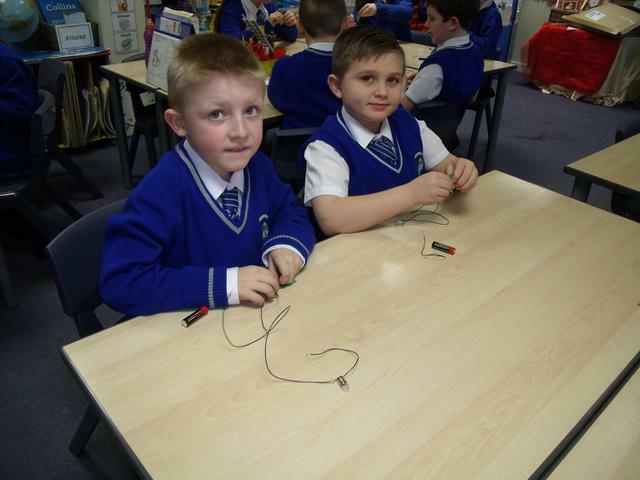 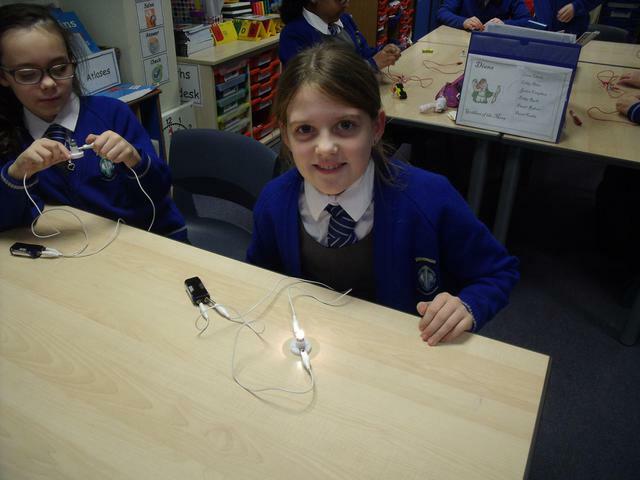 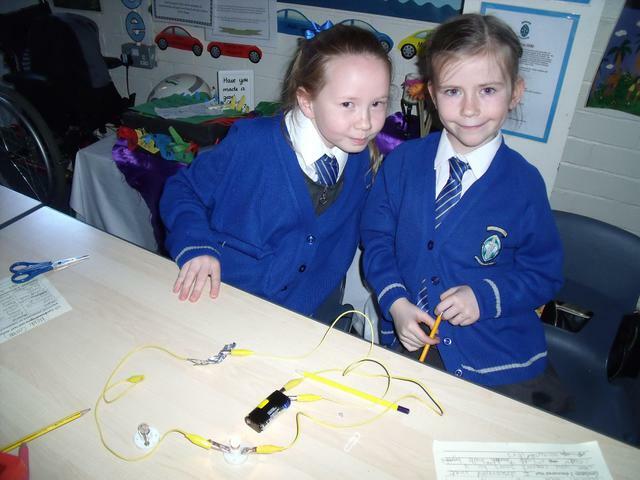 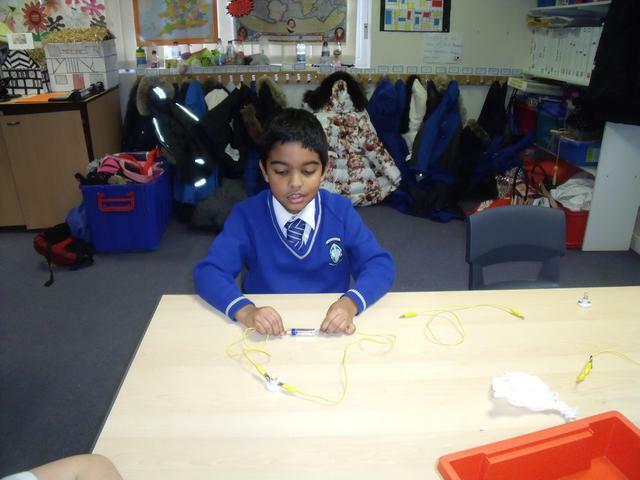 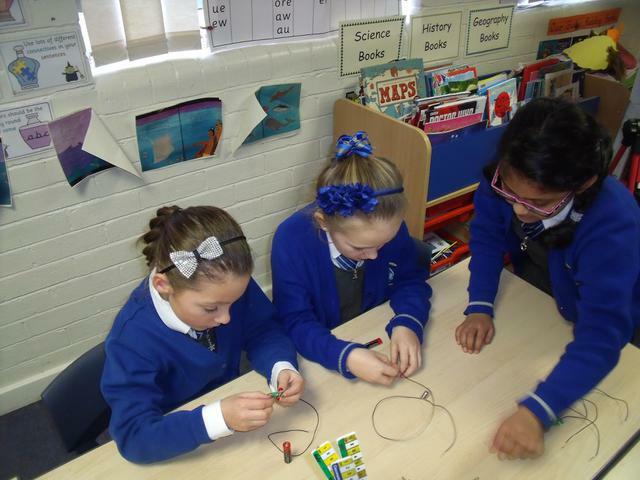 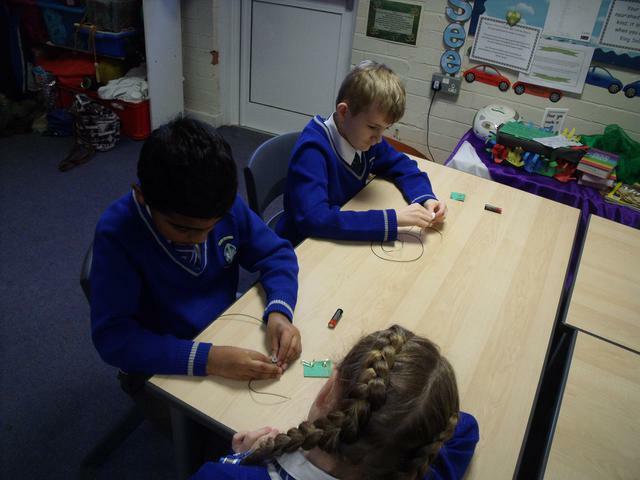 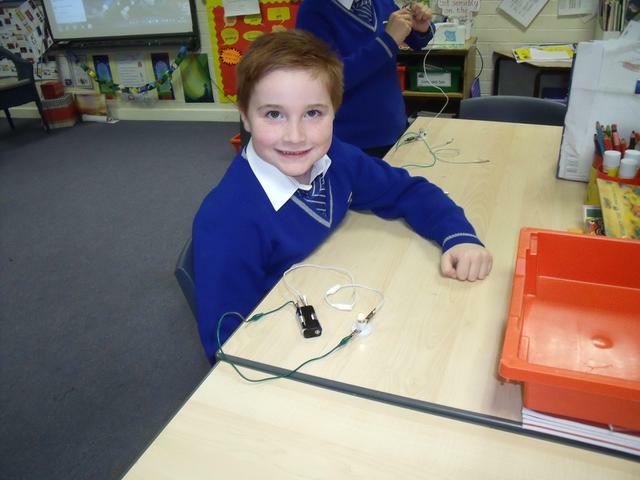 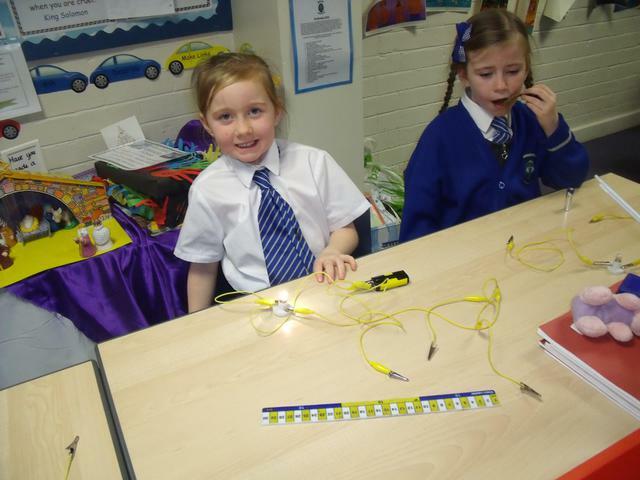 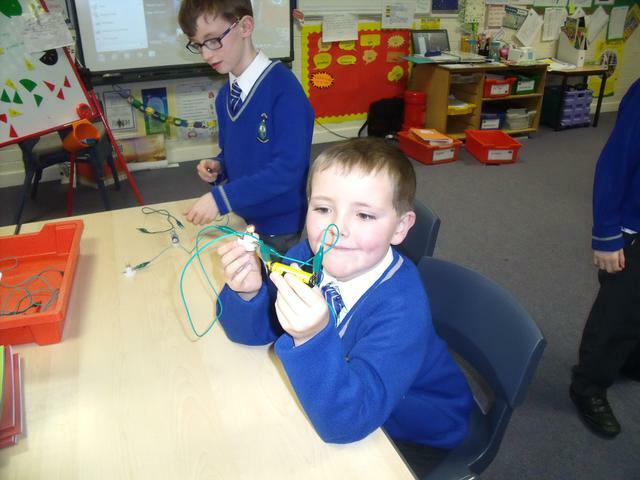 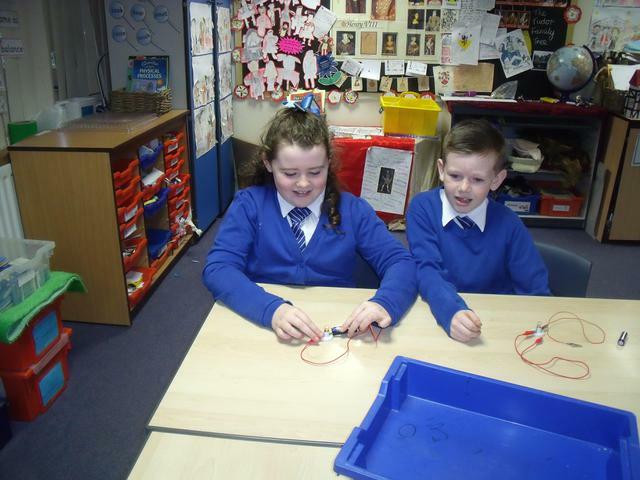 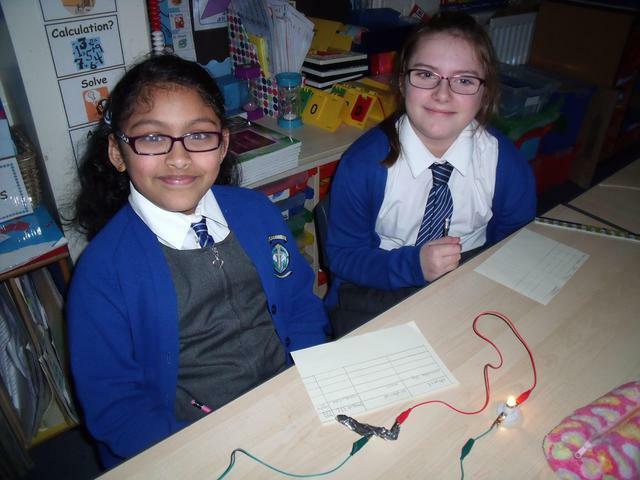 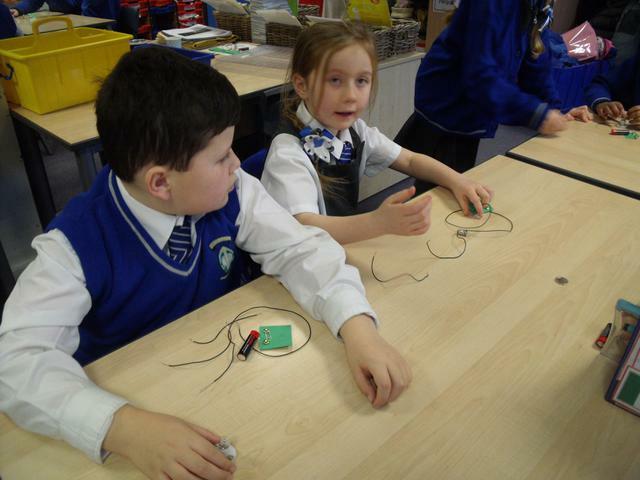 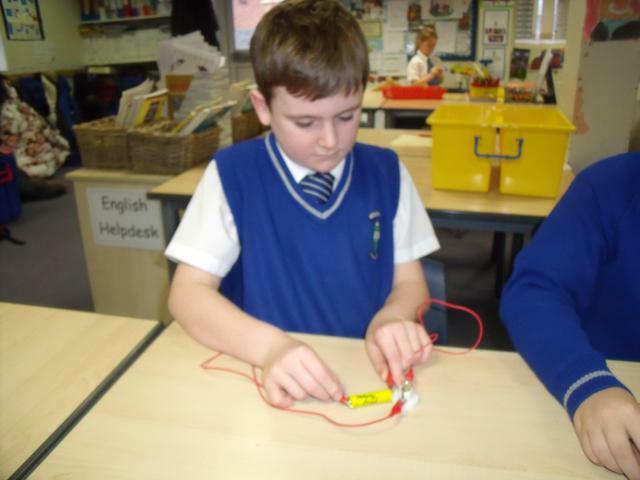 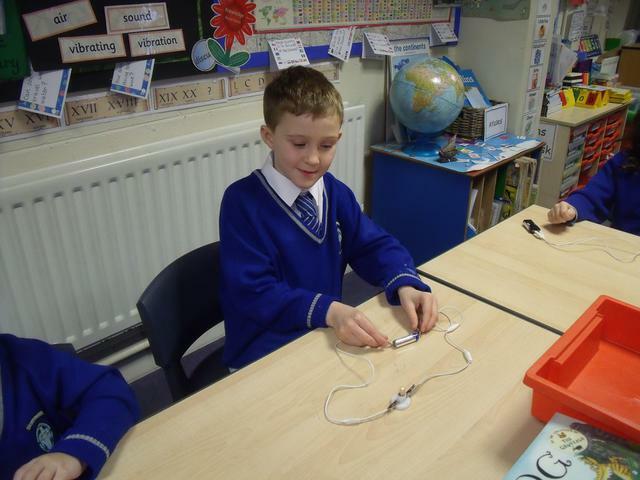 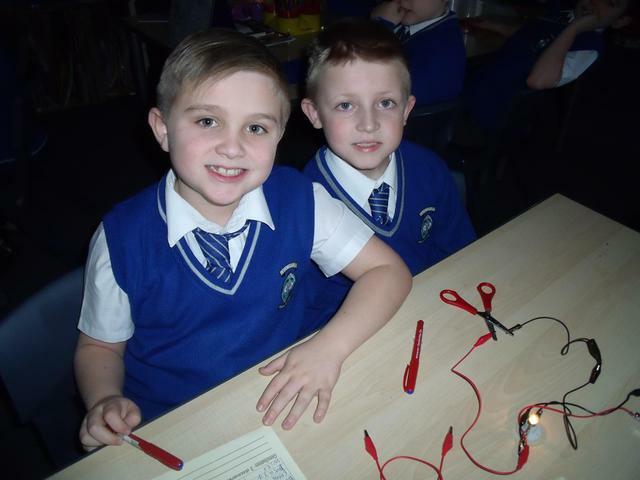 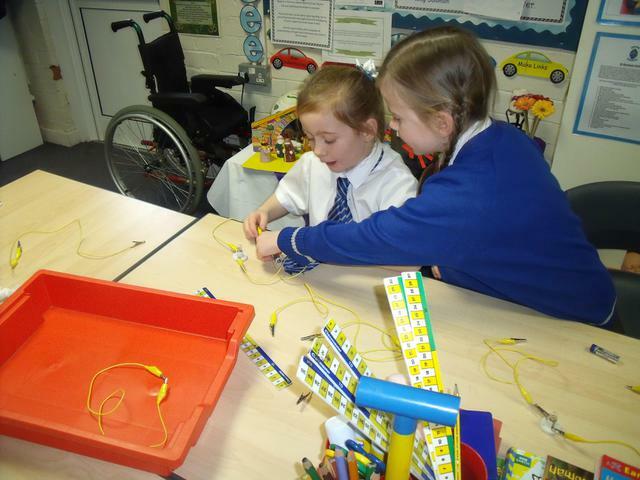 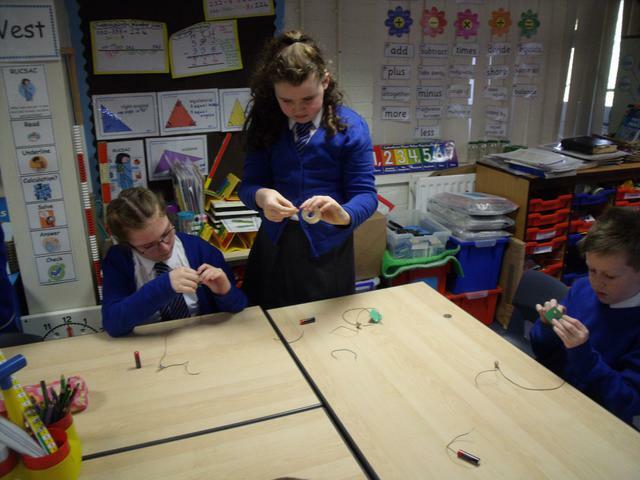 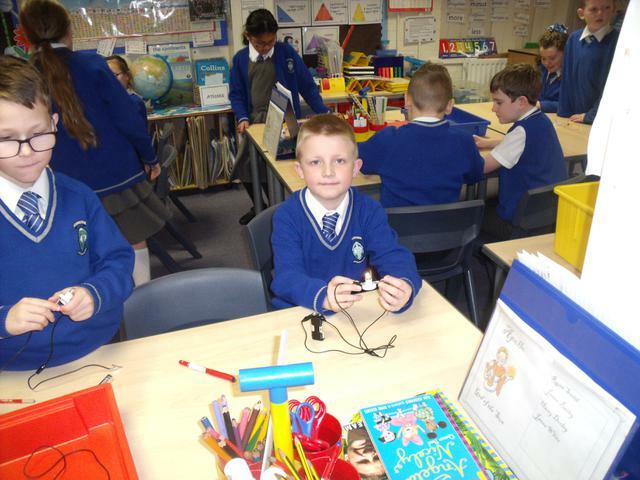 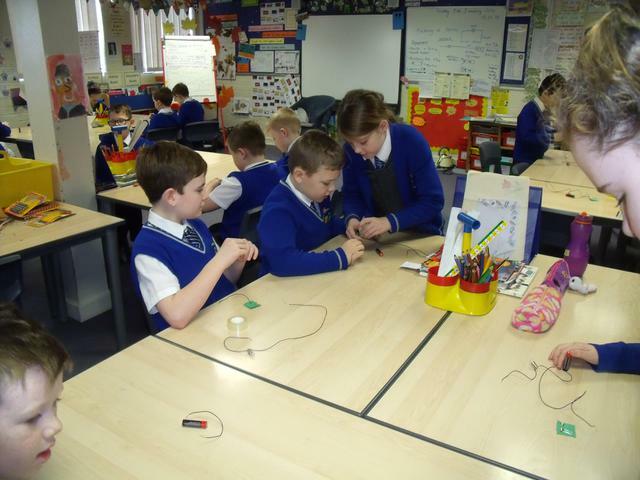 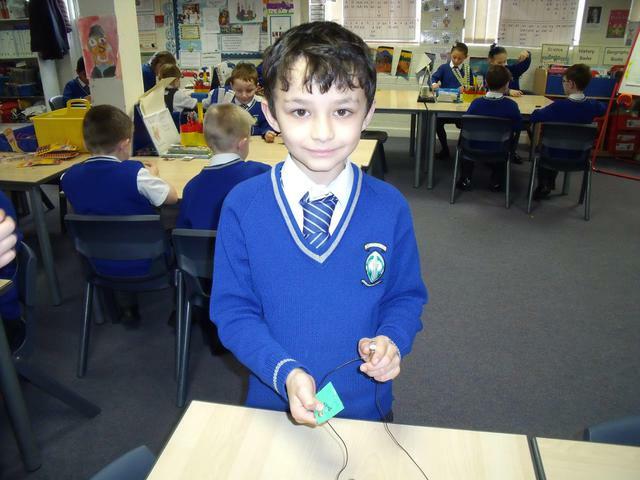 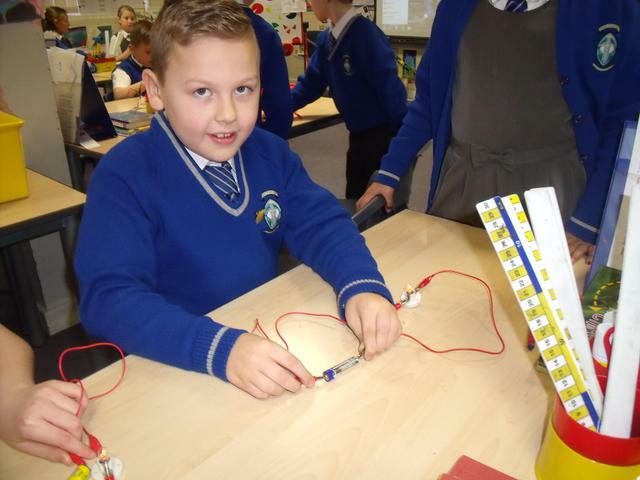 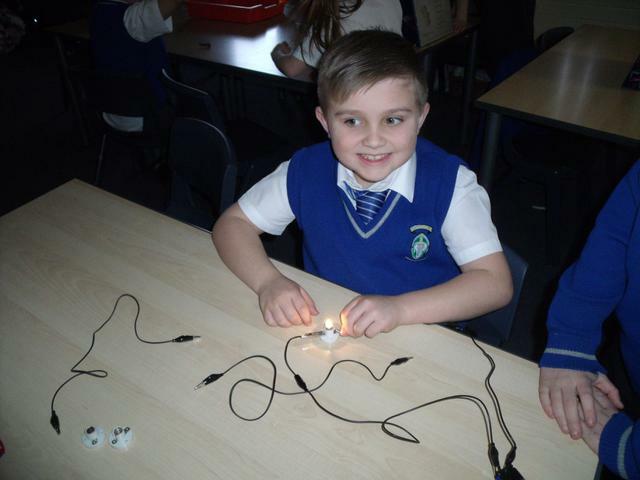 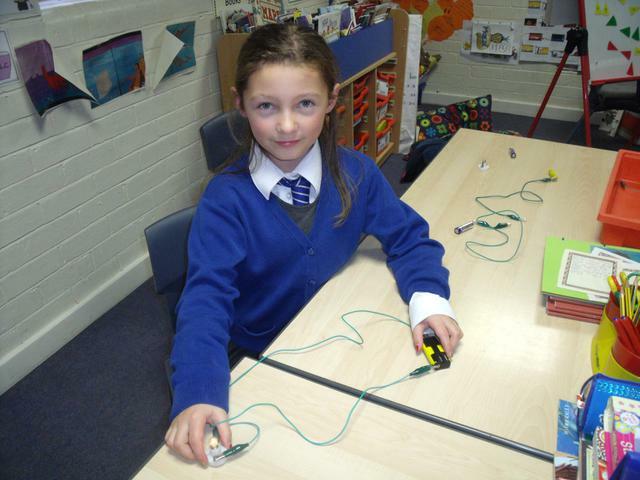 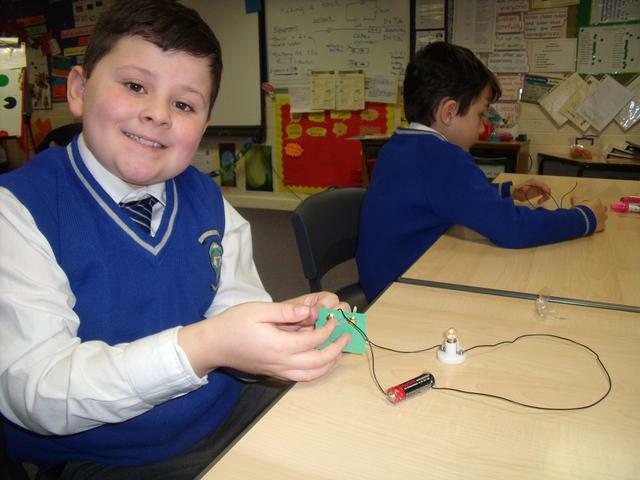 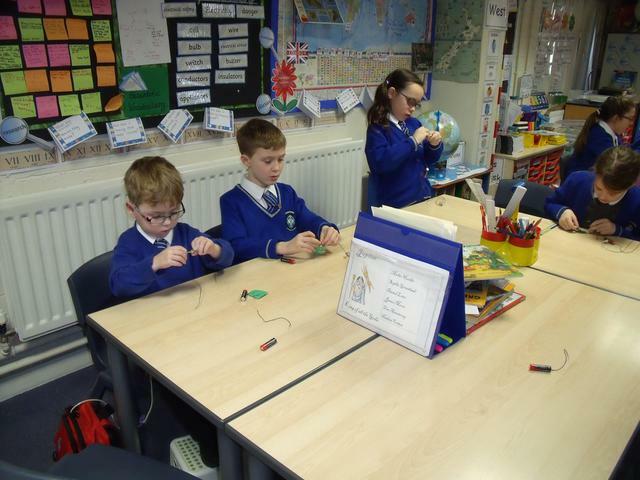 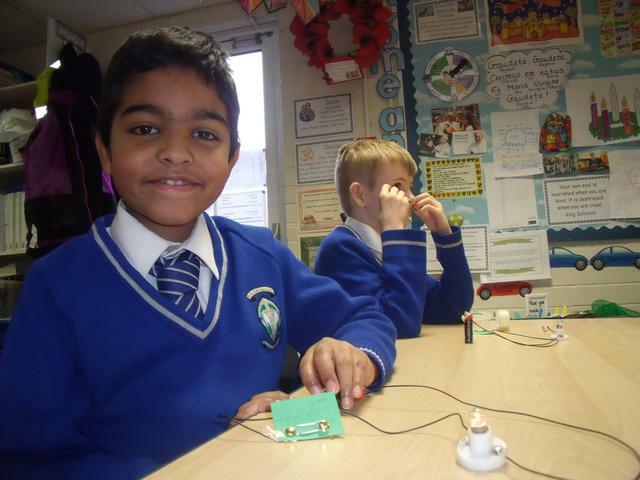 The children are having a great time investigating and exploring electrical circuits using bulbs, batteries, wires, motors and buzzers. 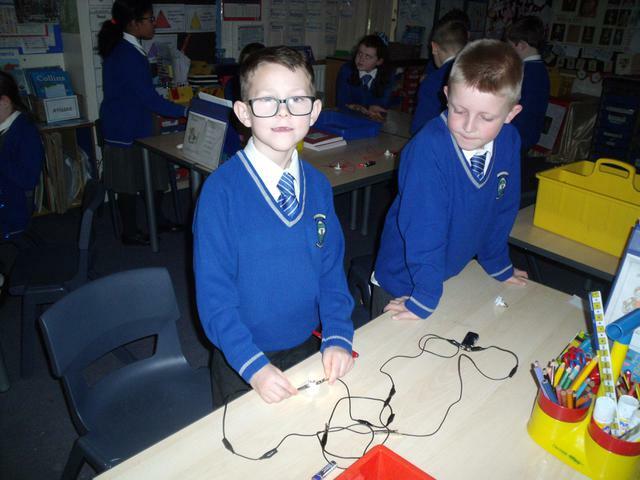 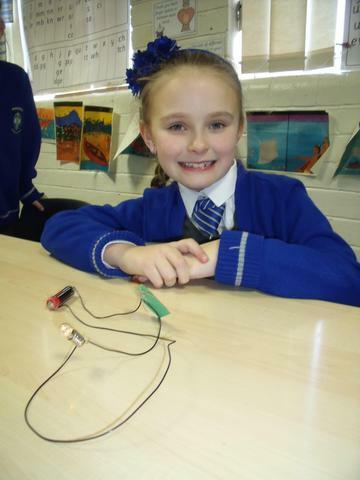 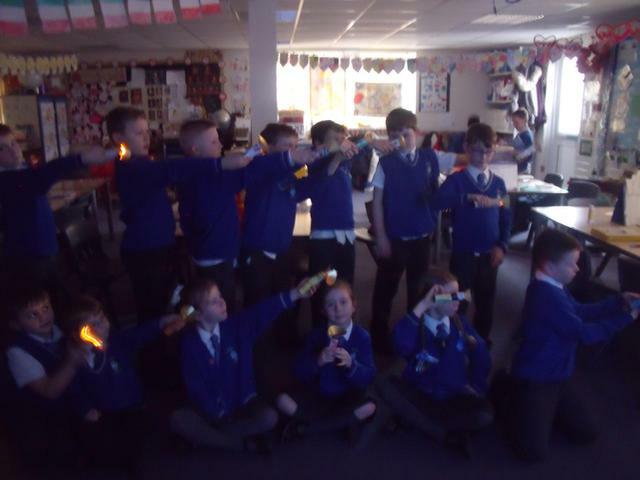 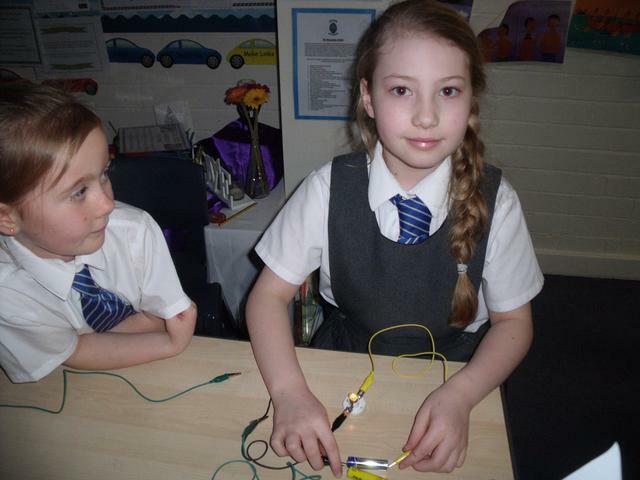 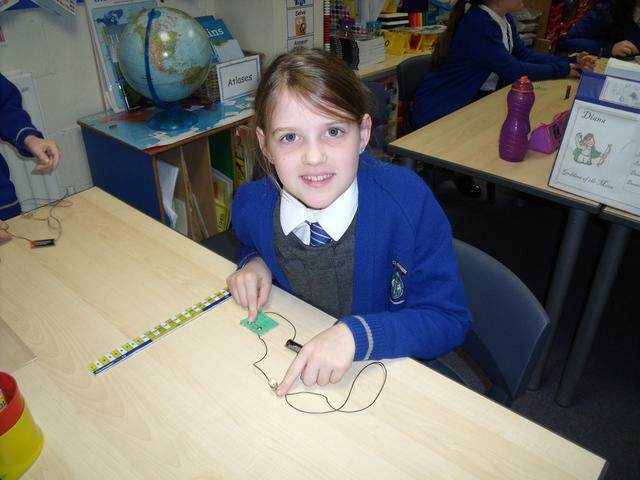 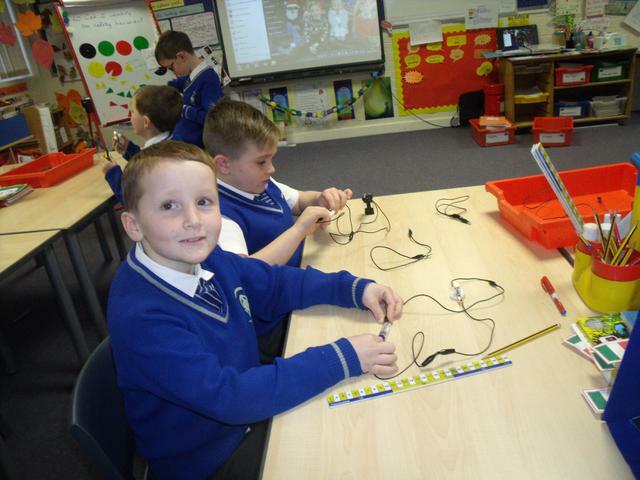 Using their experience of making electric circuits the children used this process and applied it to designing and making a working torch. 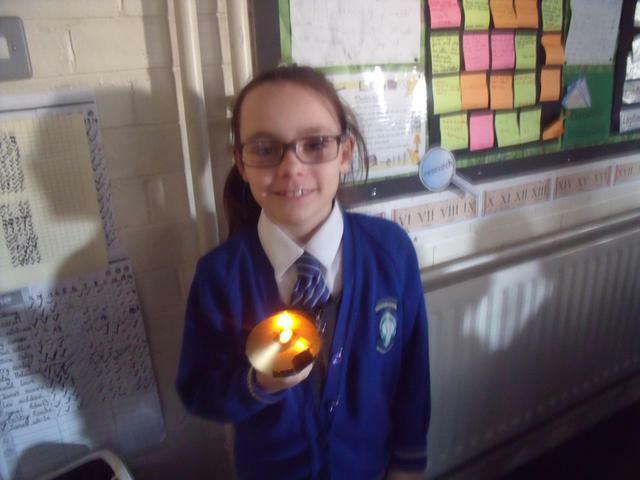 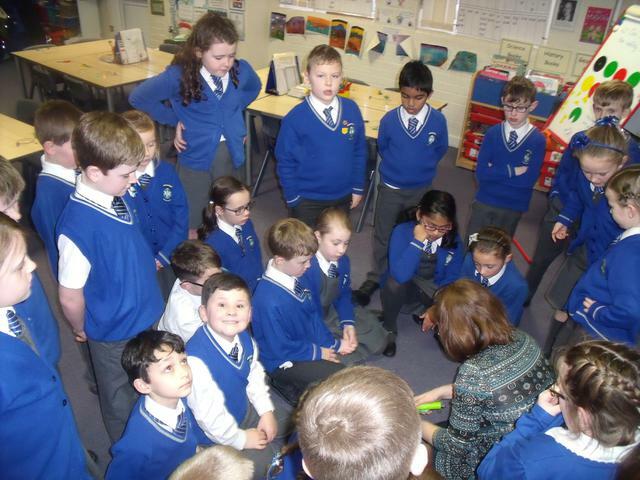 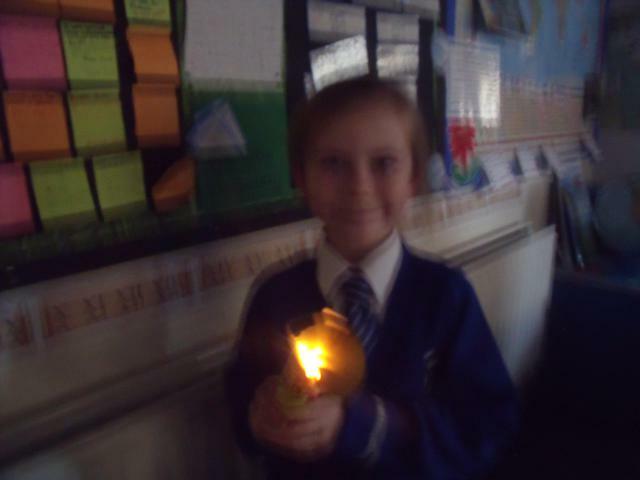 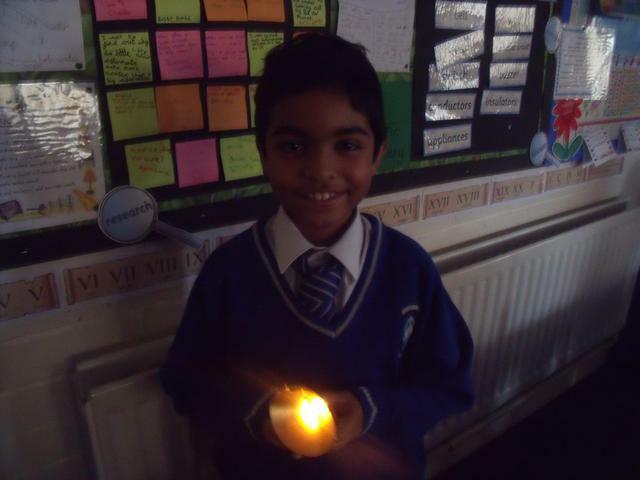 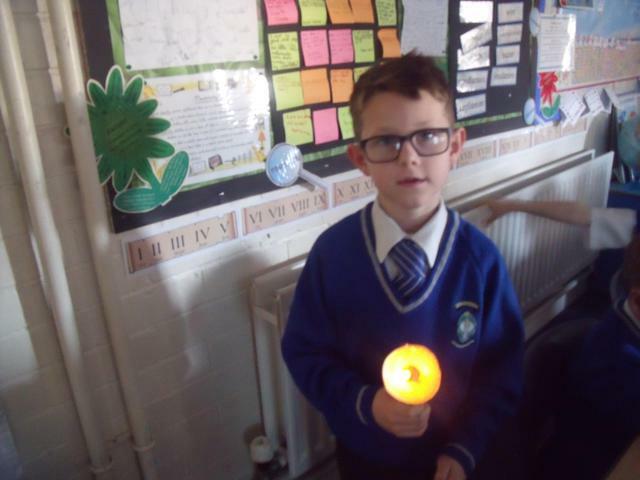 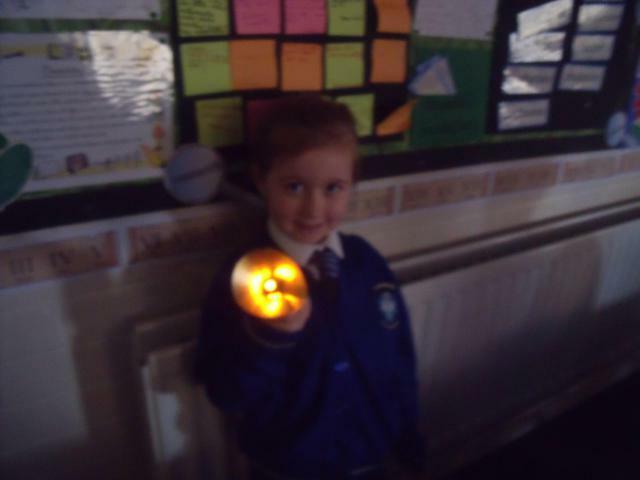 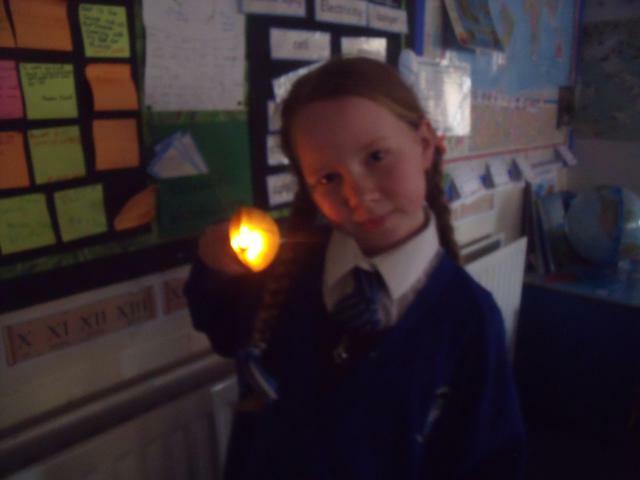 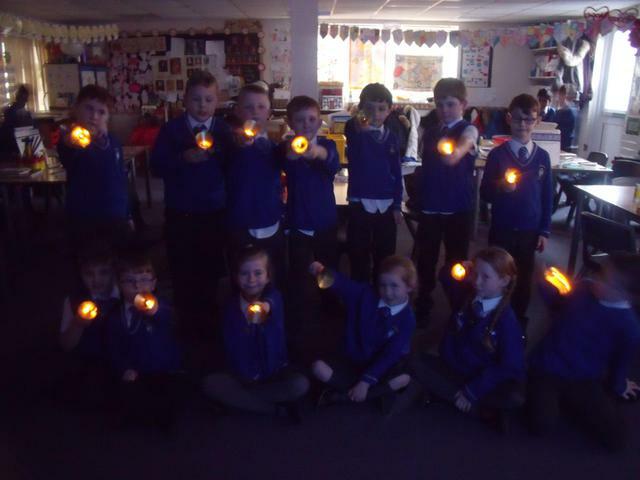 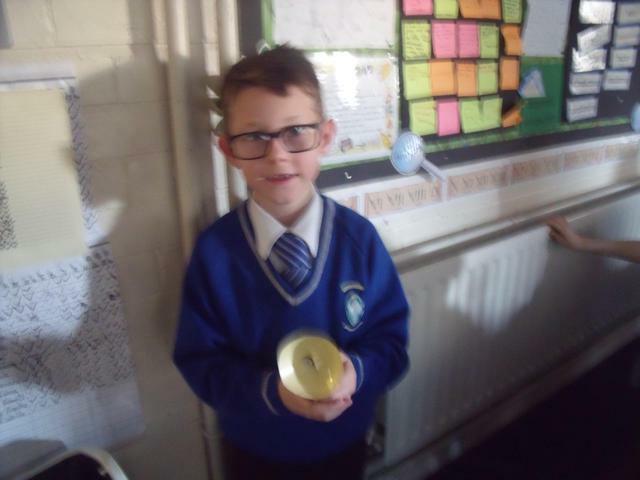 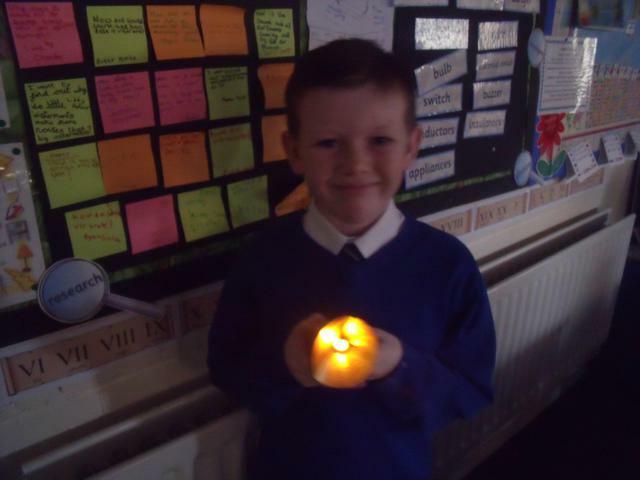 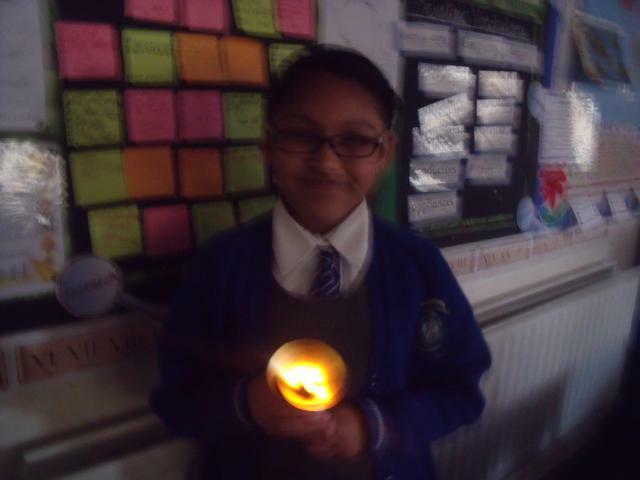 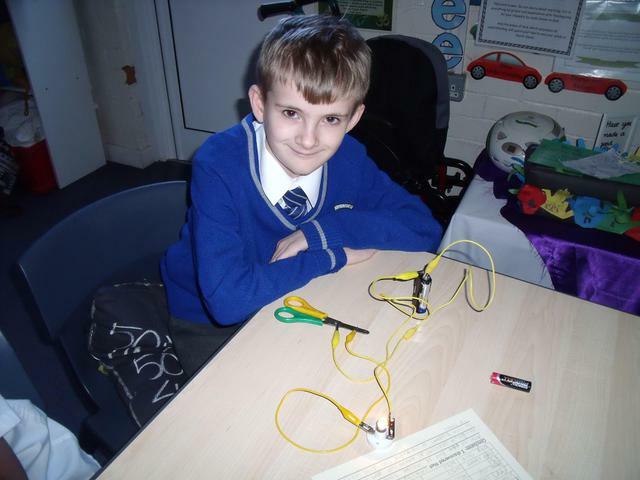 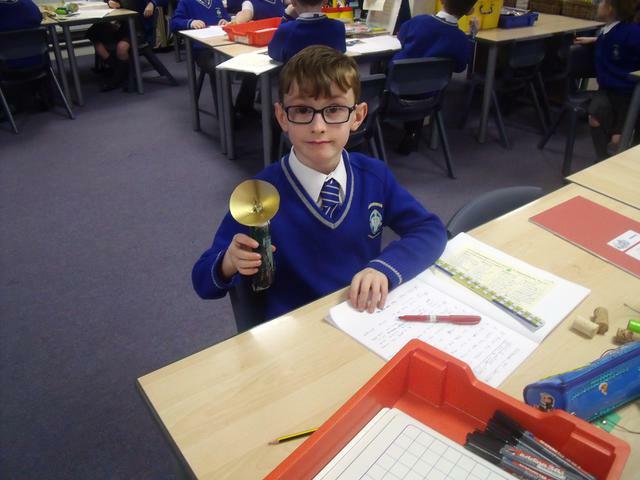 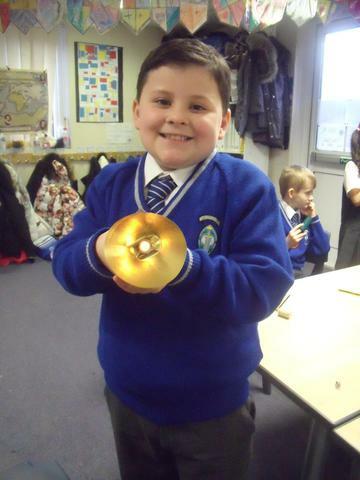 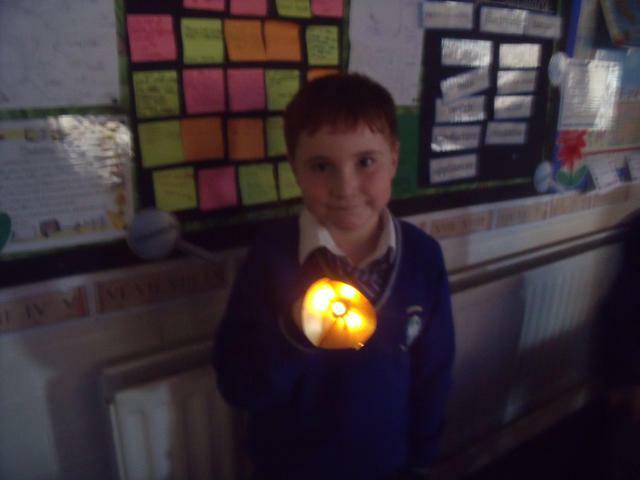 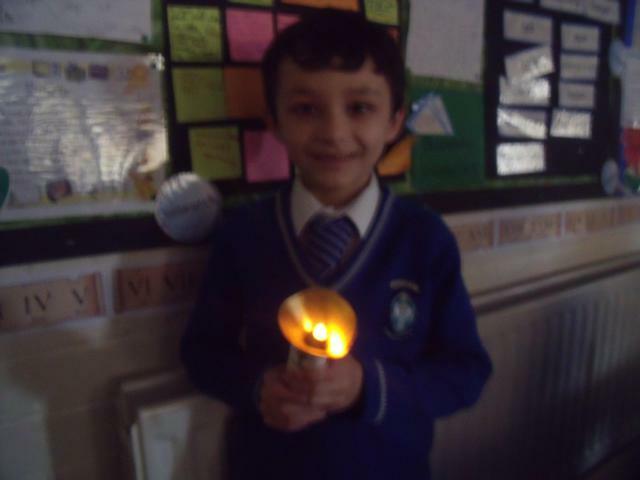 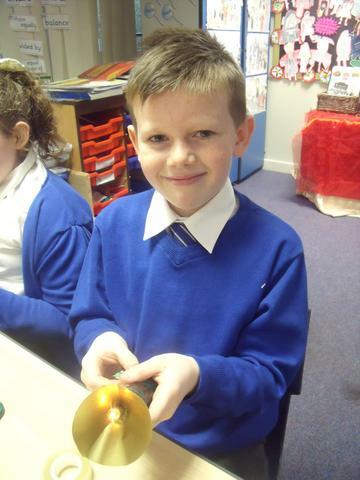 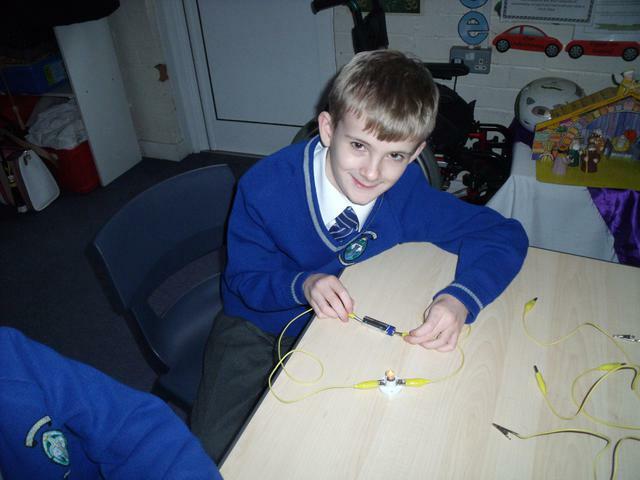 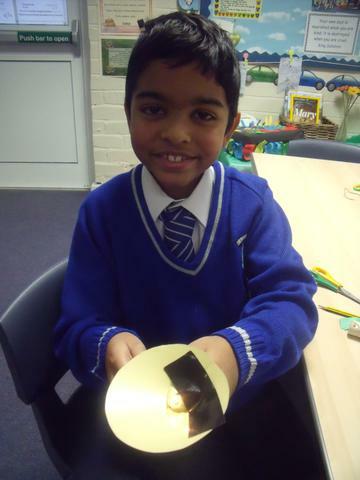 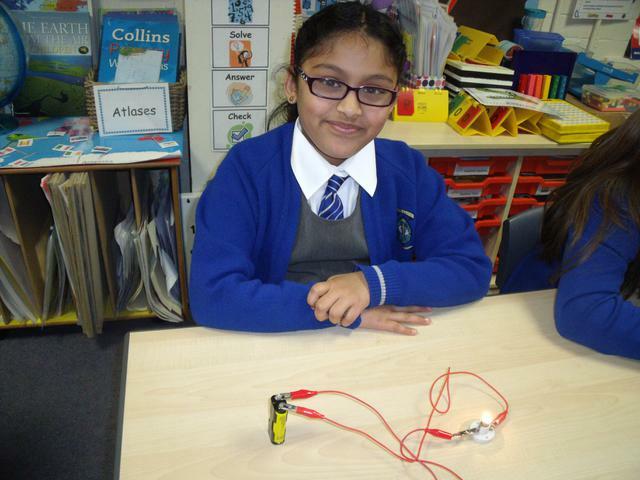 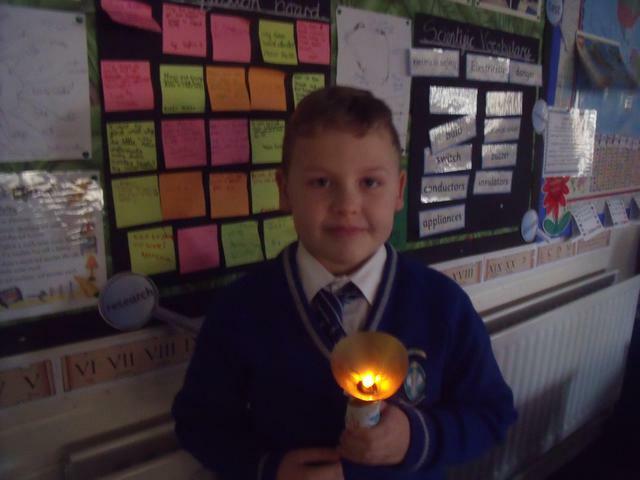 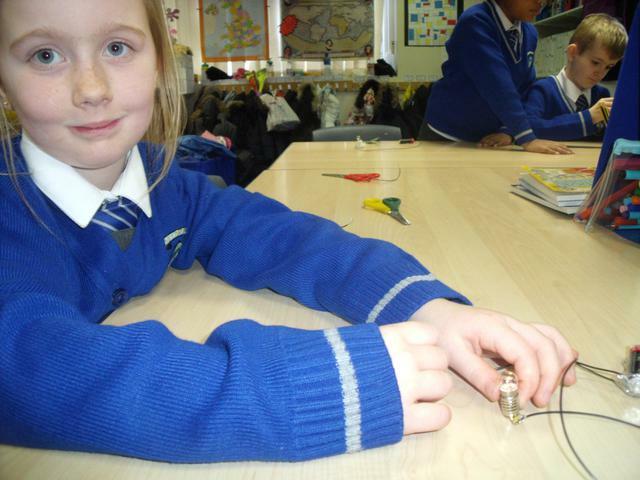 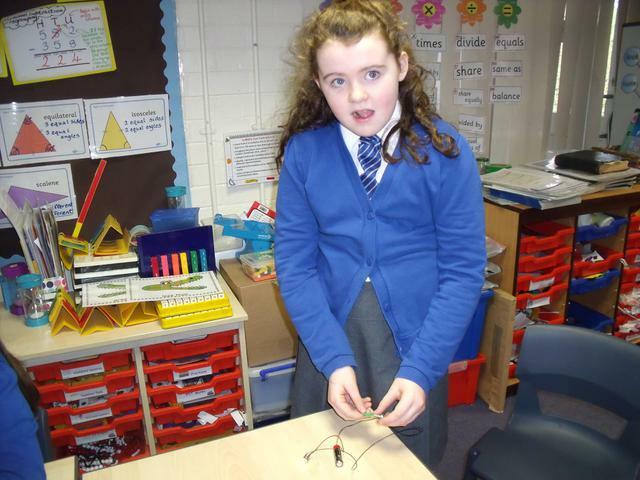 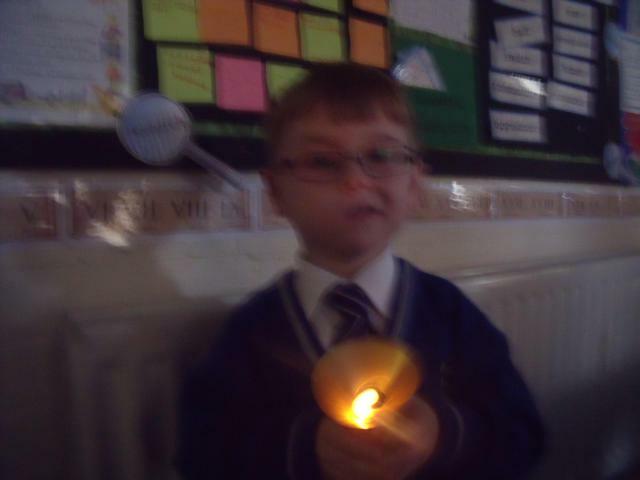 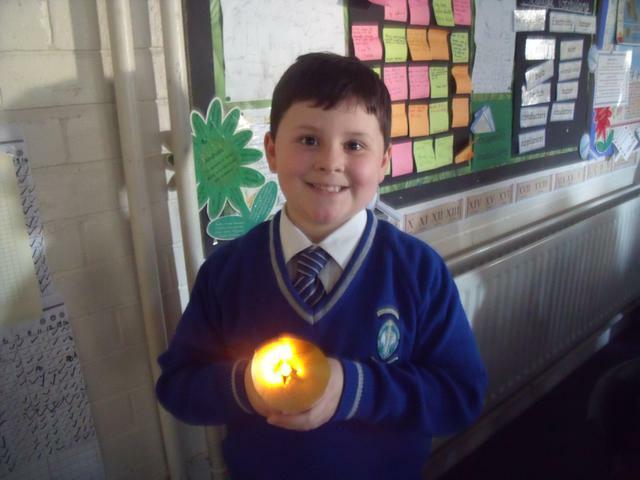 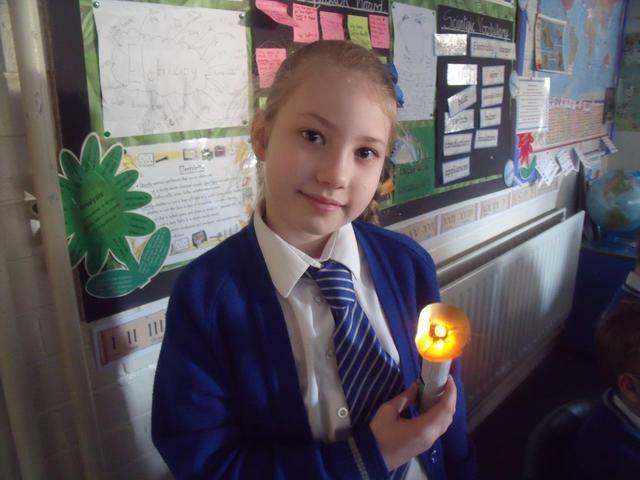 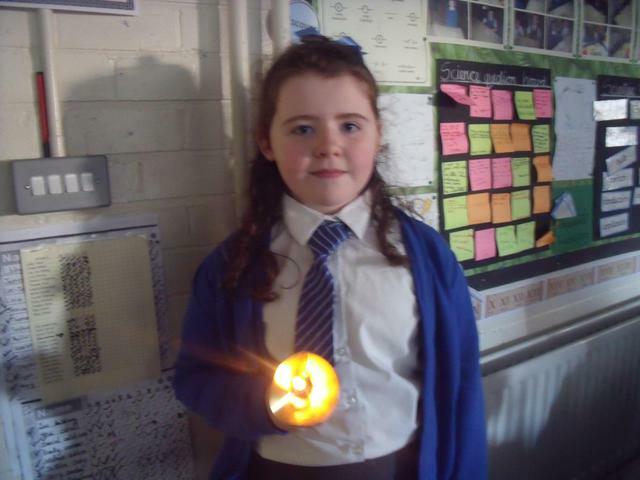 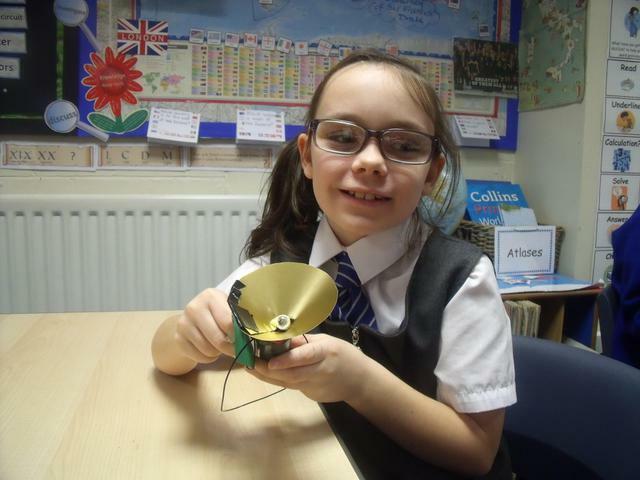 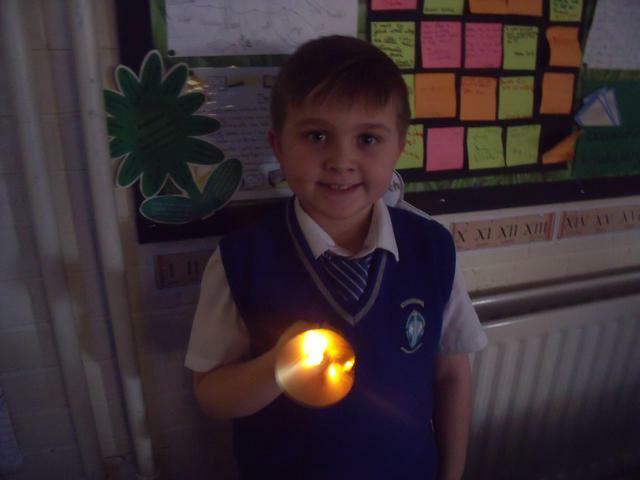 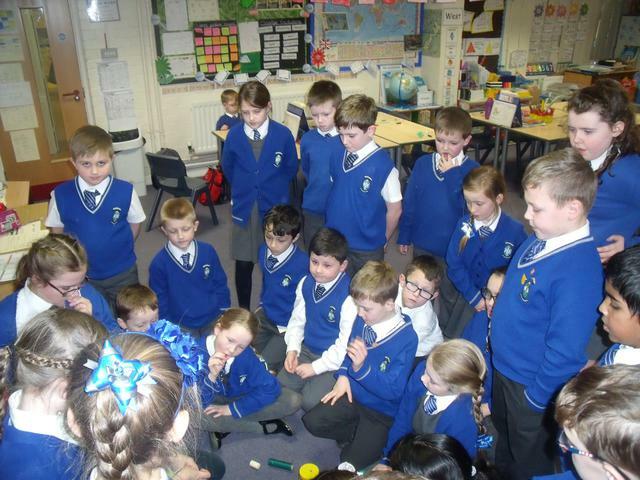 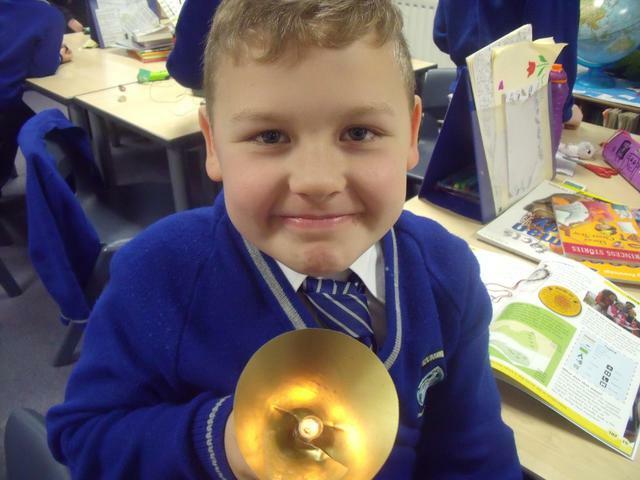 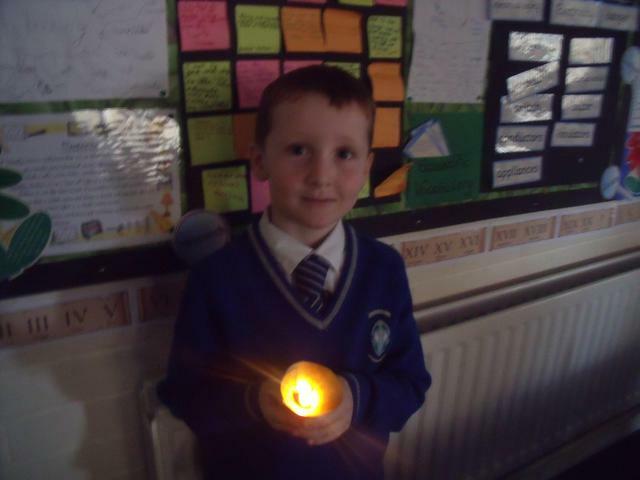 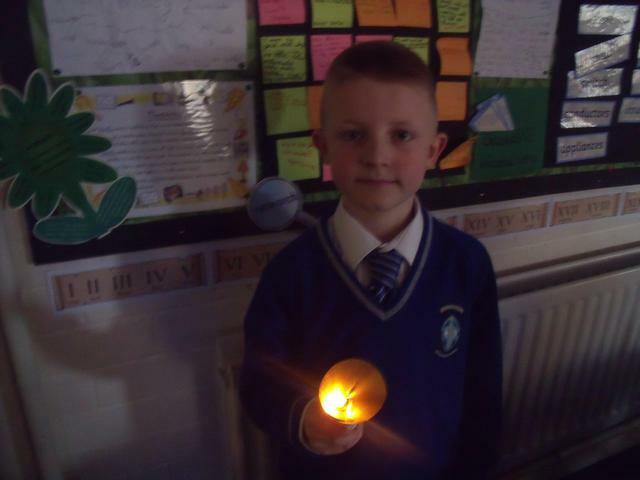 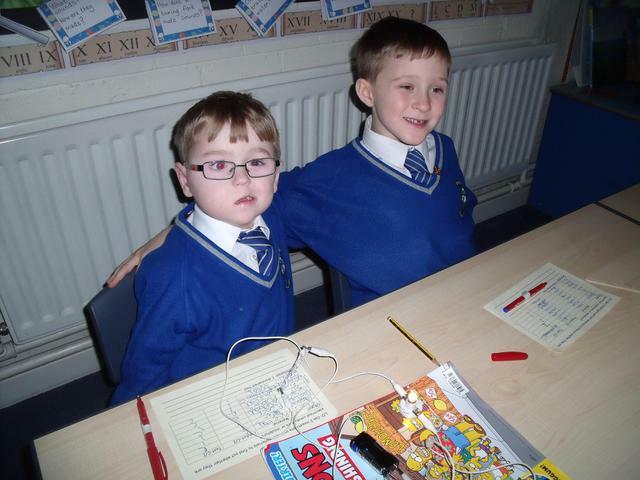 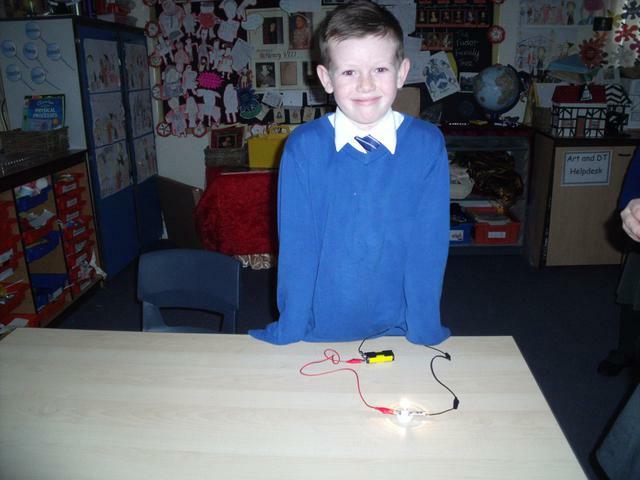 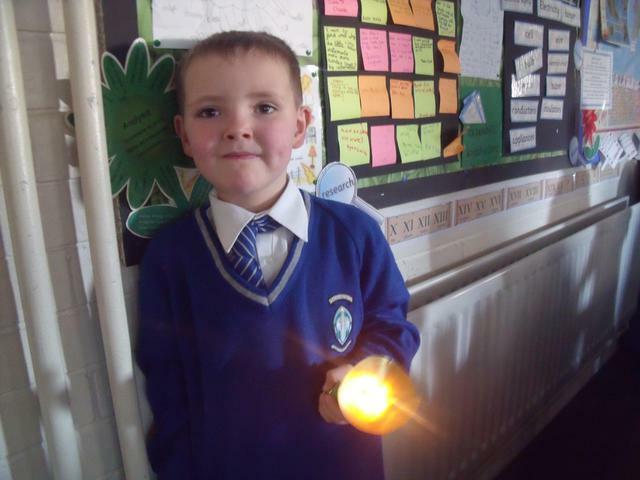 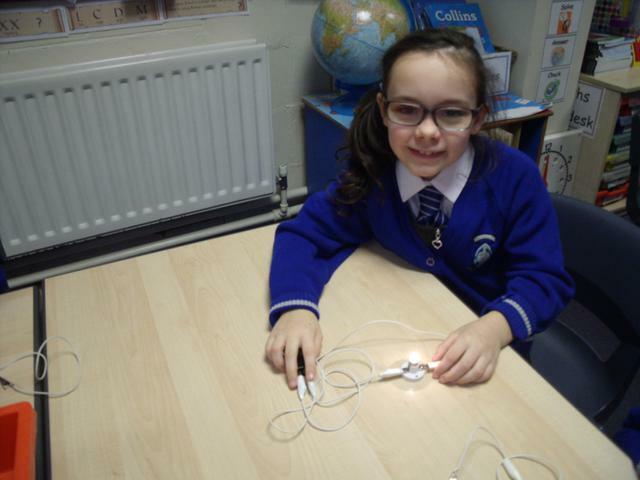 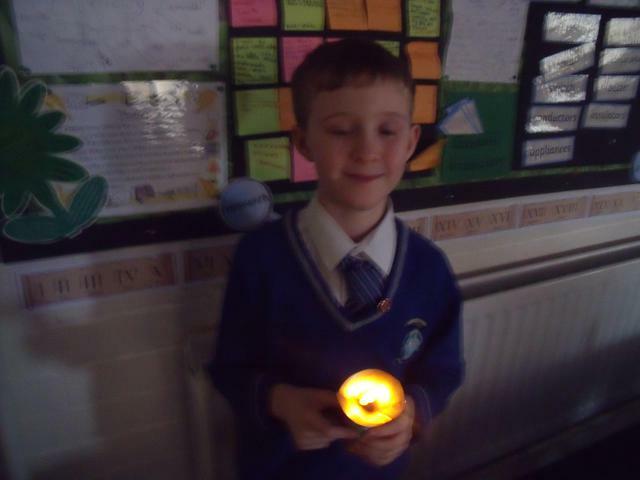 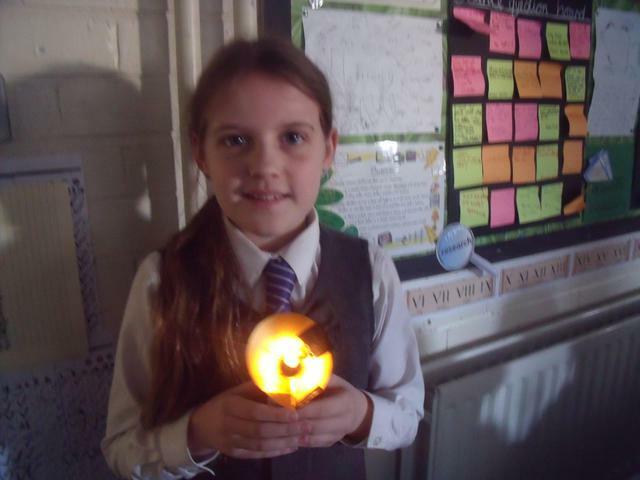 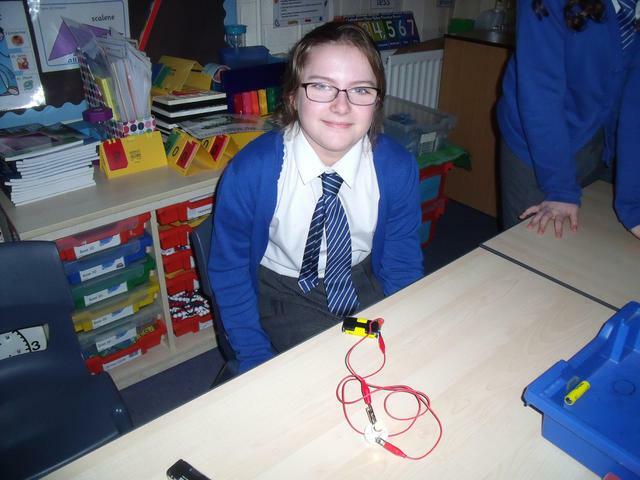 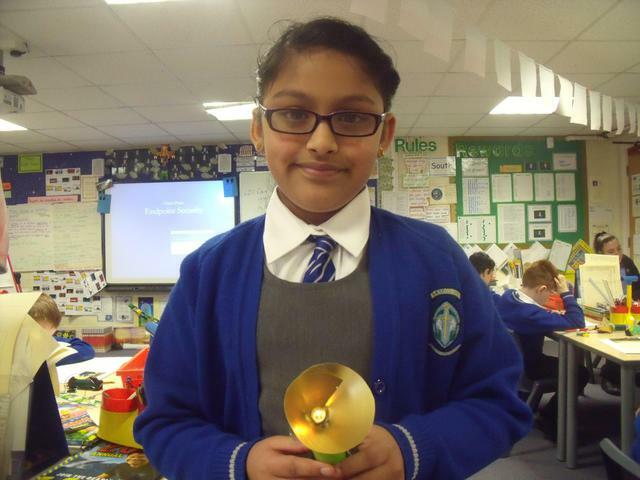 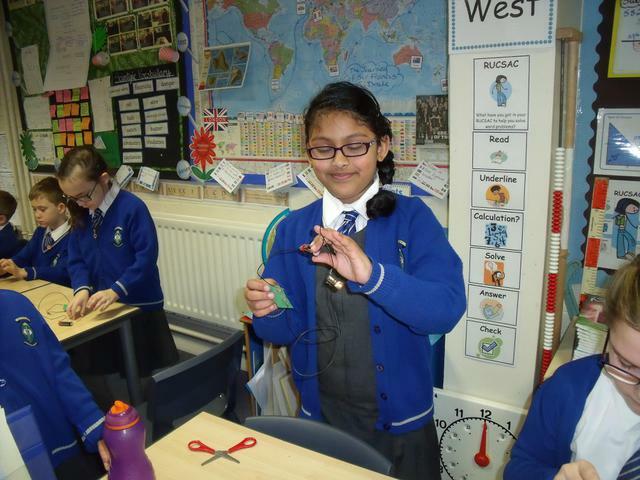 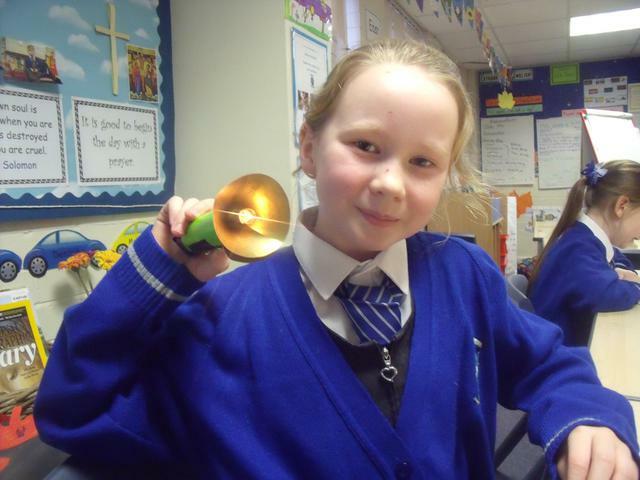 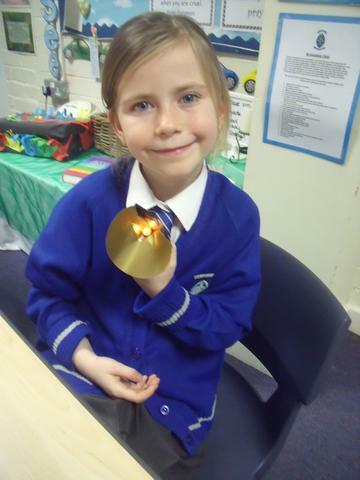 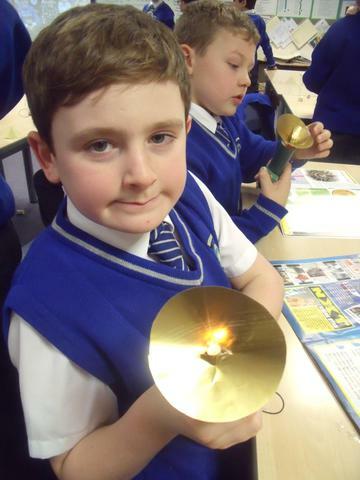 It took a lot of patience to connect the circuit together using a battery, wires, a switch, bulb holder and bulb, which was then placed inside a cylinder to create a torch. 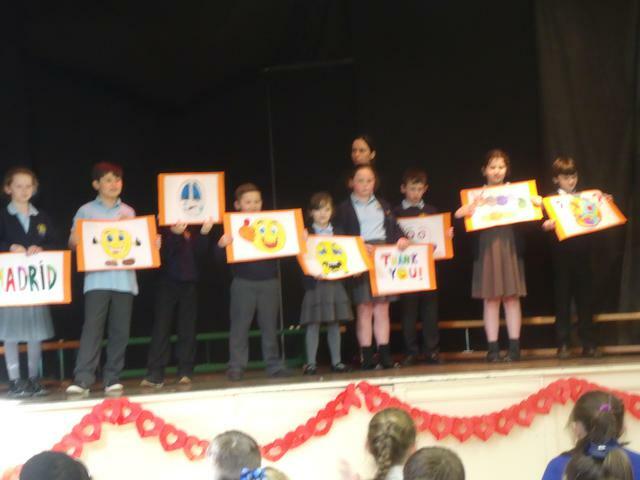 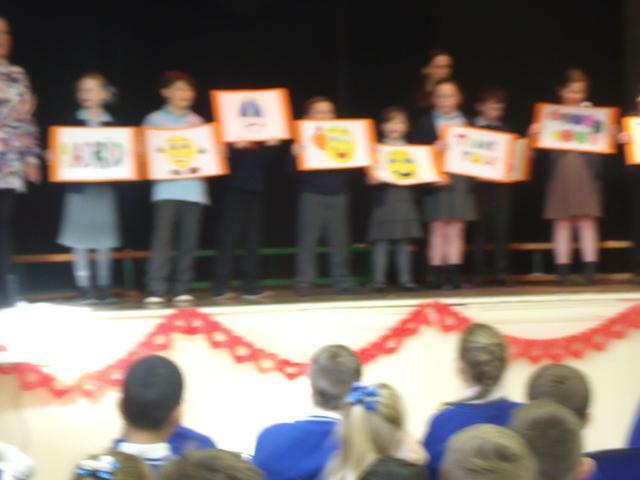 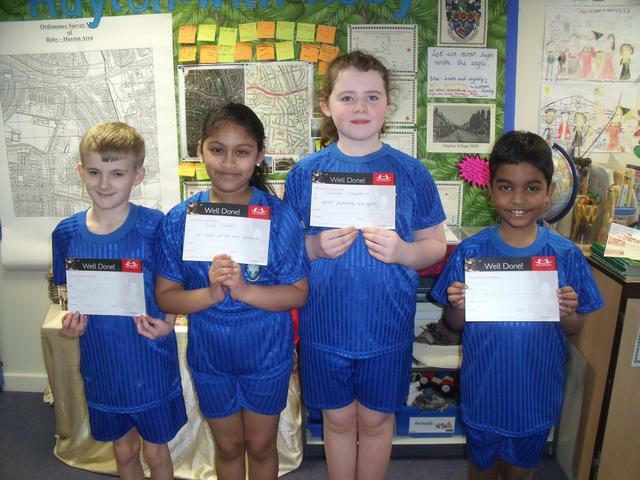 The children were delighted with their results. 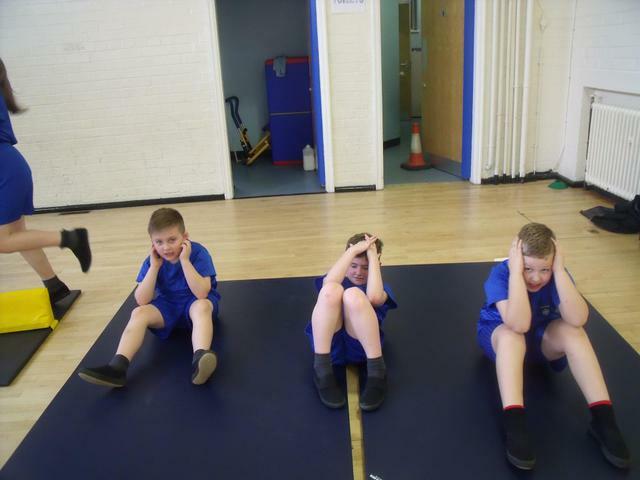 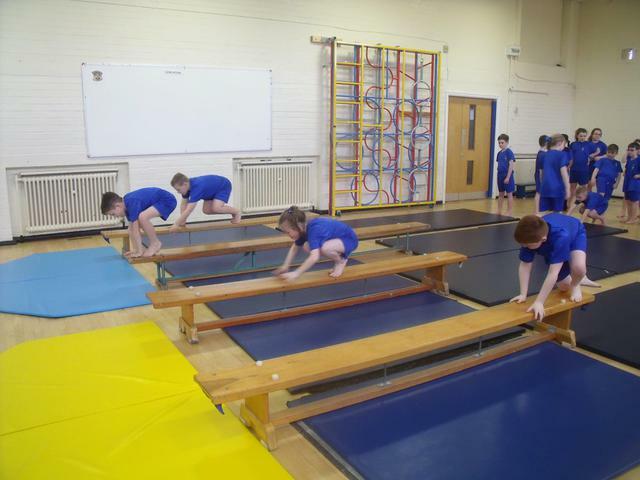 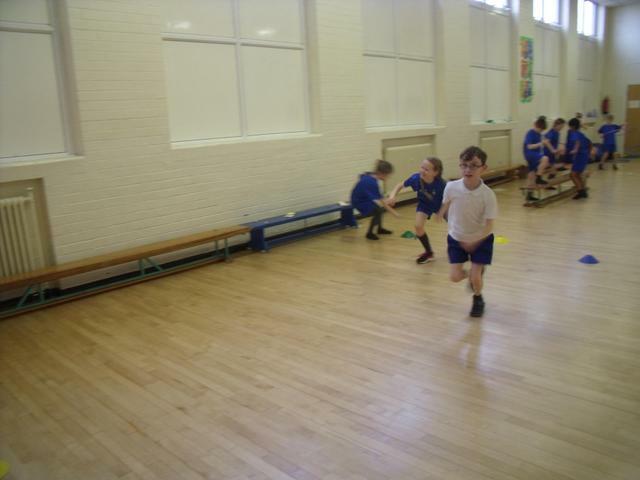 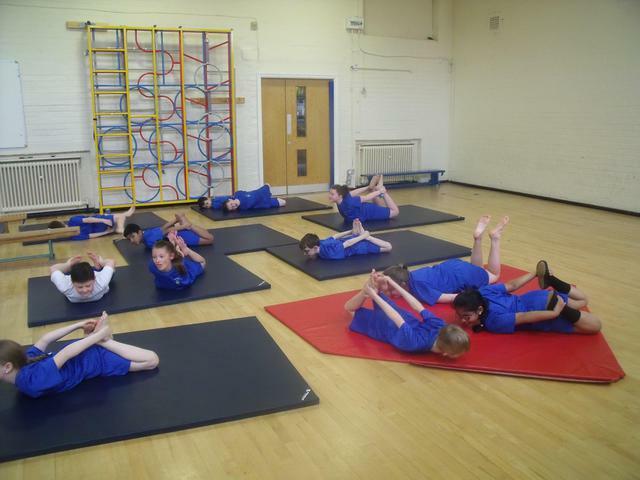 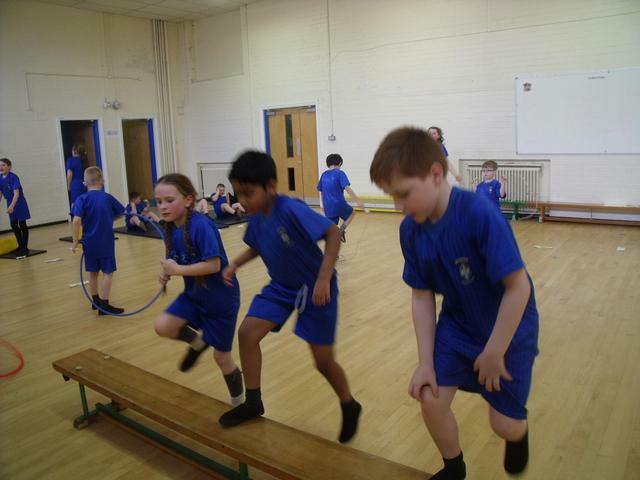 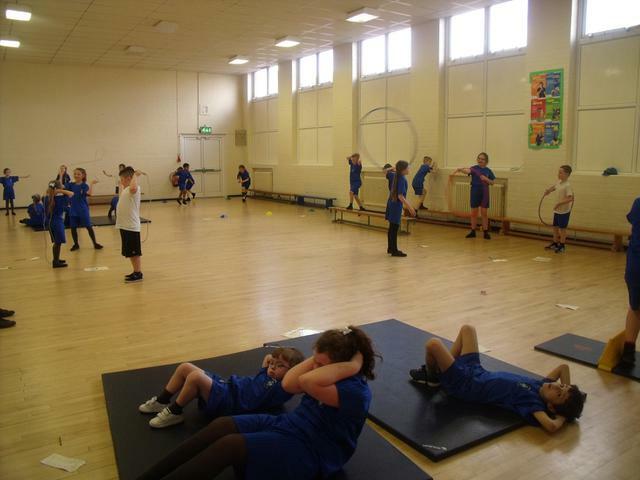 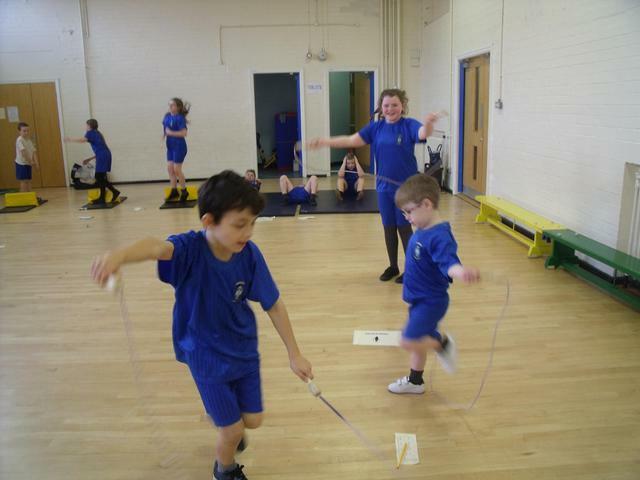 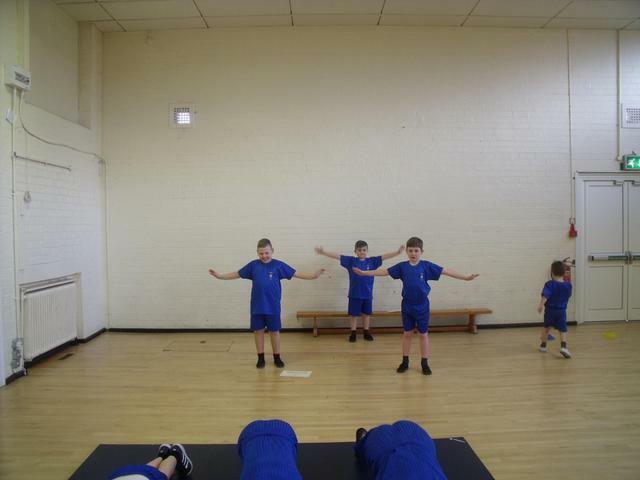 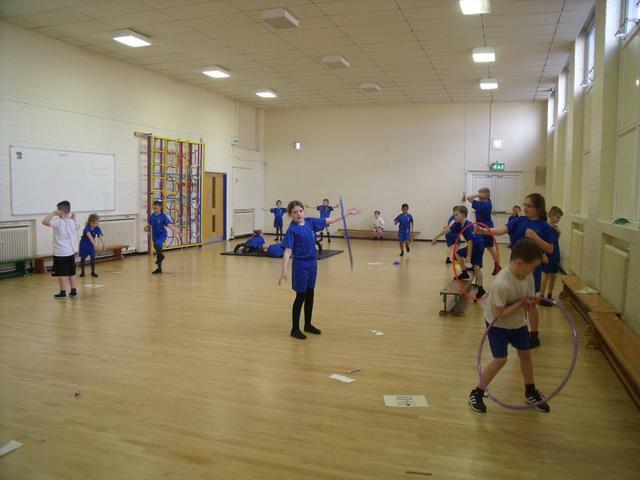 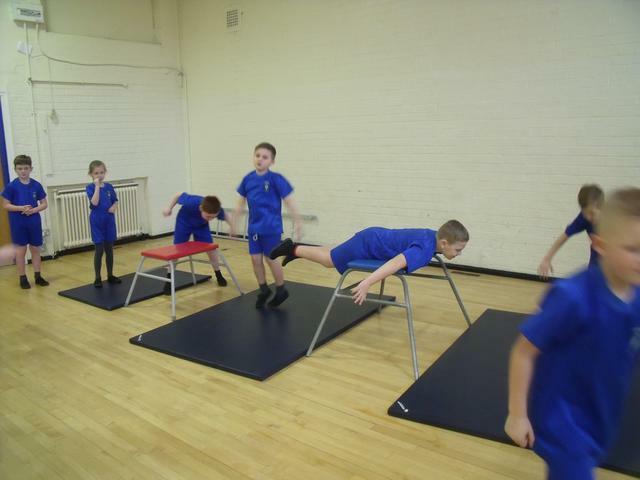 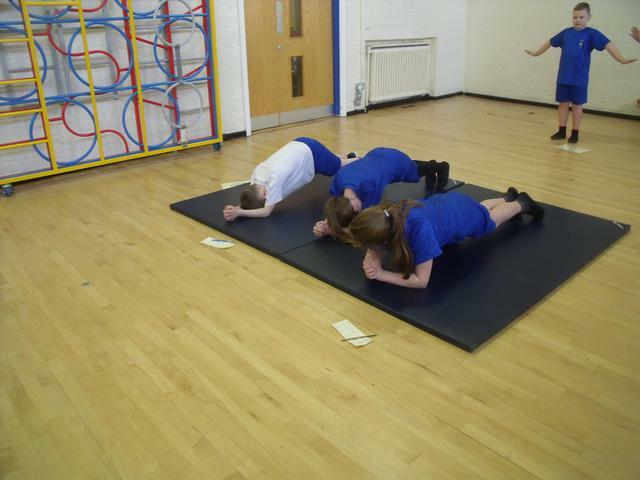 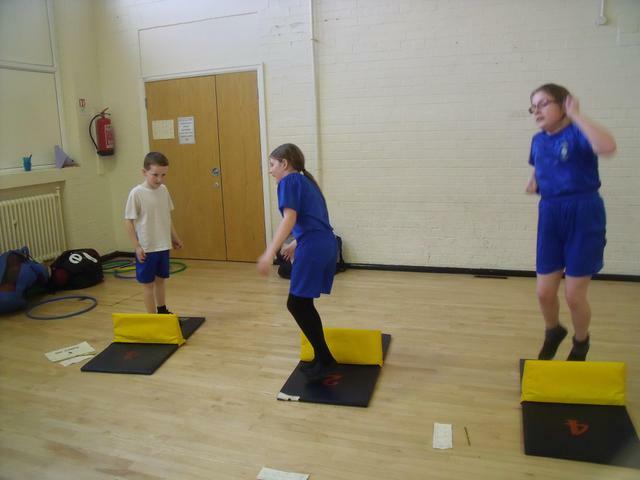 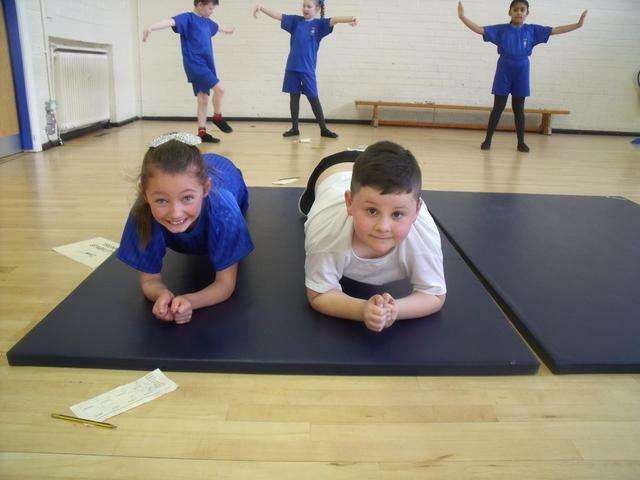 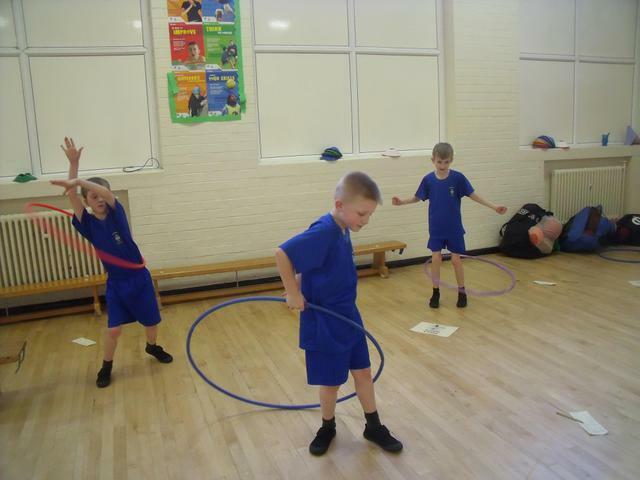 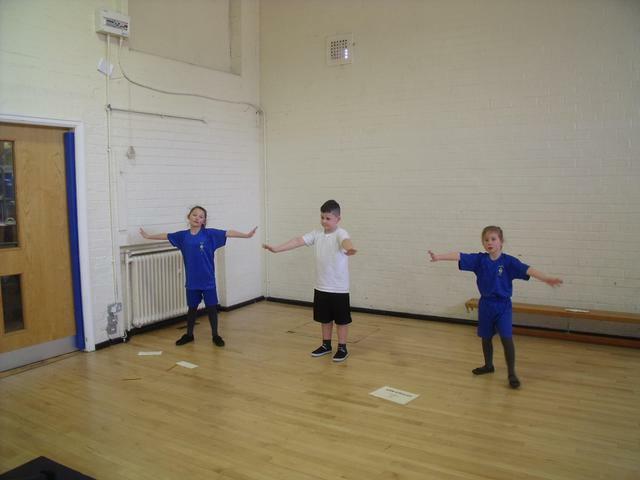 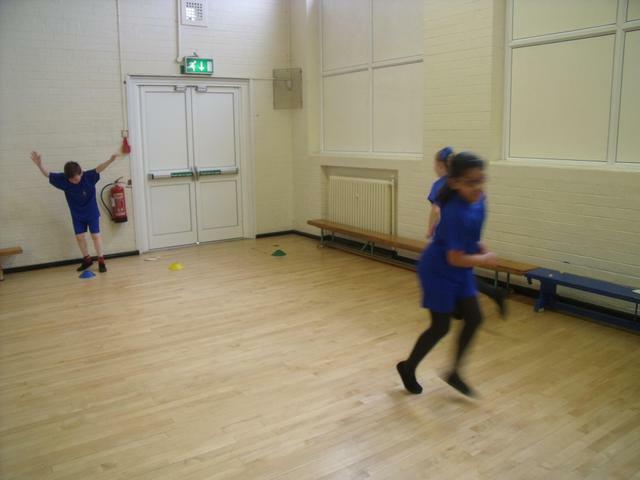 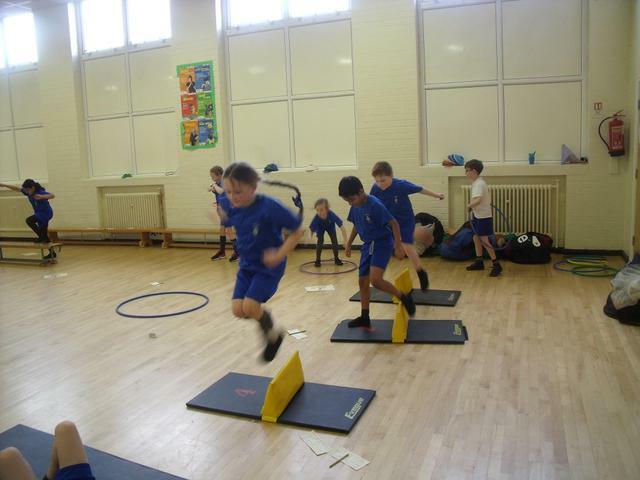 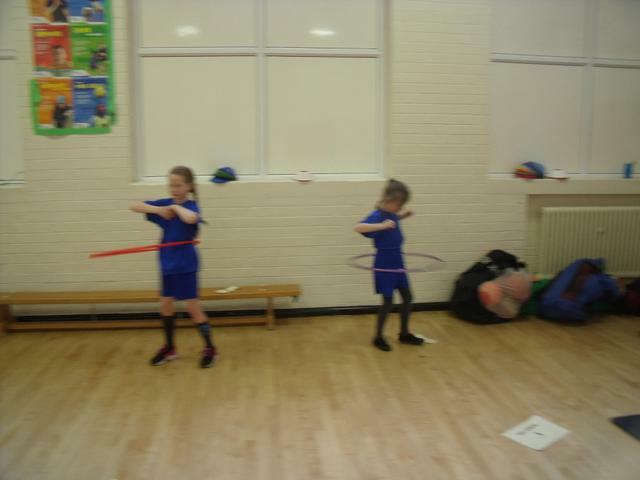 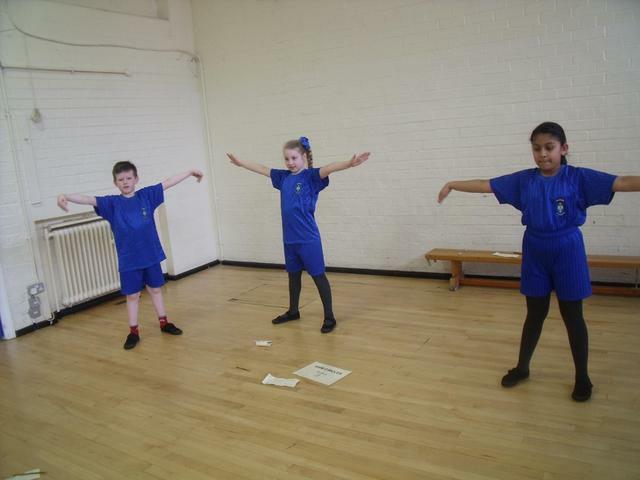 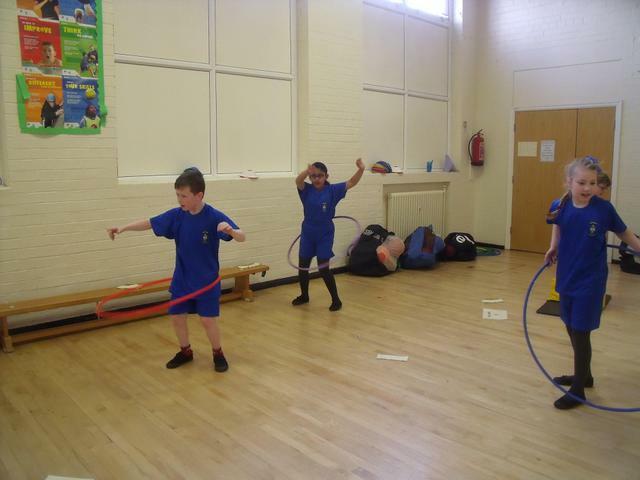 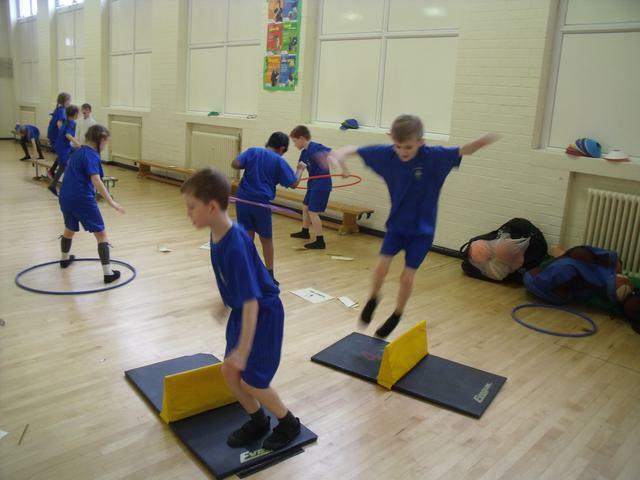 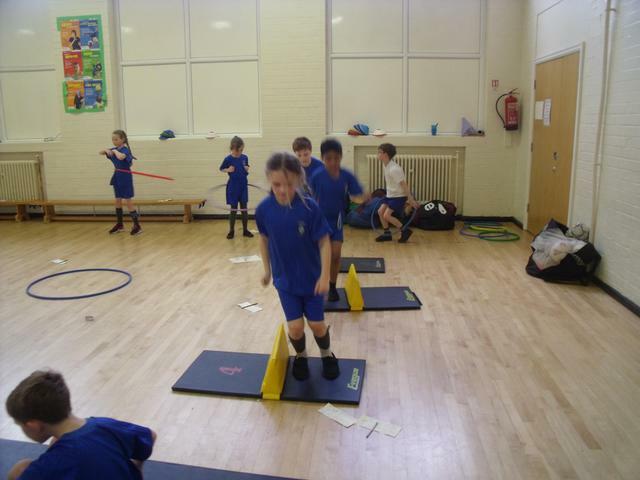 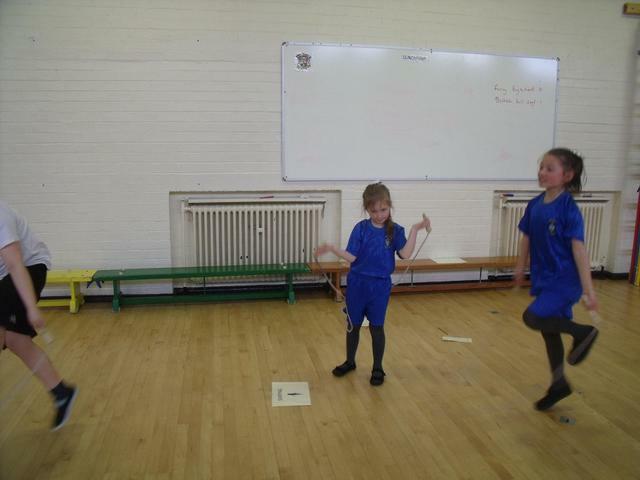 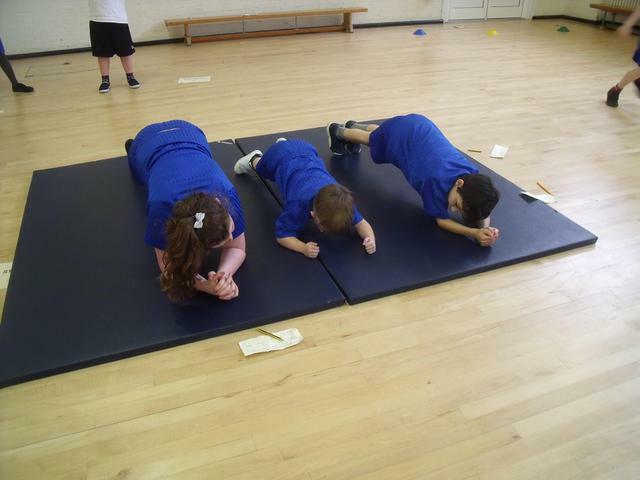 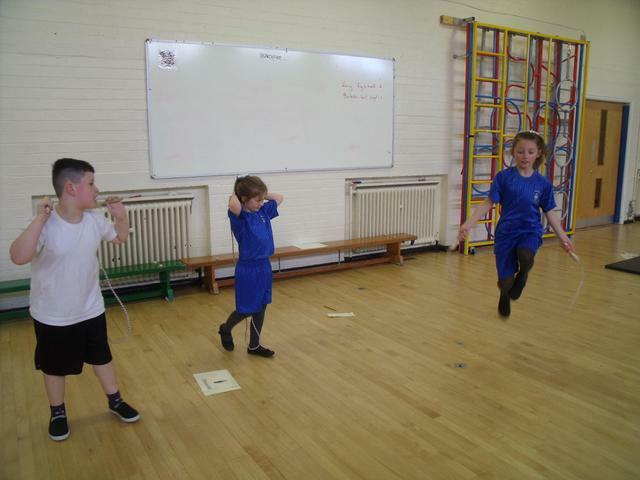 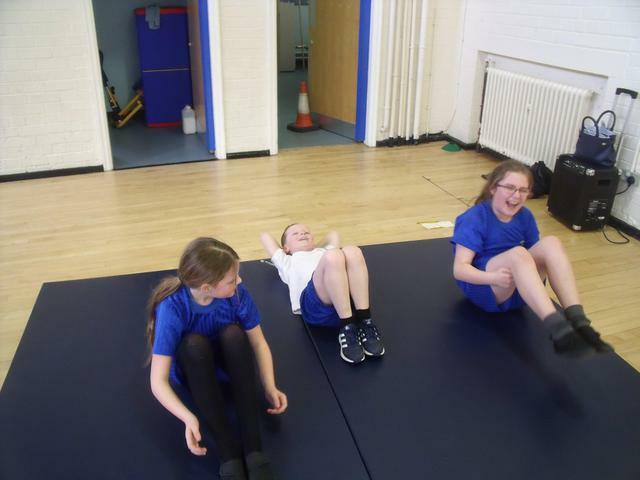 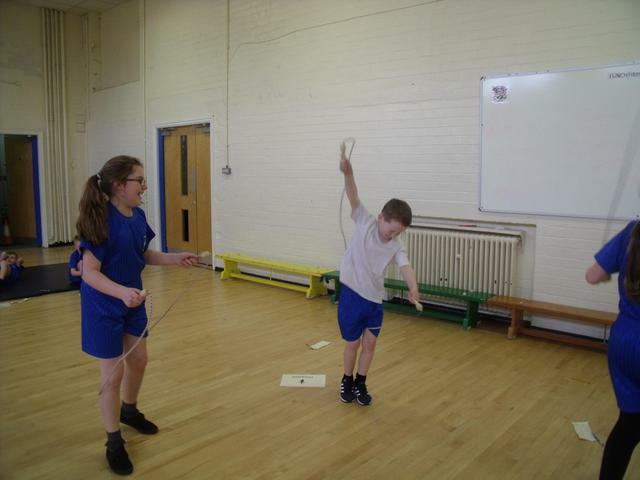 The children are working really hard in the circuit training lesson. 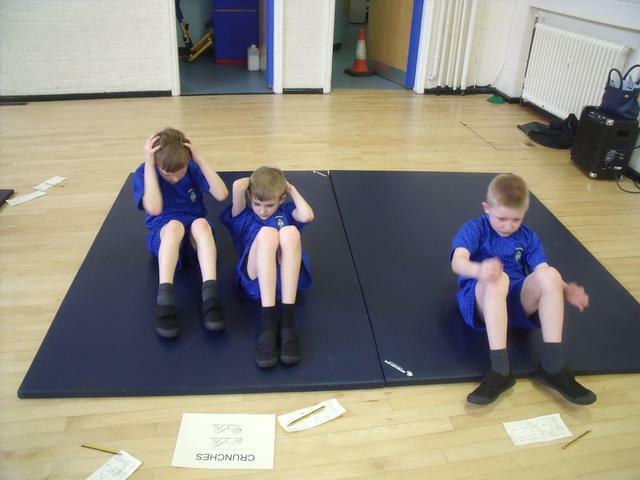 They work in groups of three to complete 9 activities. 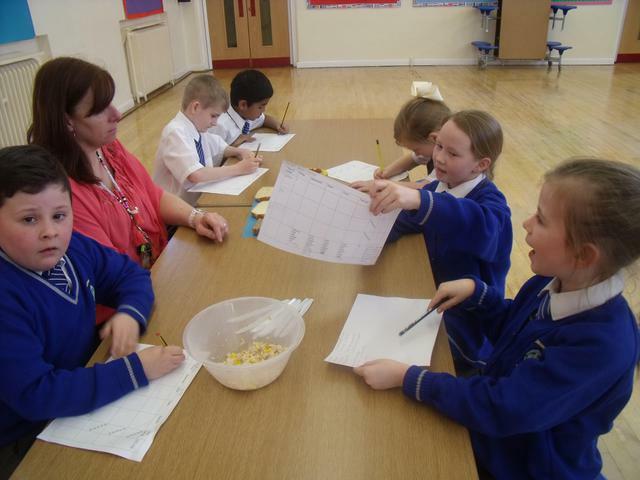 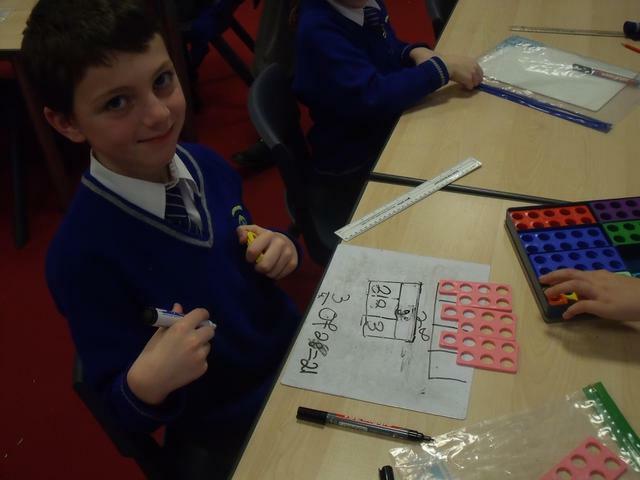 They have a minute at each base, then record their result onto a table, to see if they have improved on last week's score. 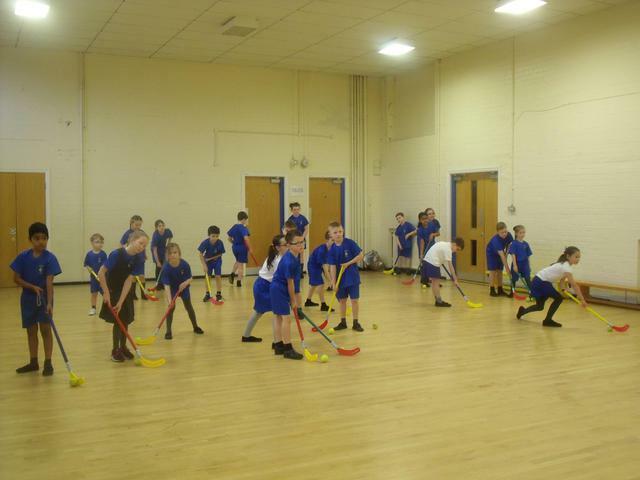 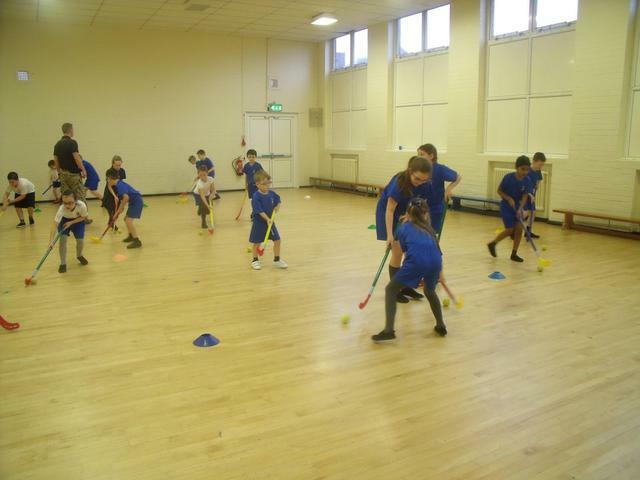 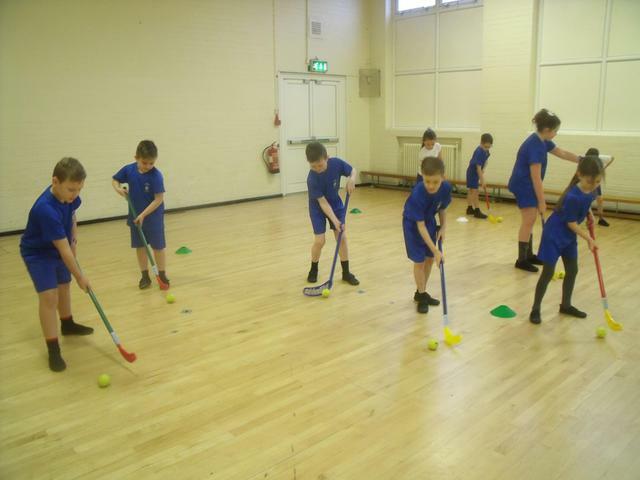 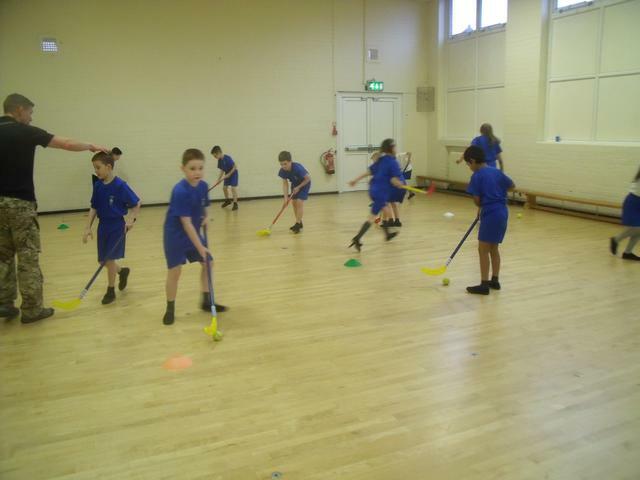 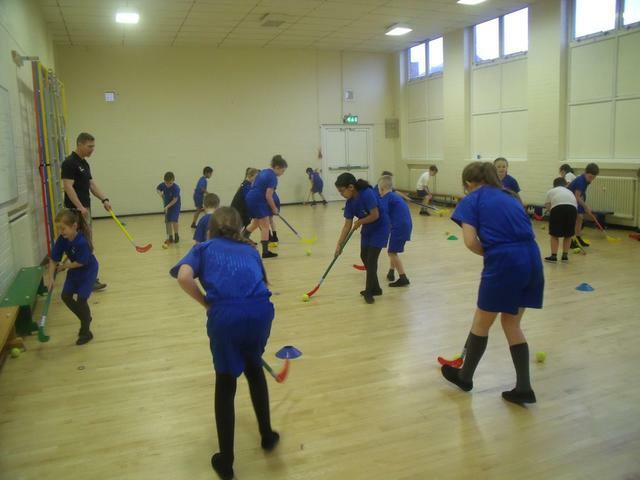 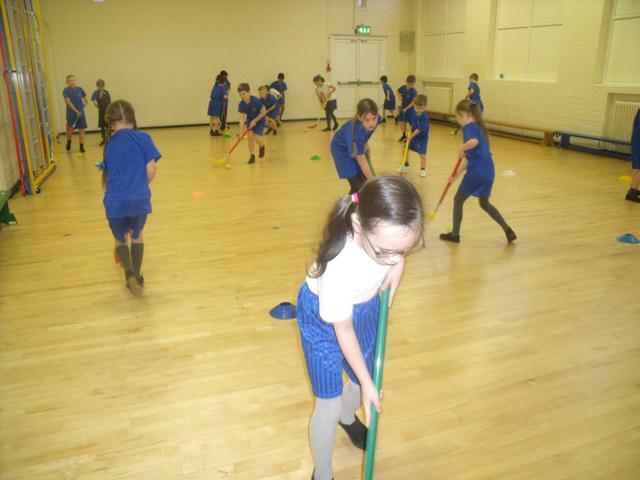 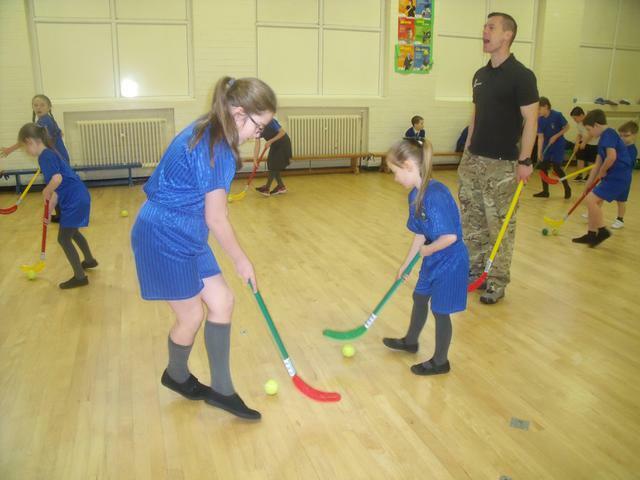 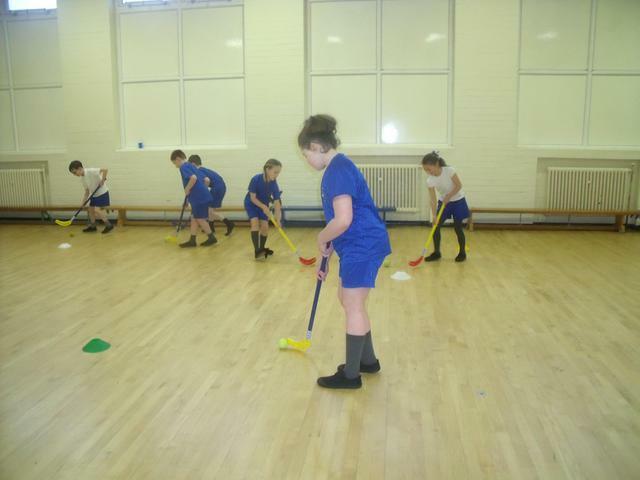 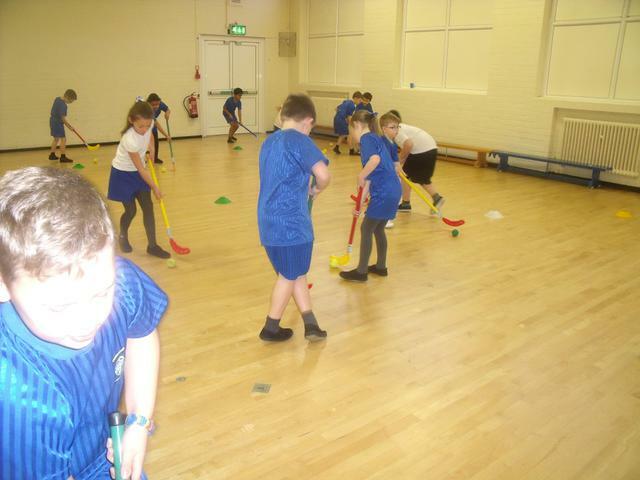 The children have had a brilliant time learning how to play hockey with Commando Joe. 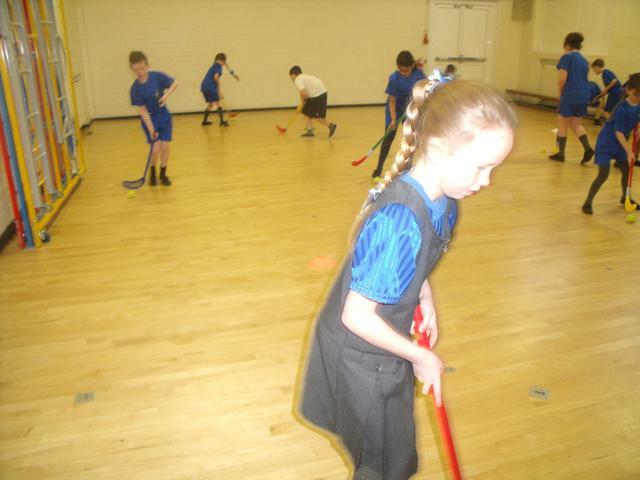 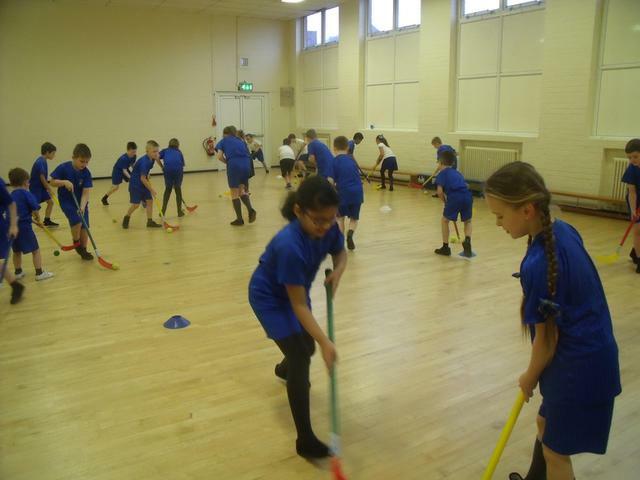 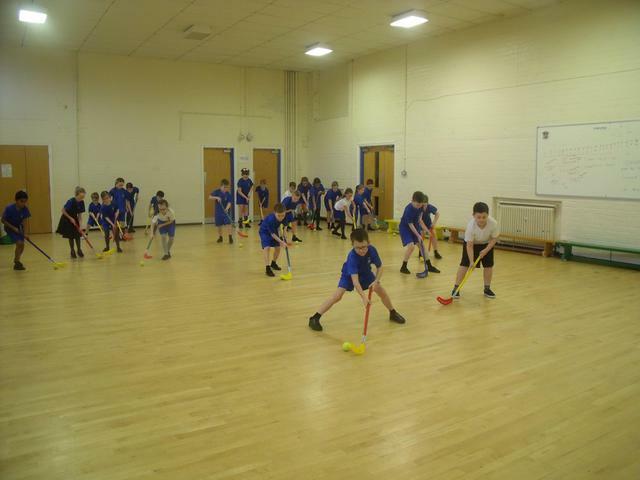 They even had very competitive hockey matches. 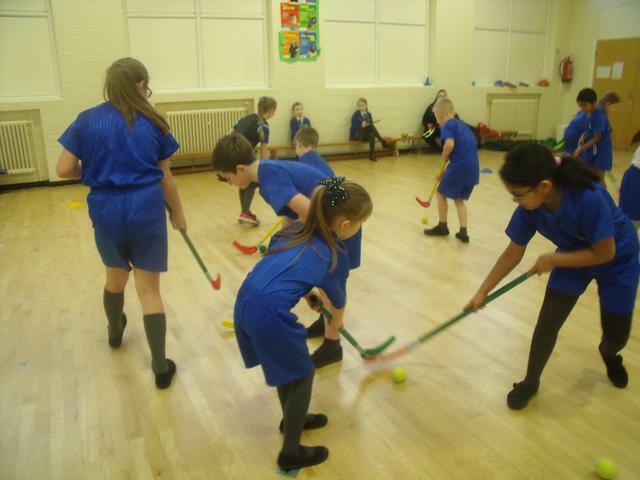 There are lots of talented hockey players in this class! 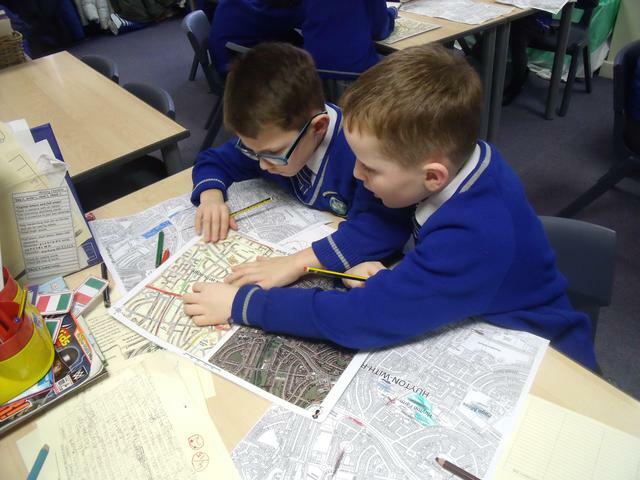 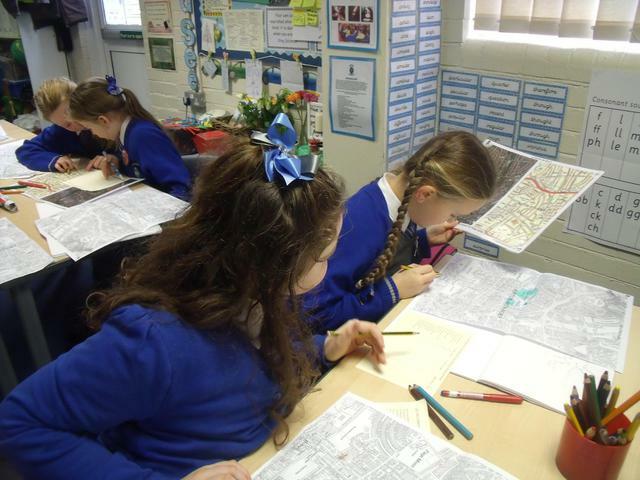 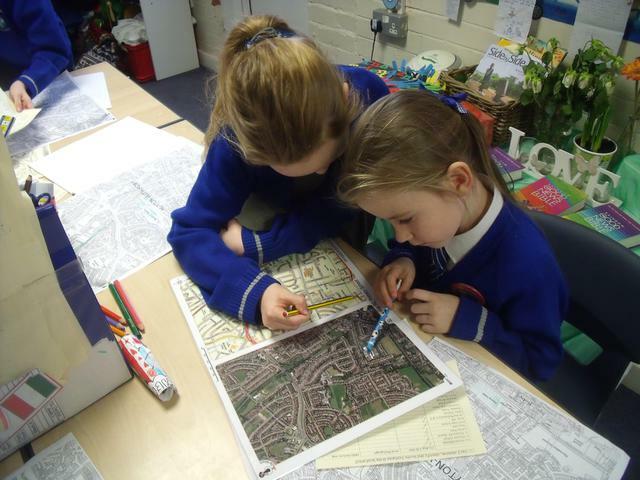 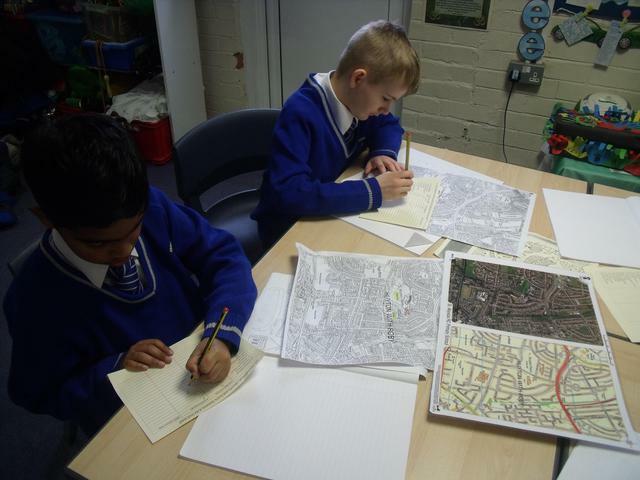 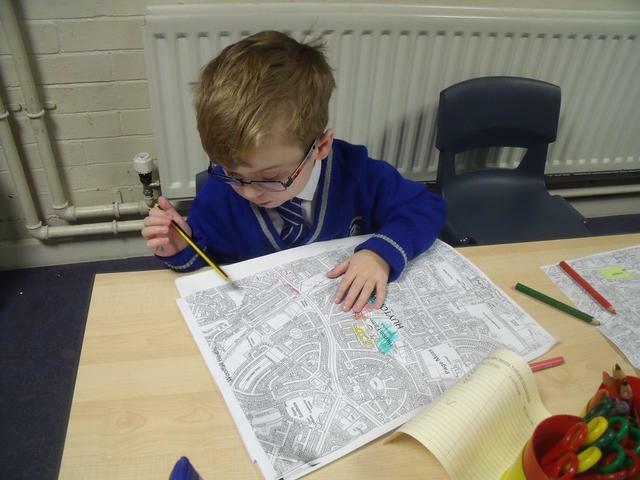 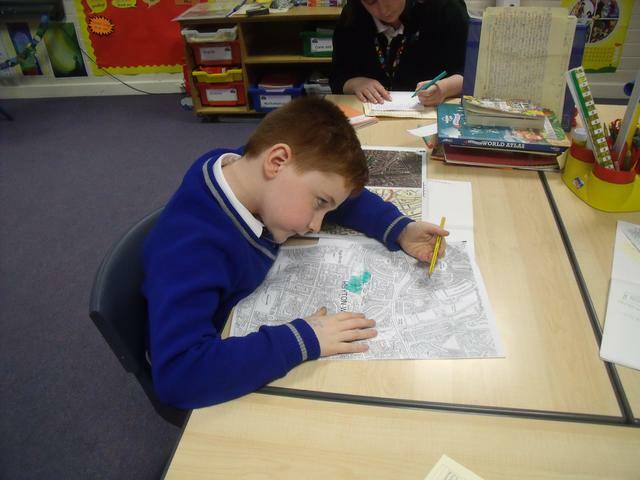 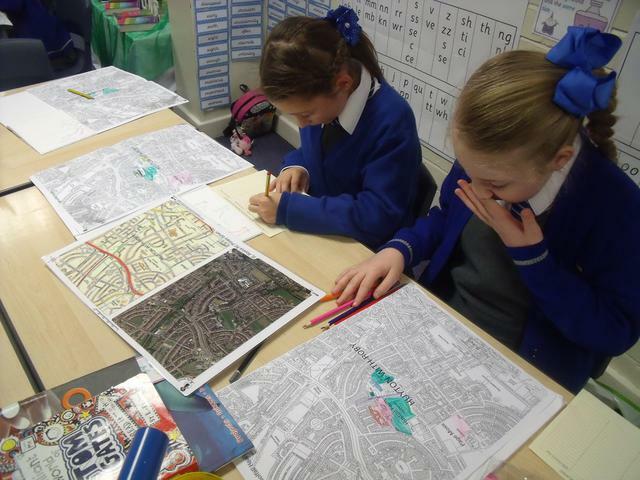 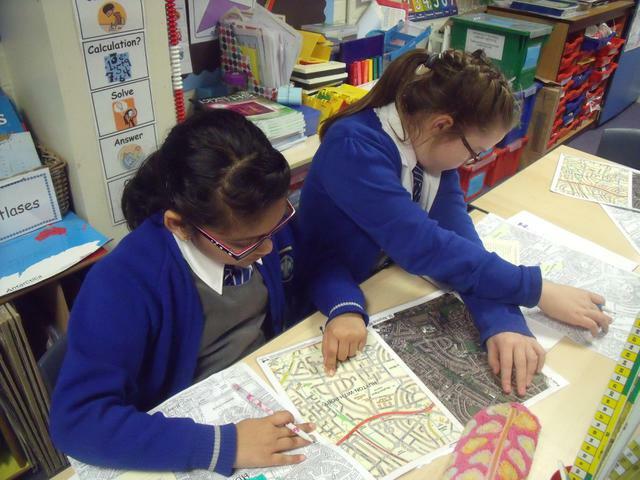 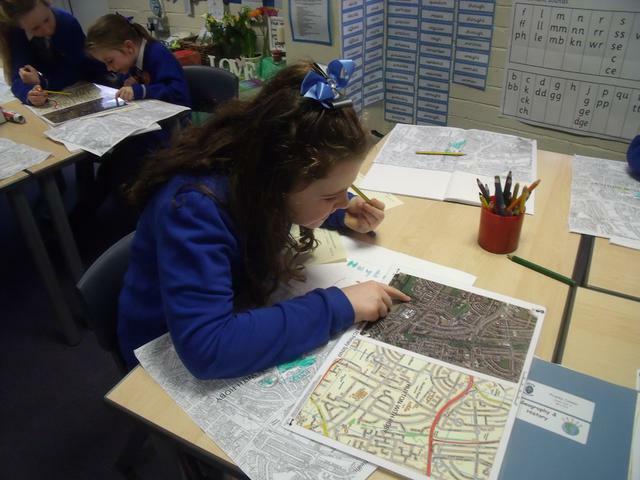 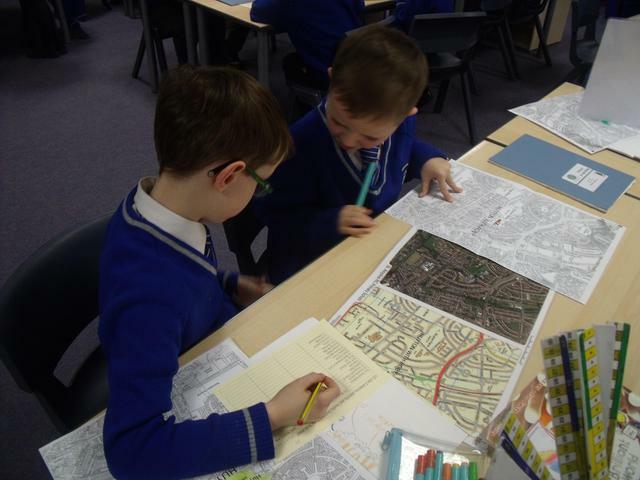 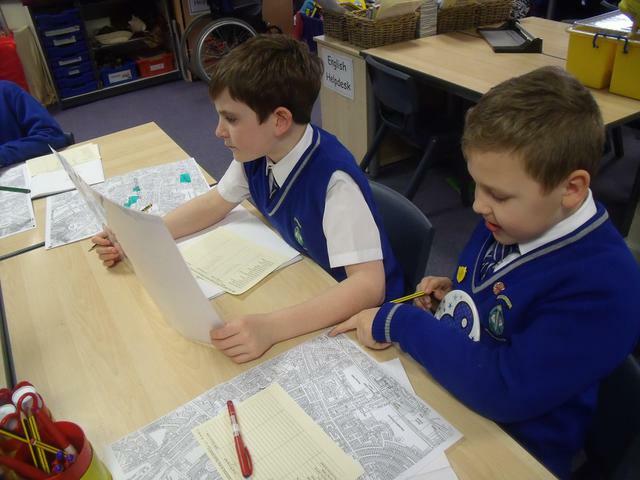 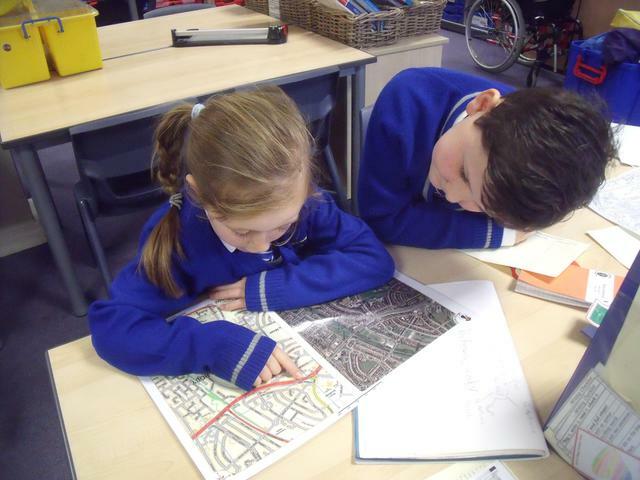 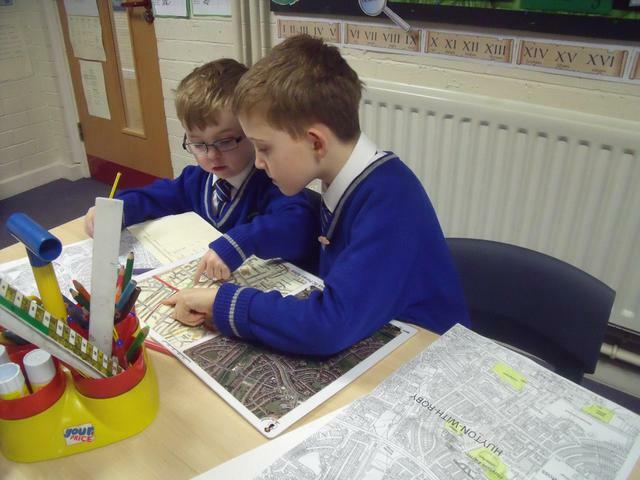 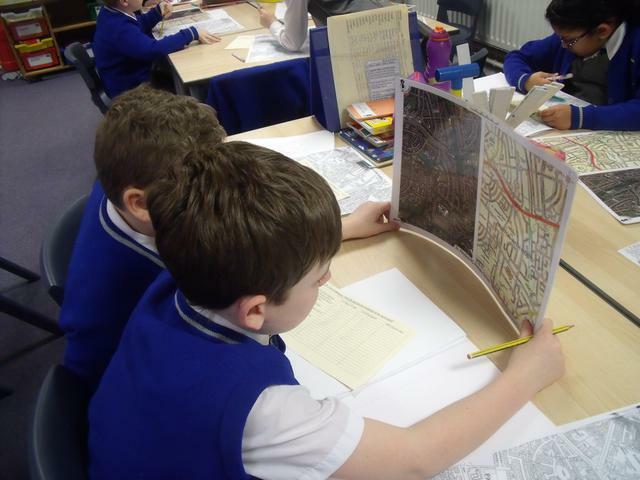 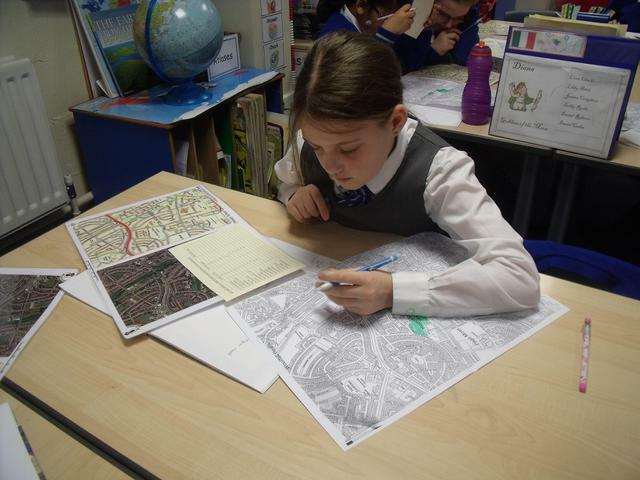 The children were fascinated using the map and aerial photo of our school and its surrounding area. 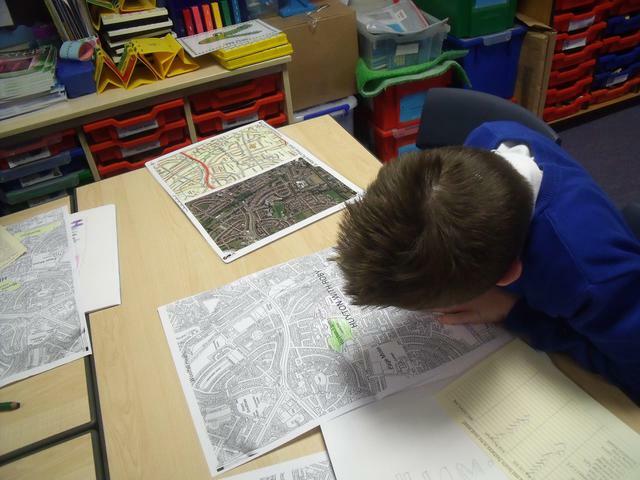 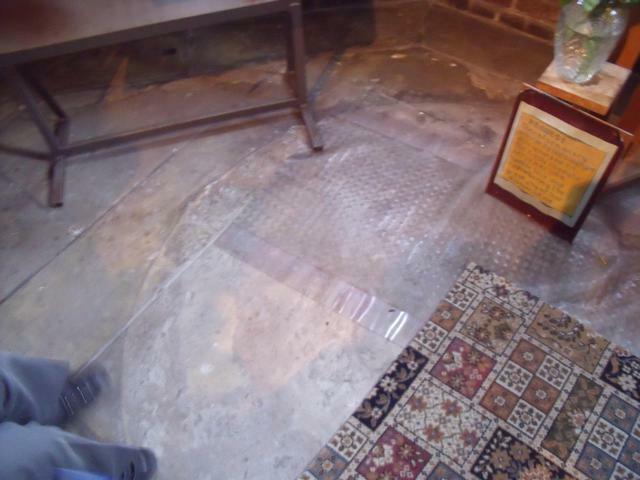 They had to locate lots of features on the map and photo. 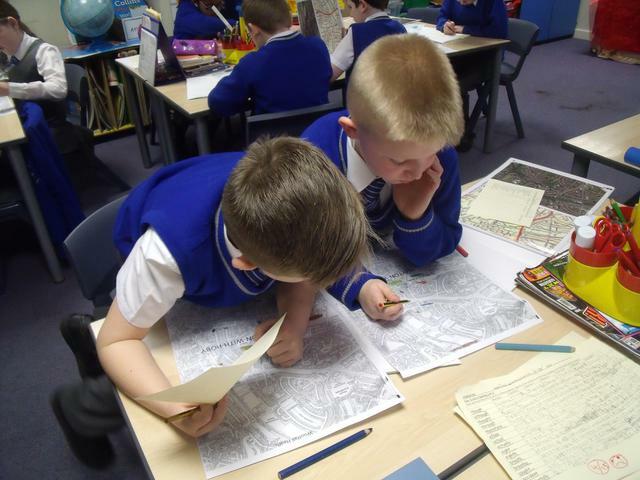 They had to record their observations onto another map. 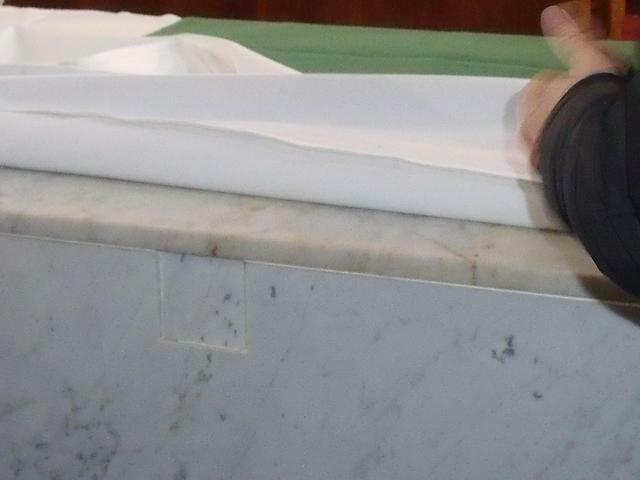 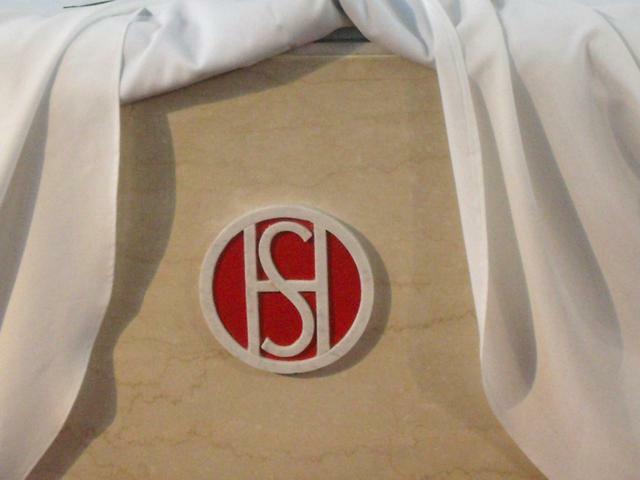 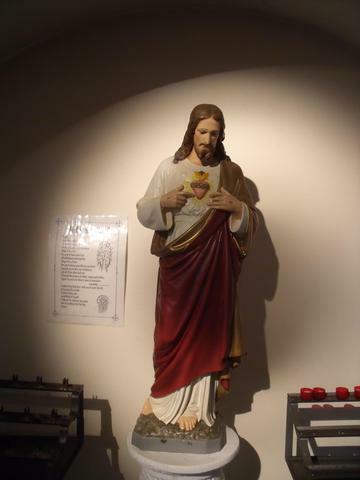 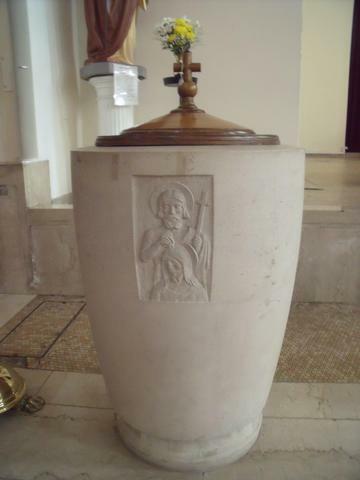 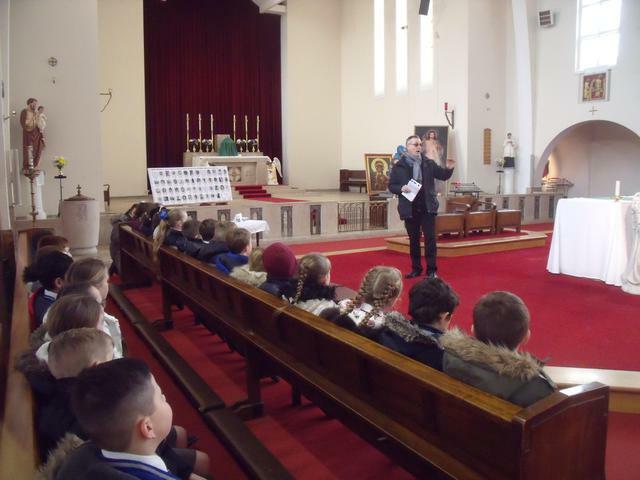 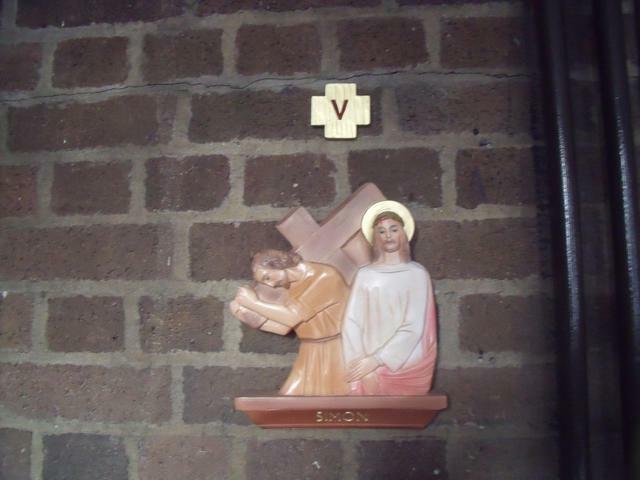 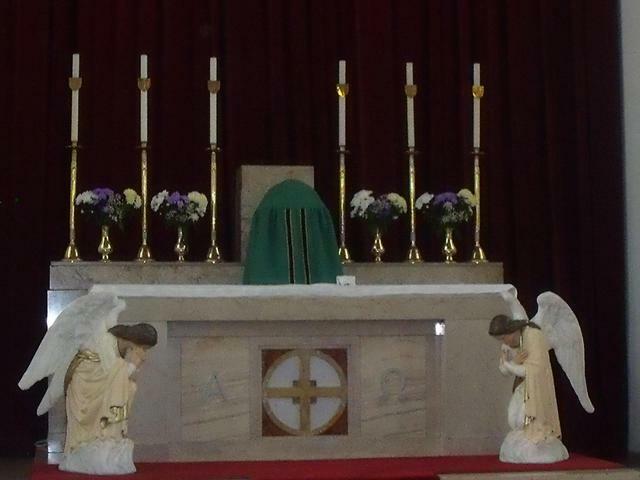 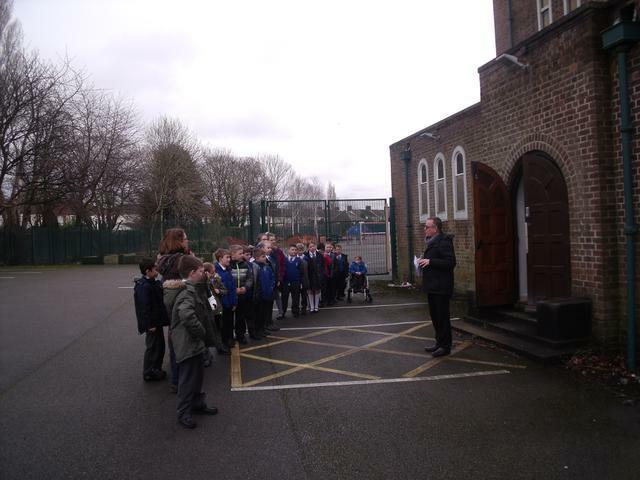 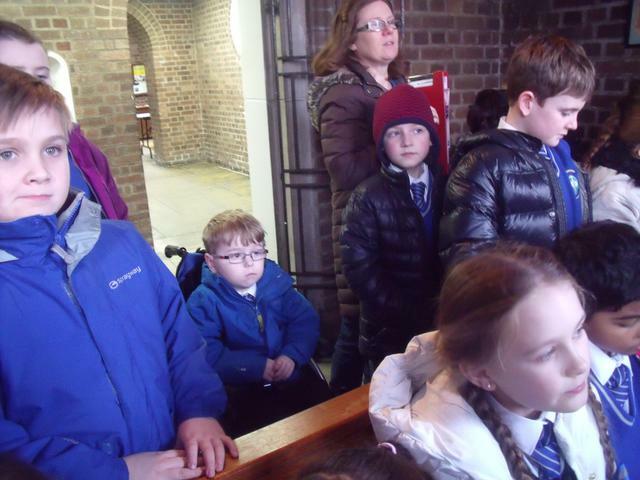 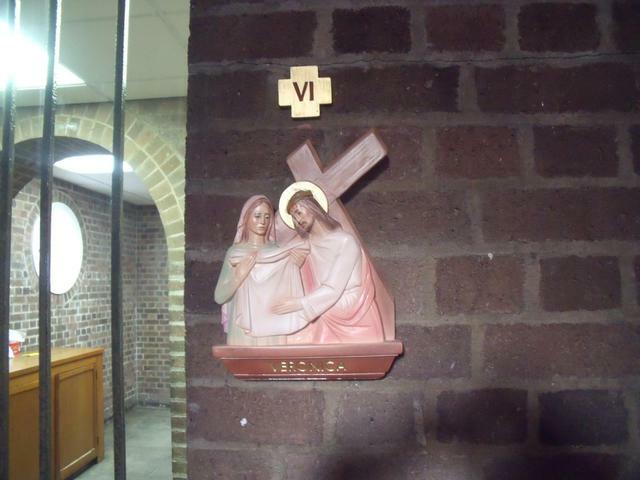 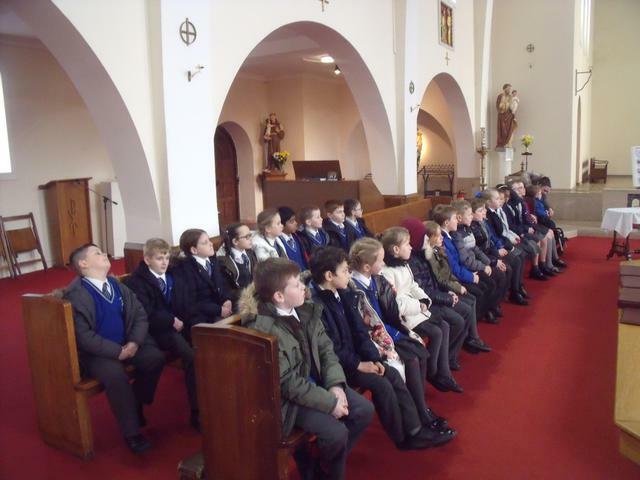 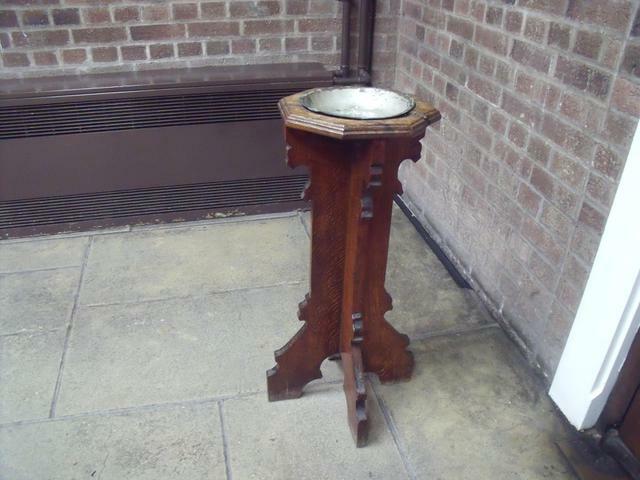 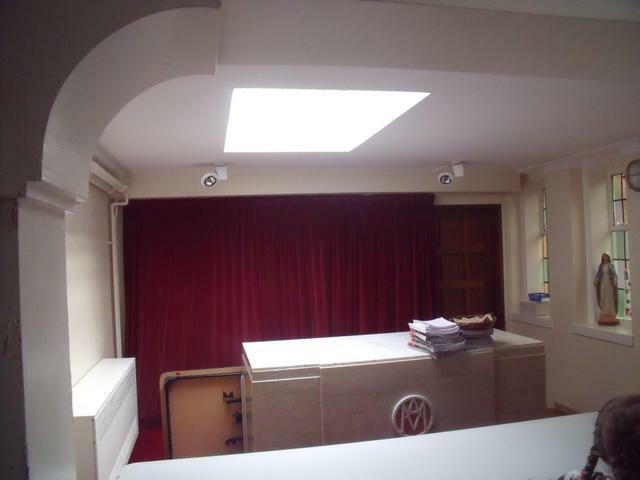 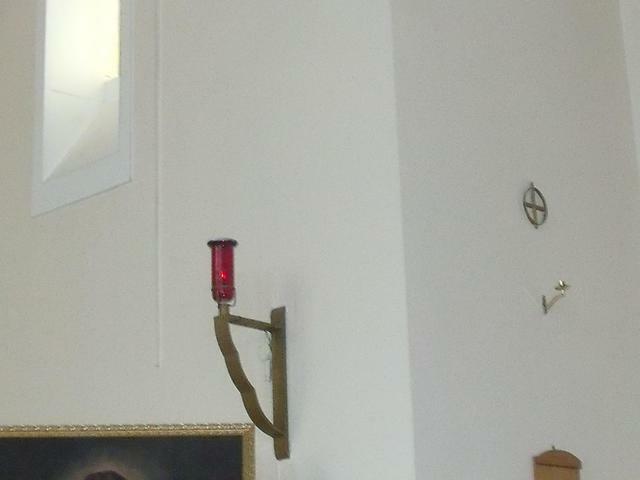 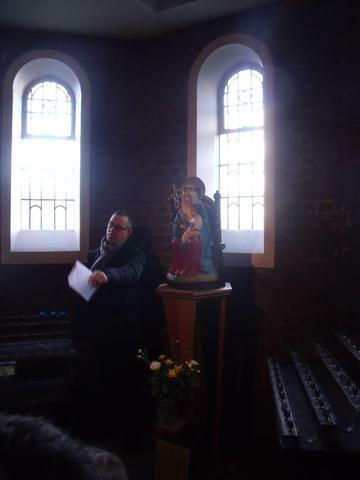 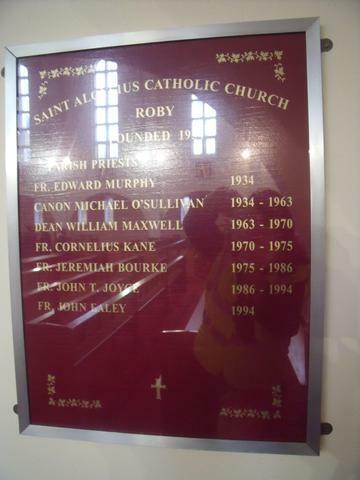 The children visited church to have a guided tour with Peter, who is the Parish's Pastoral Assistant. 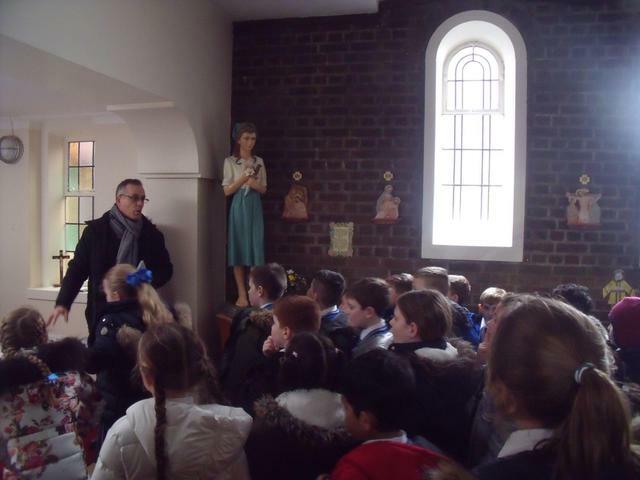 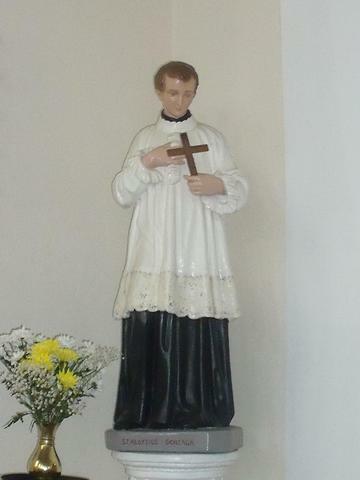 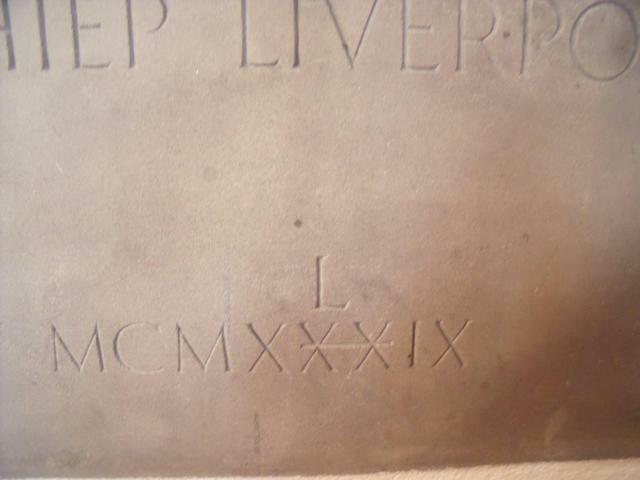 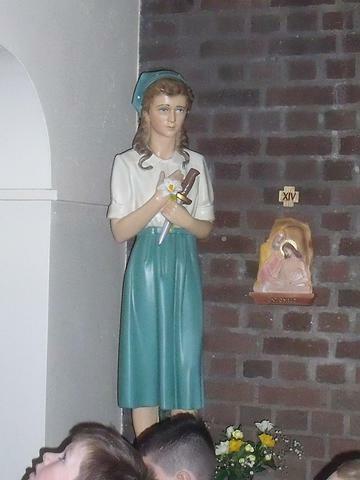 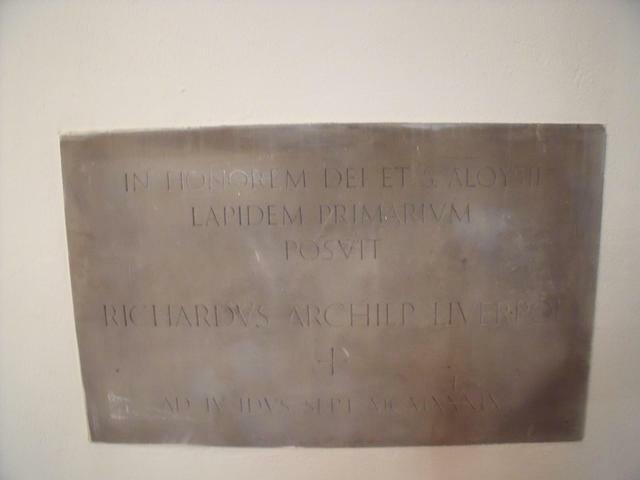 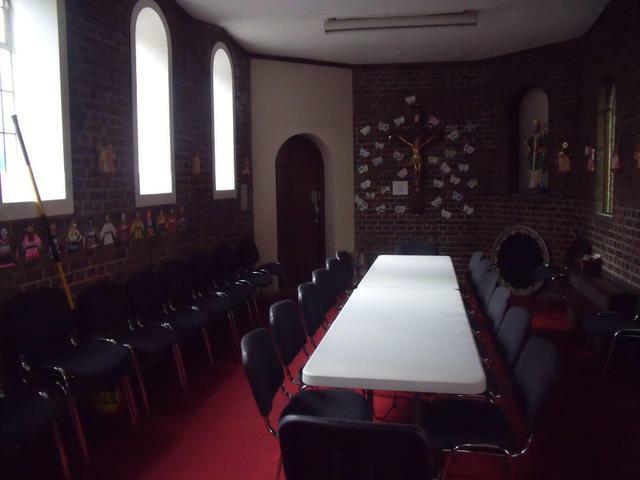 The visit was excellent, we learnt a lot of new information, asked a lot of interesting questions about the church and Peter's role within it. 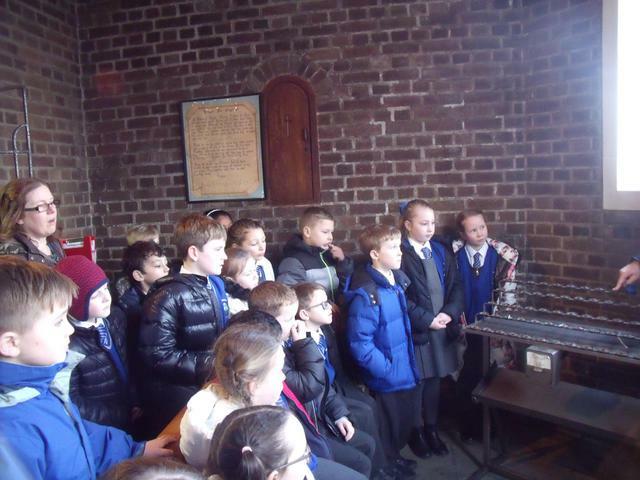 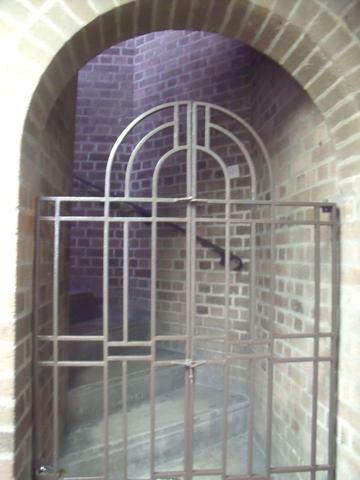 We would like to go again! 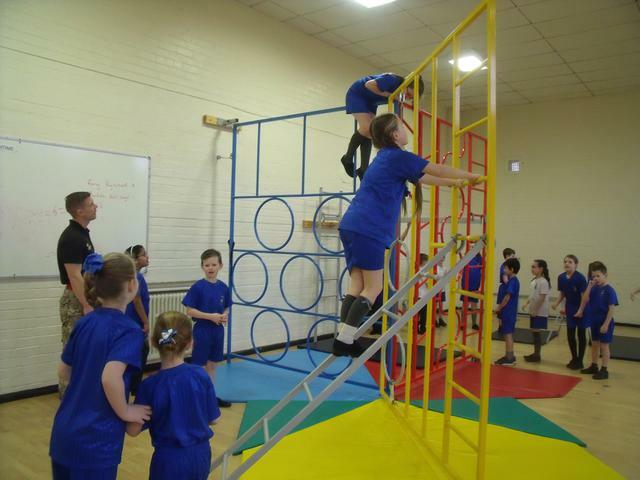 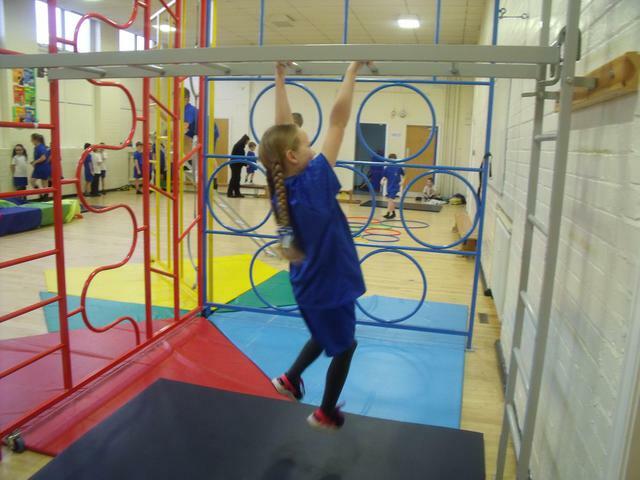 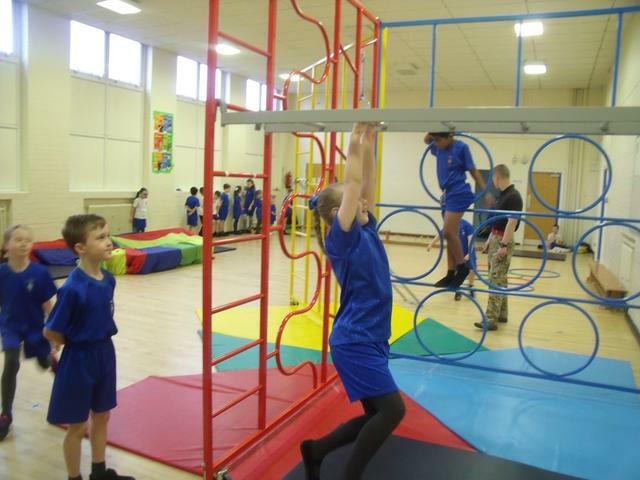 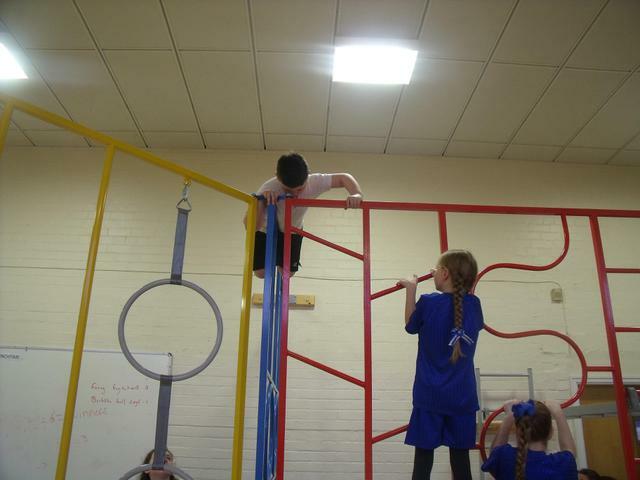 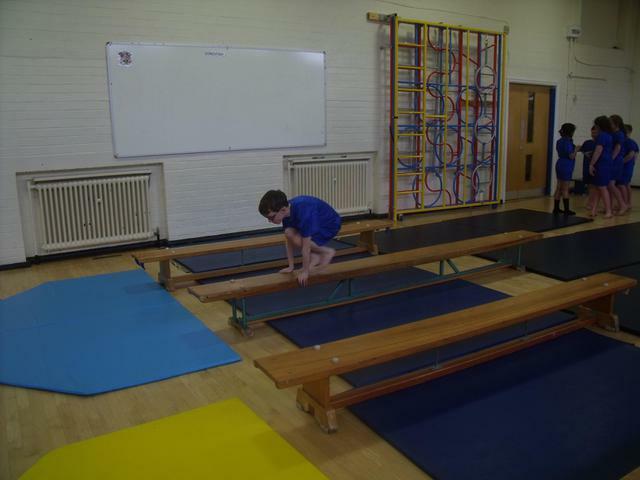 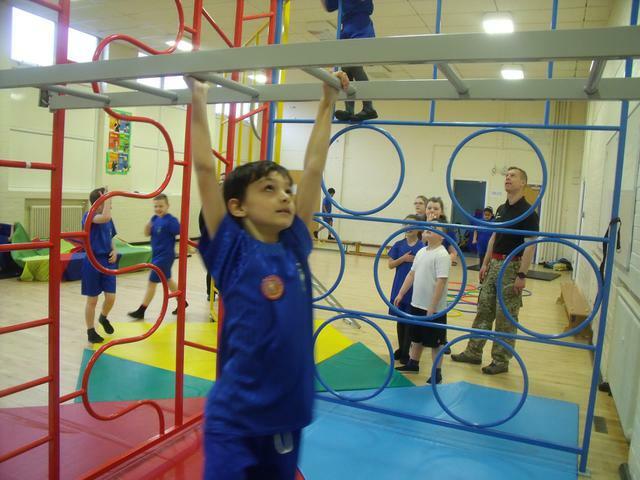 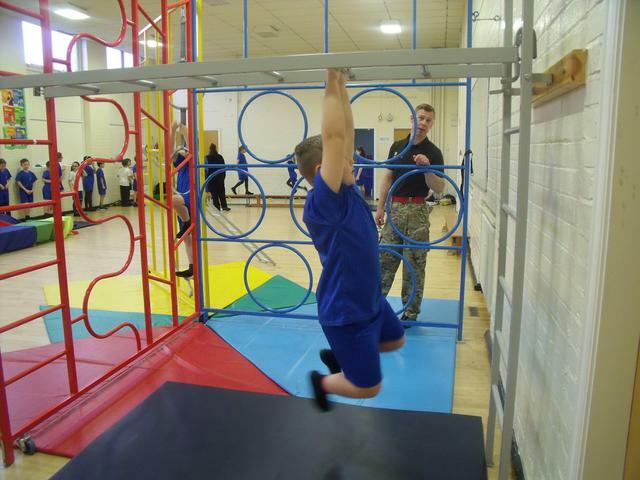 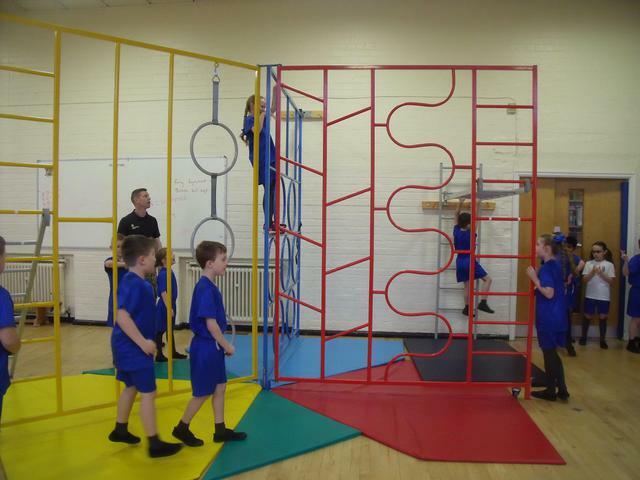 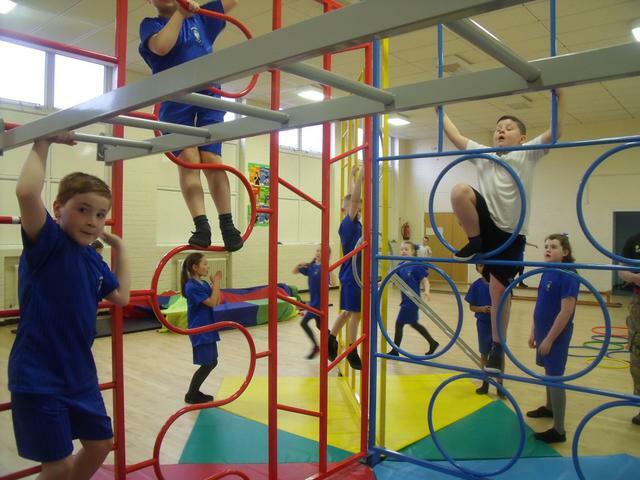 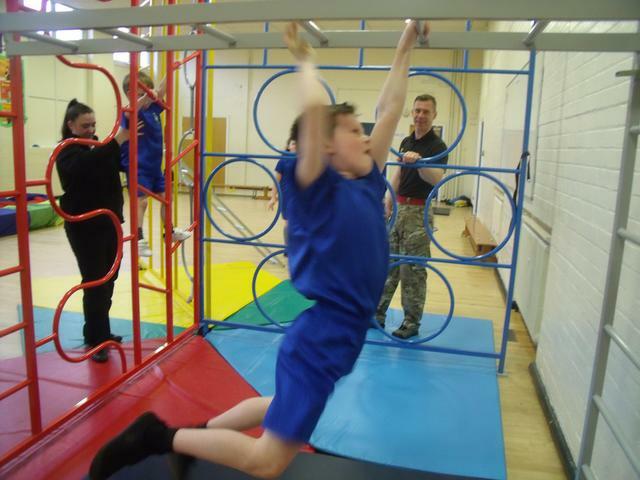 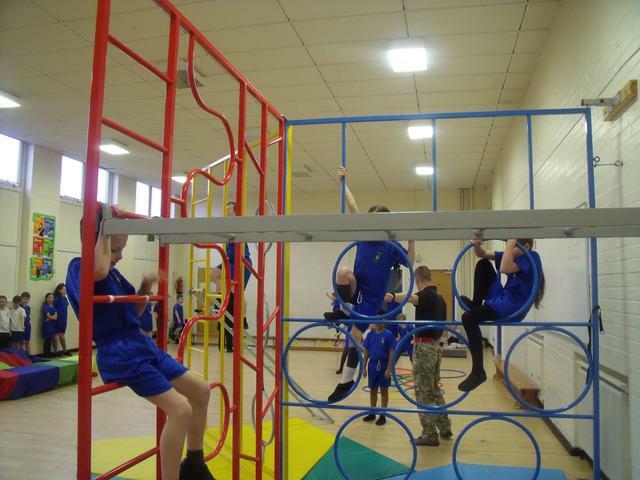 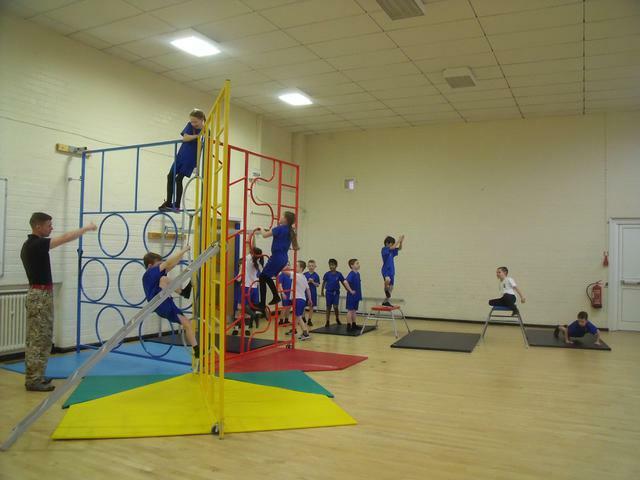 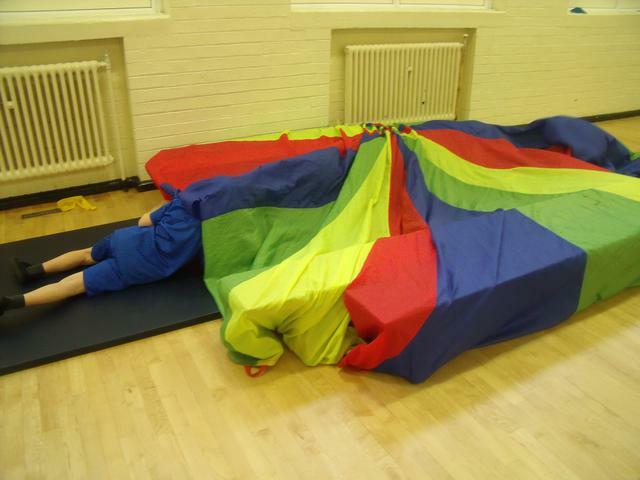 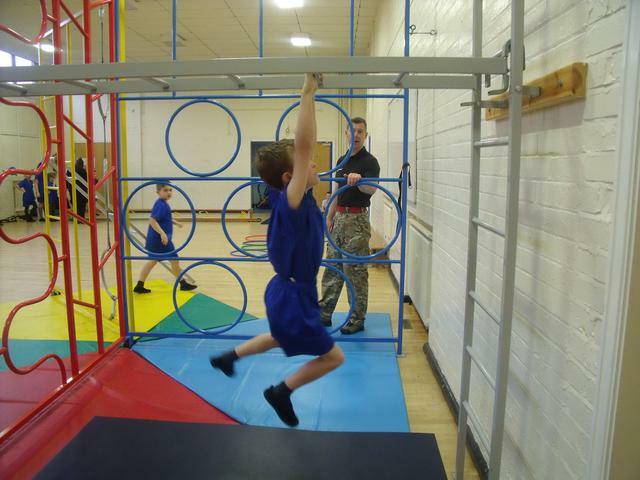 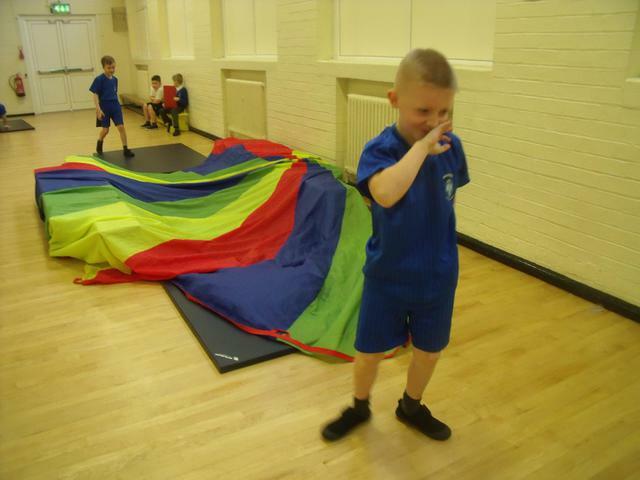 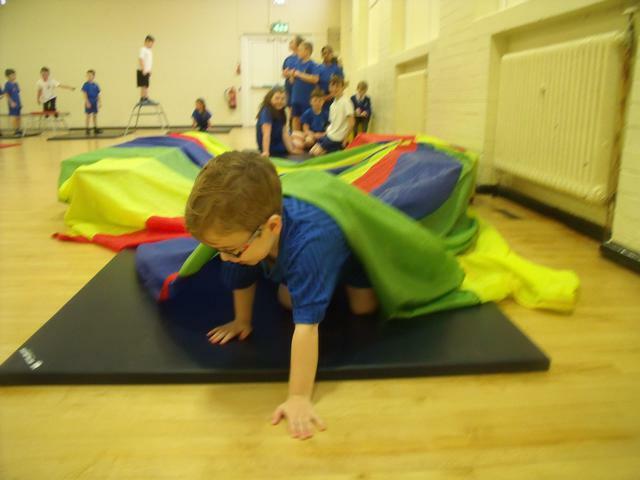 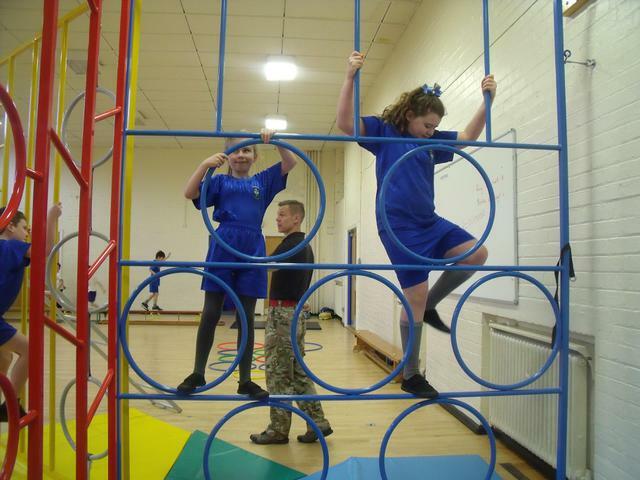 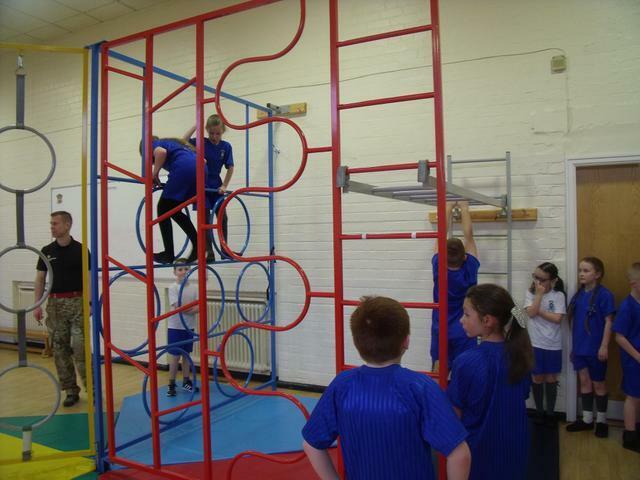 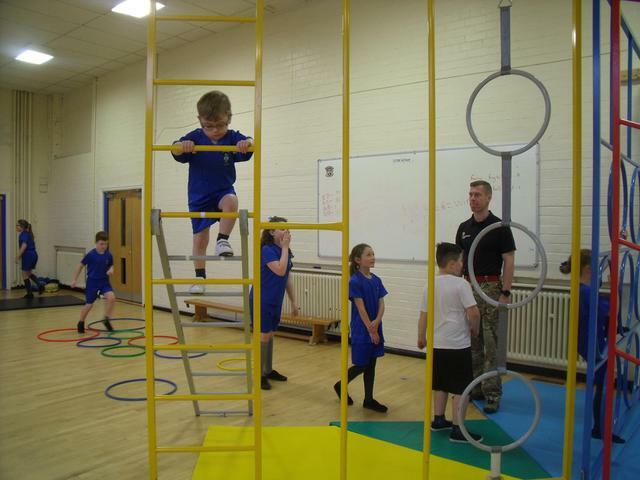 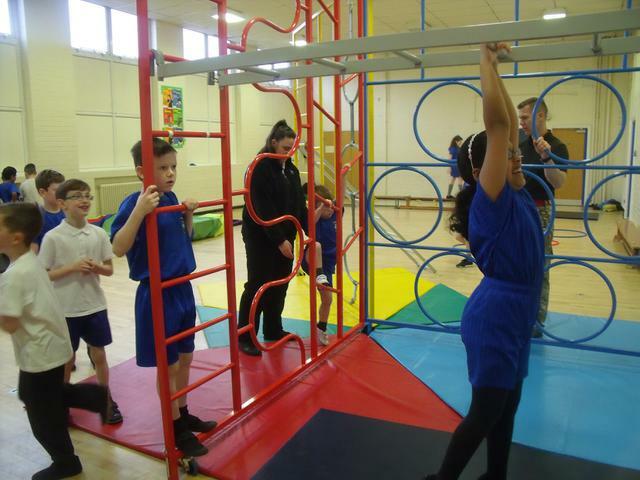 The children had a brilliant time in Commando Joe's lesson this week-8/2/16- as they used the climbing frame as part of a gymnastics/assault course type lesson. 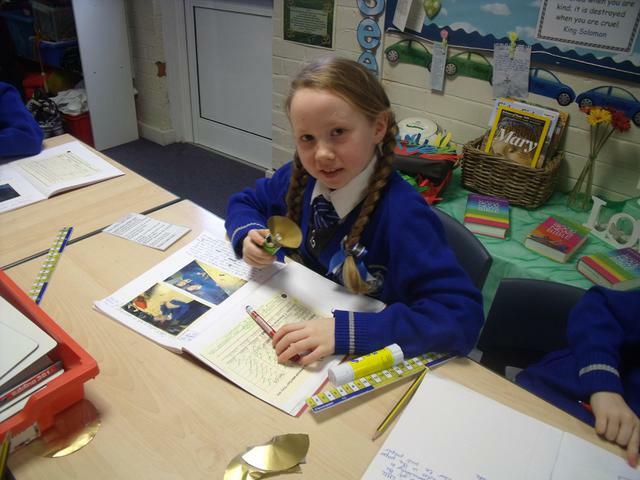 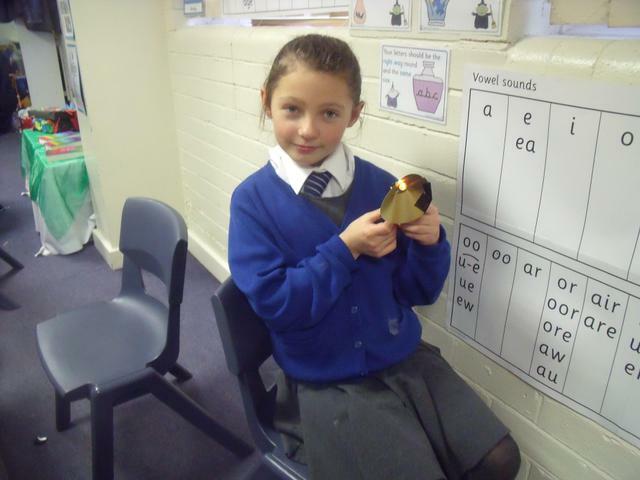 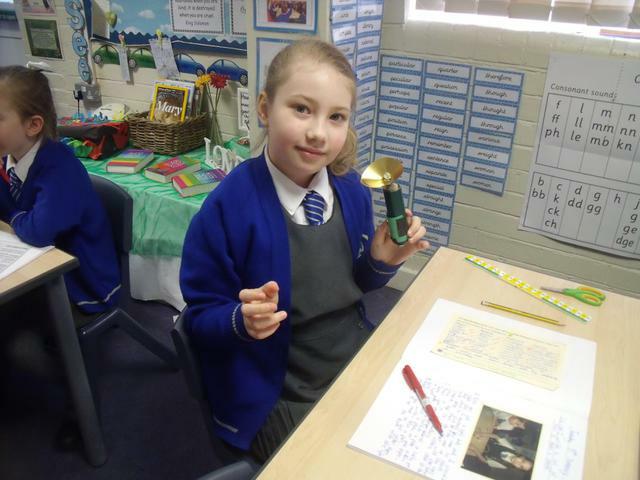 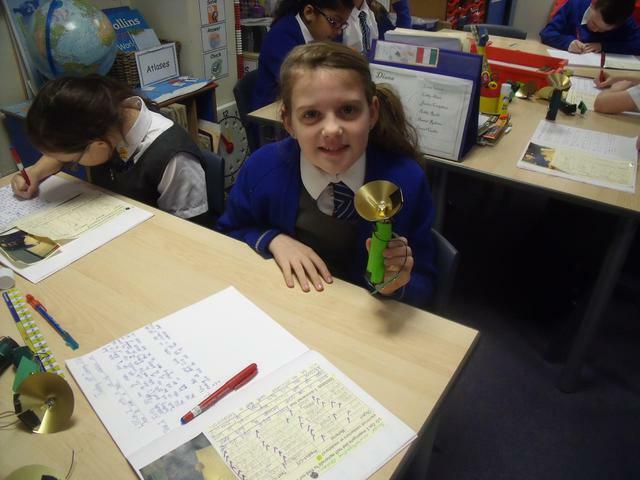 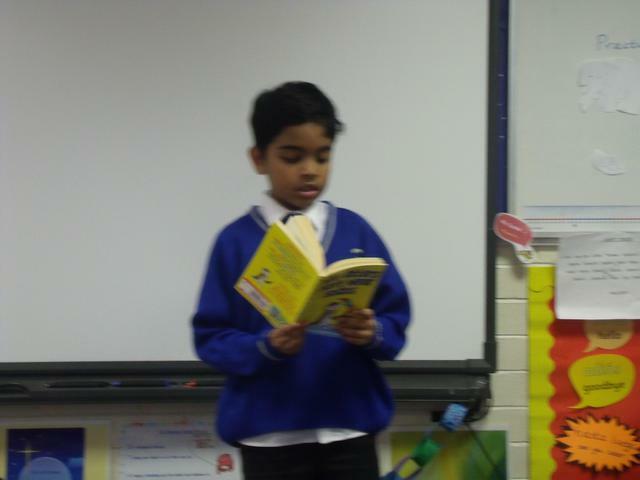 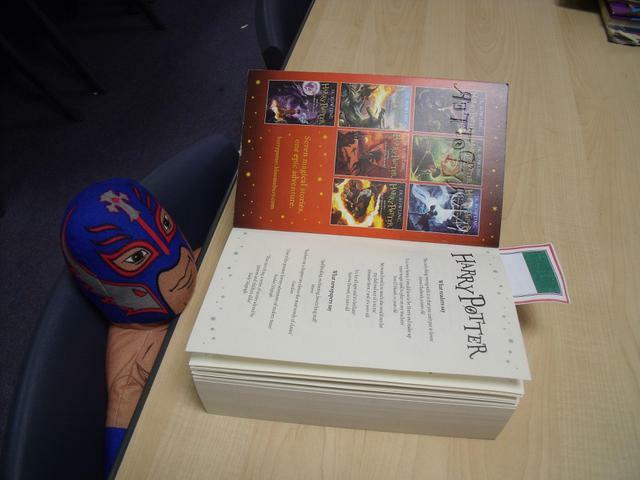 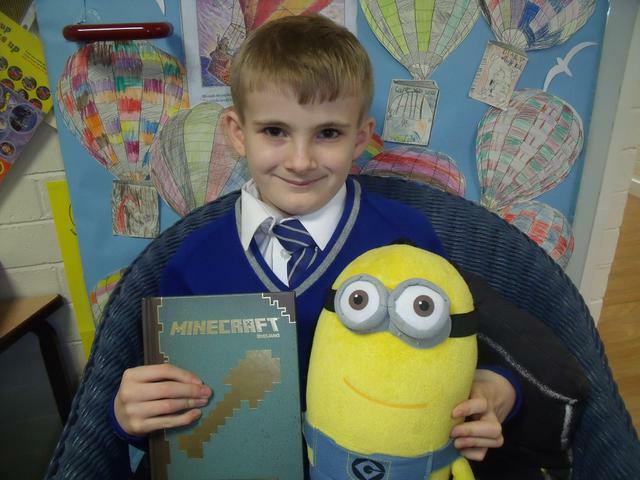 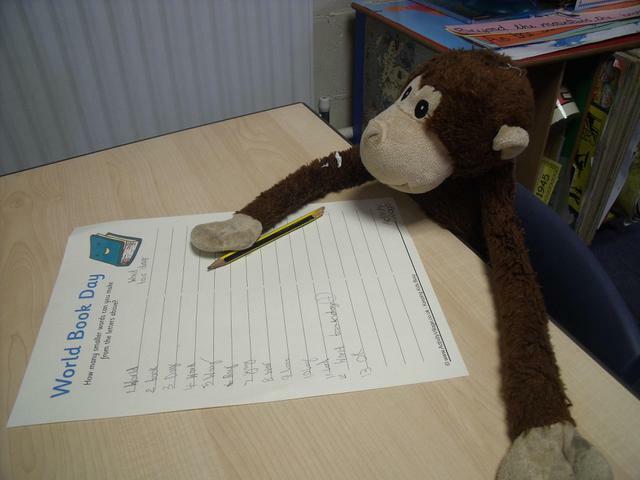 The children have been reading and composing poetry over the last three weeks. 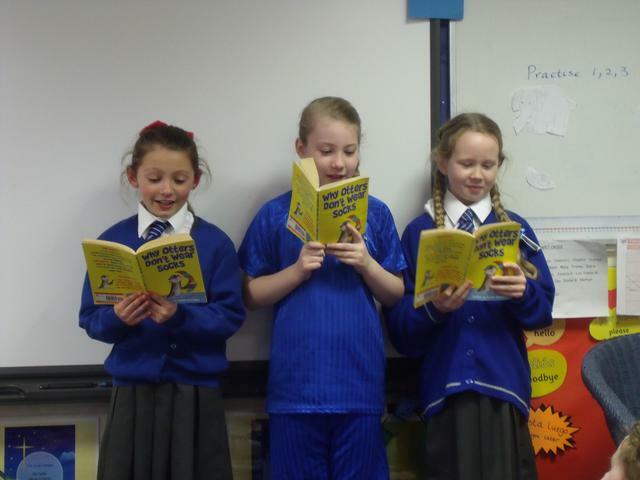 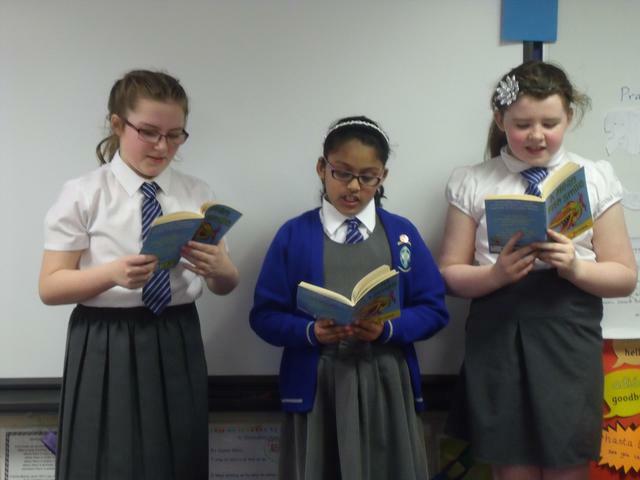 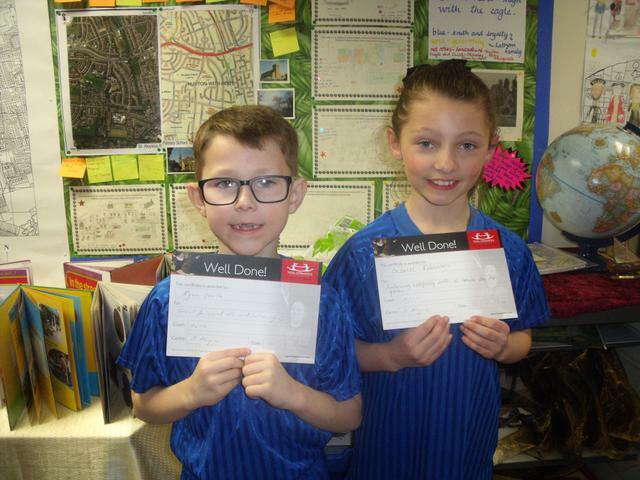 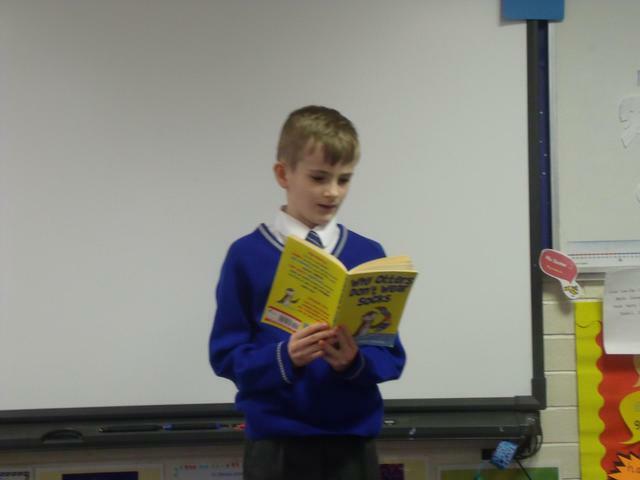 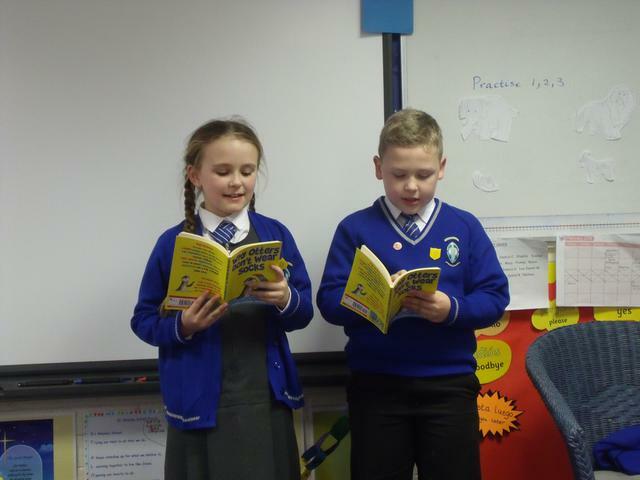 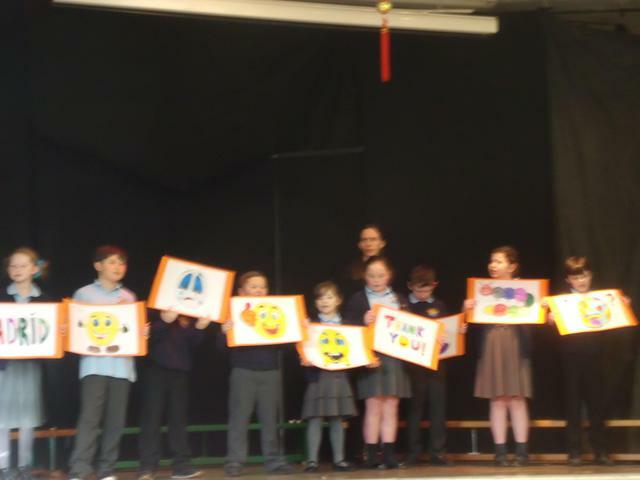 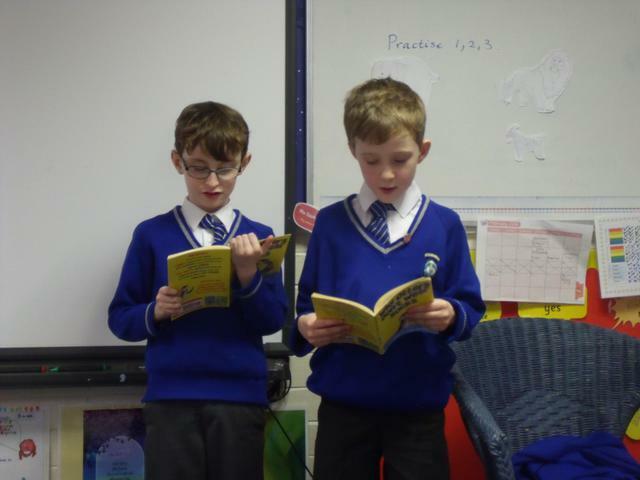 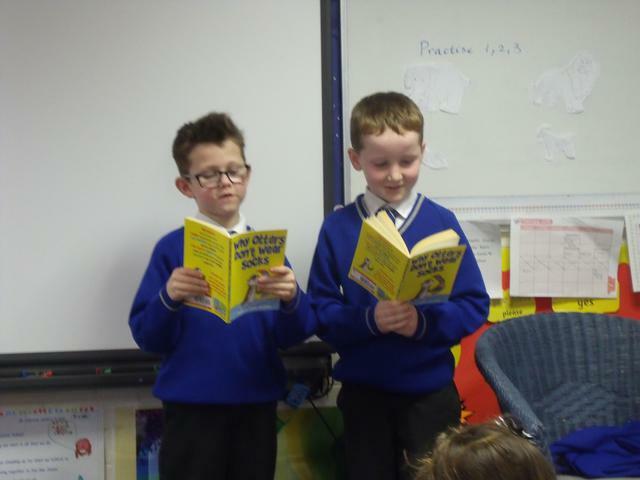 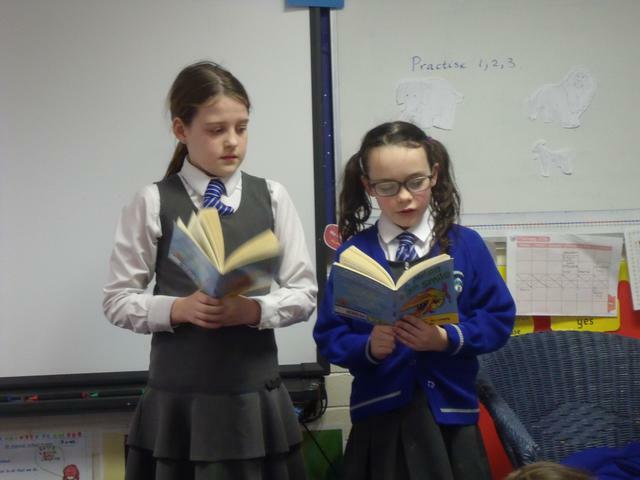 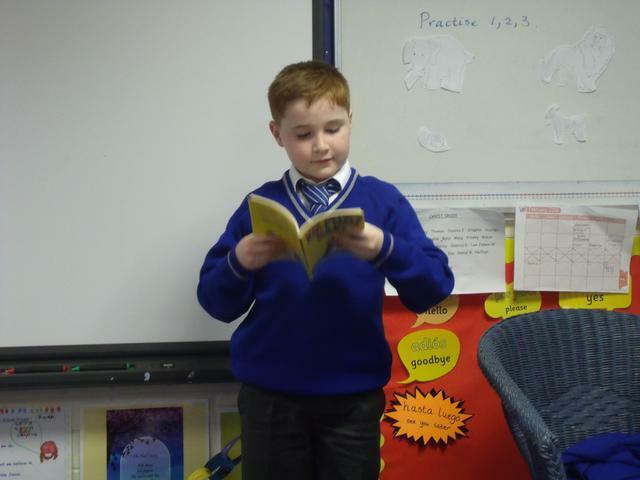 They have entered a Poetry competition and have composed poems about different kinds of Emotions.This week they have been reading compilations of poetry and performing their favourite poems to the class. 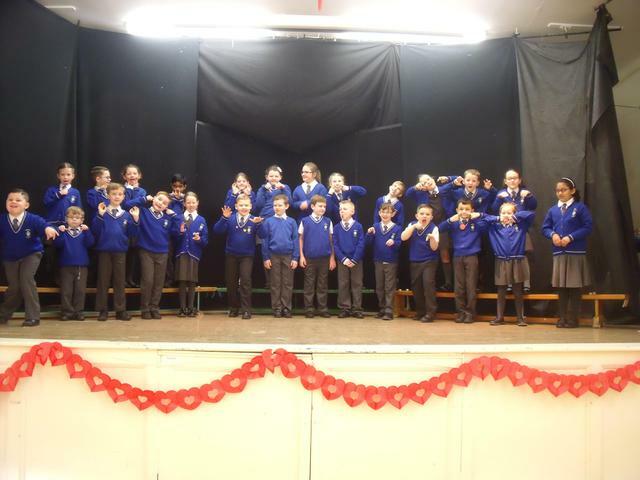 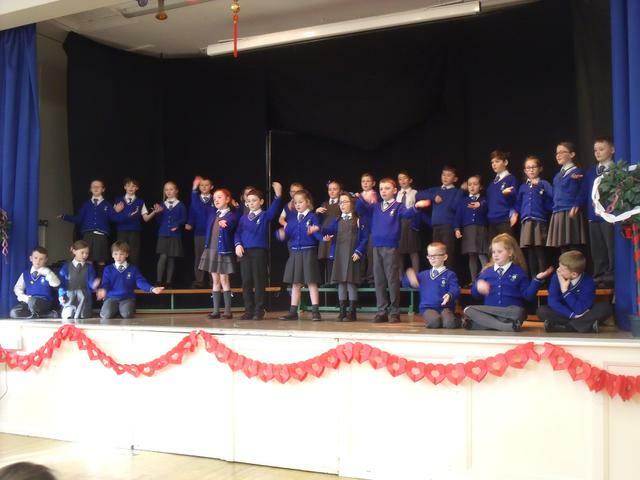 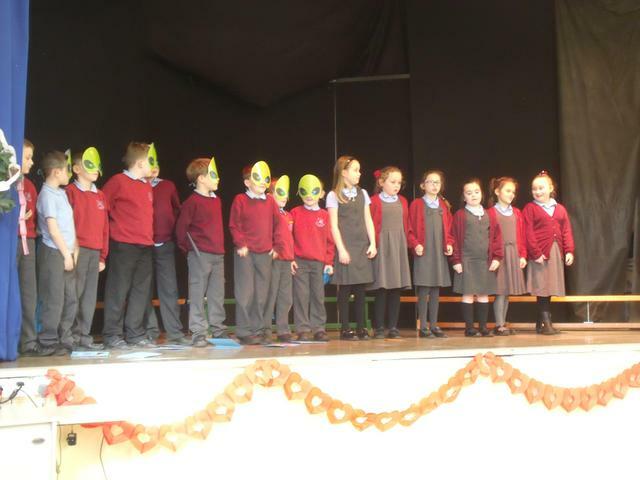 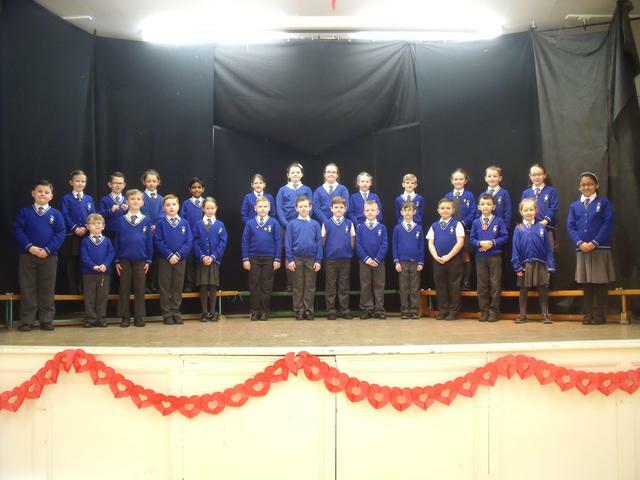 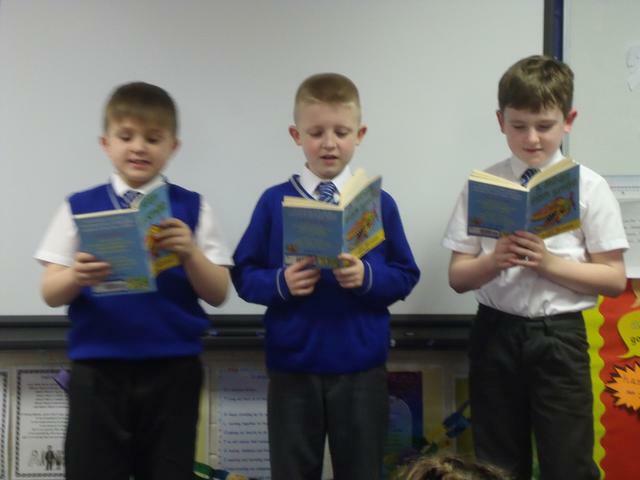 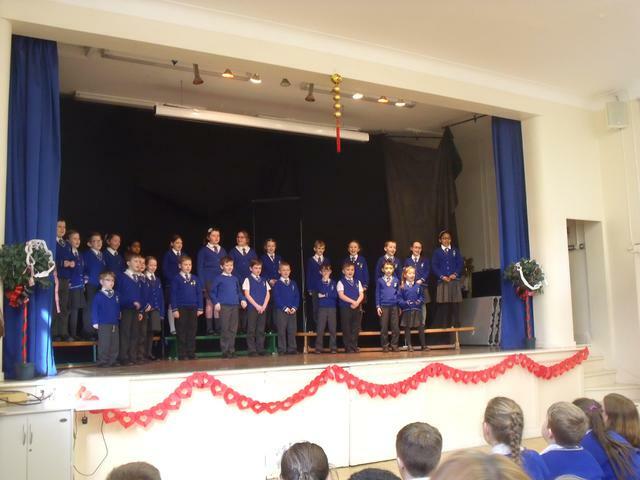 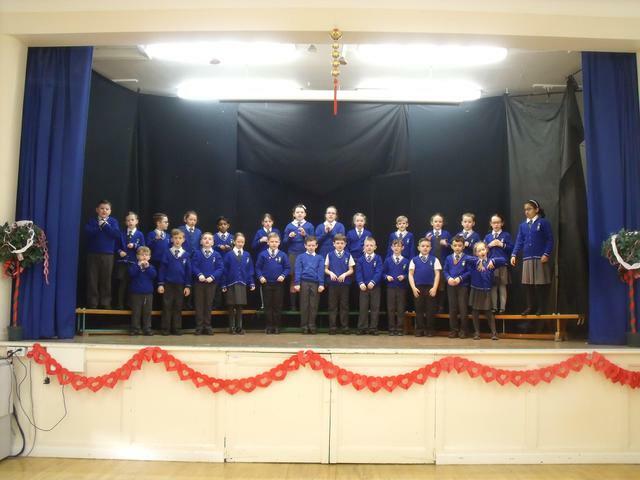 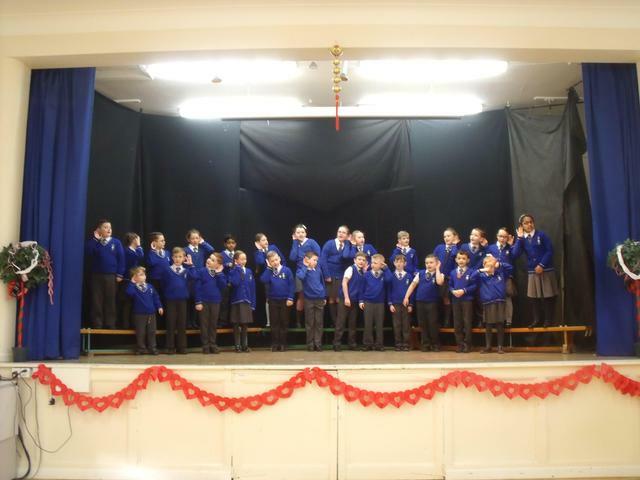 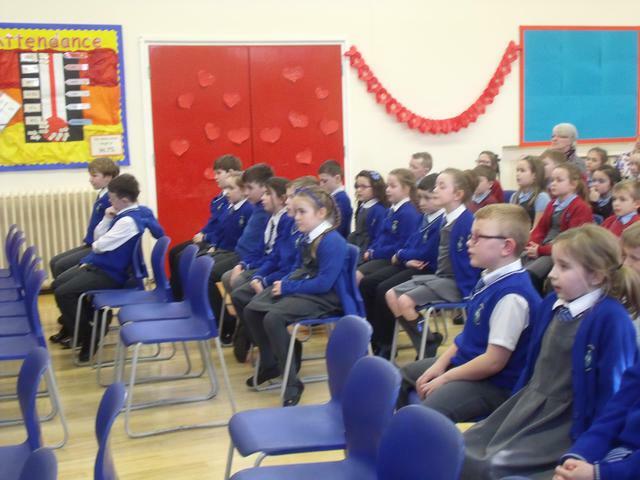 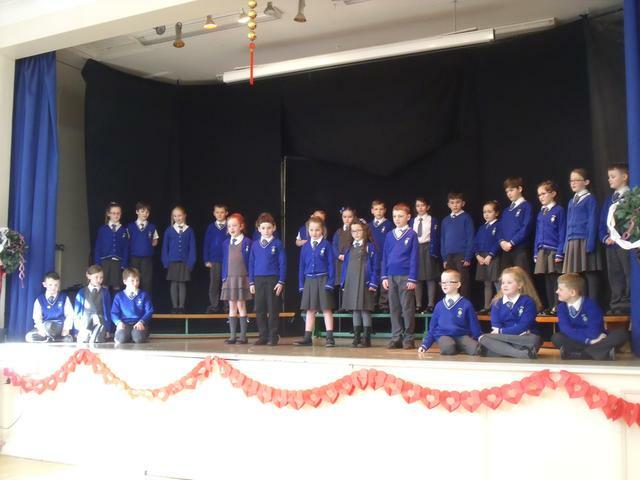 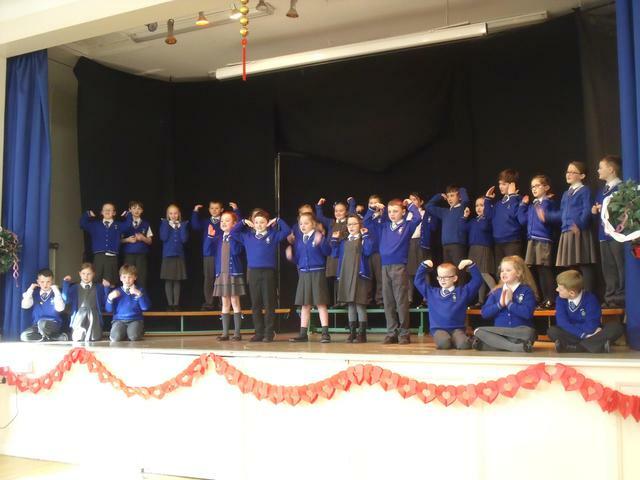 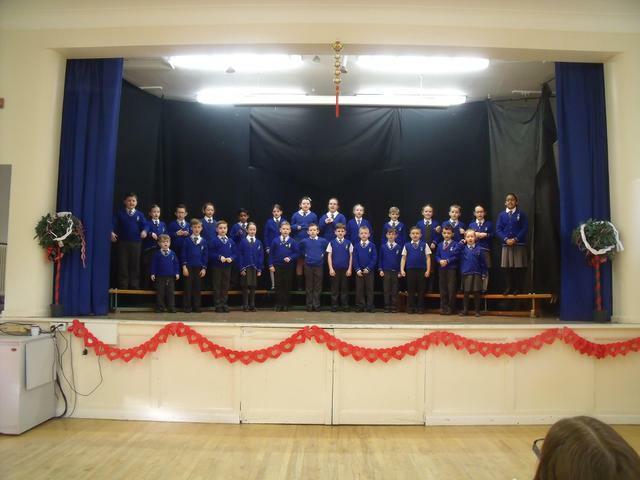 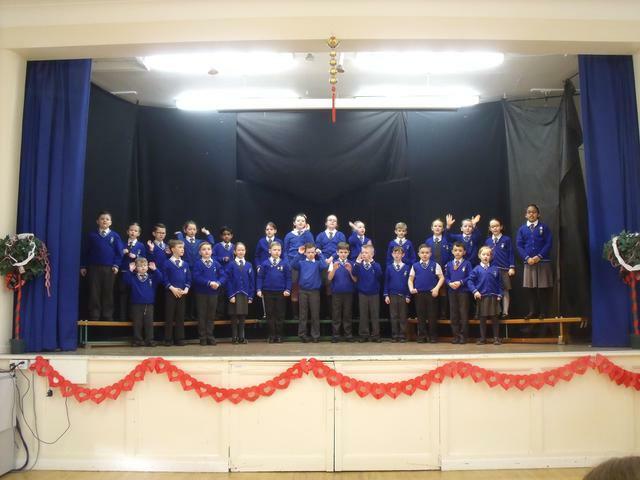 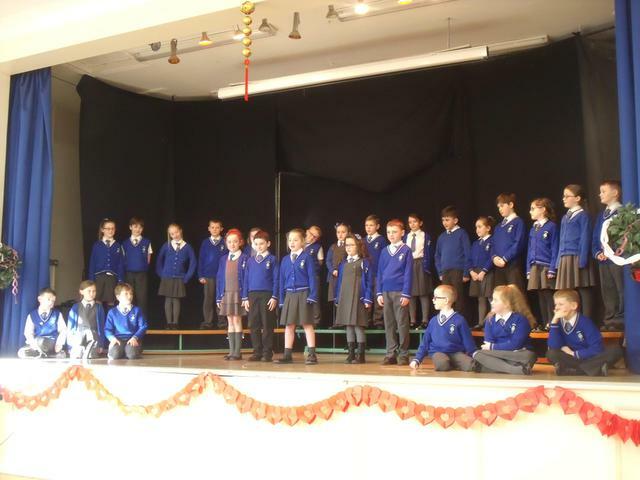 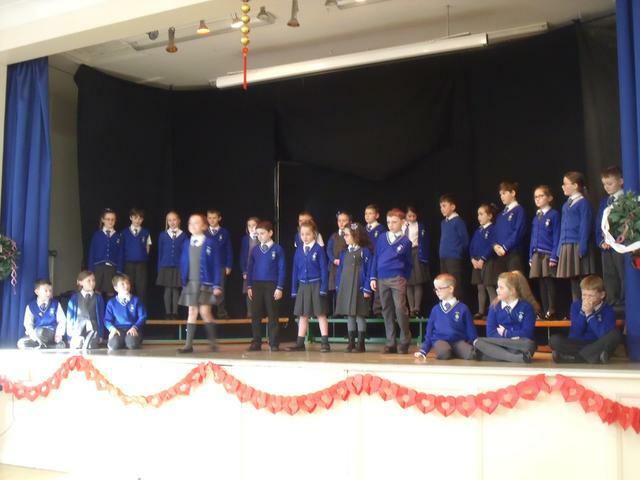 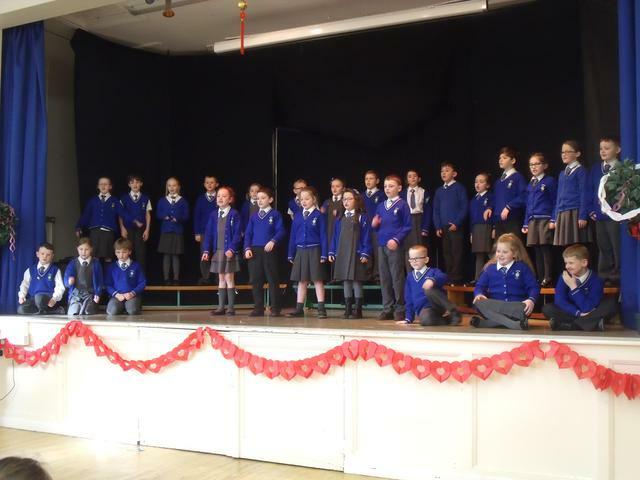 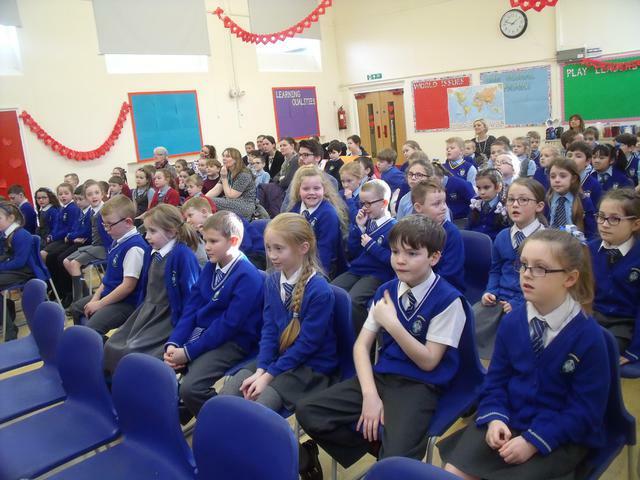 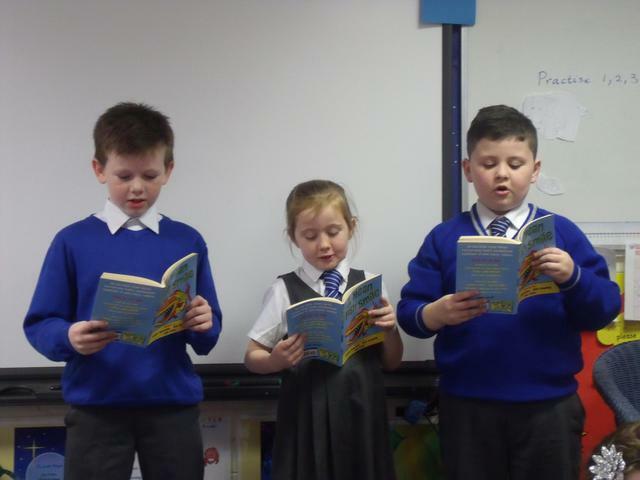 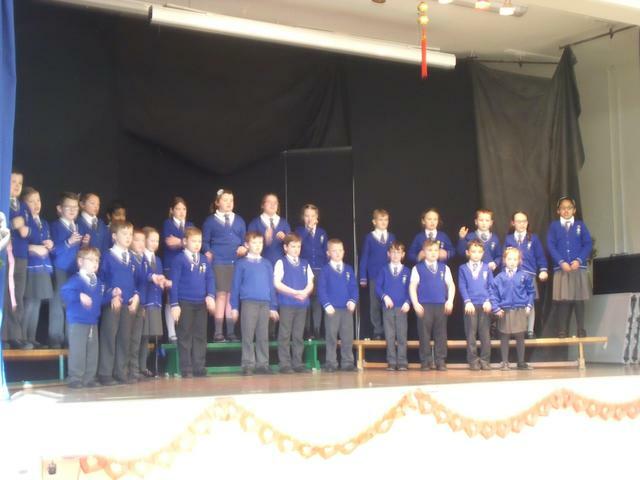 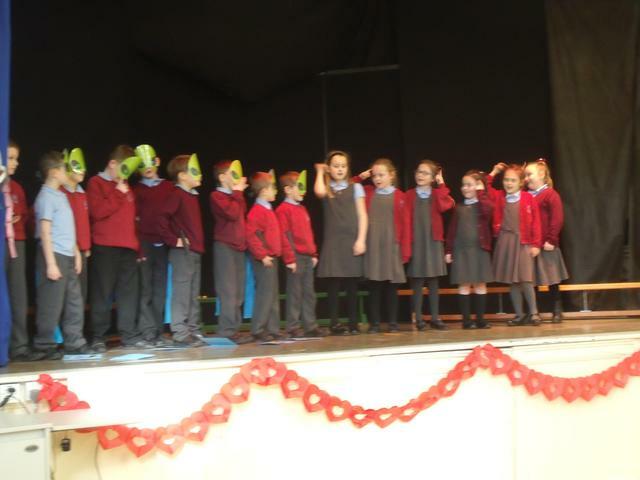 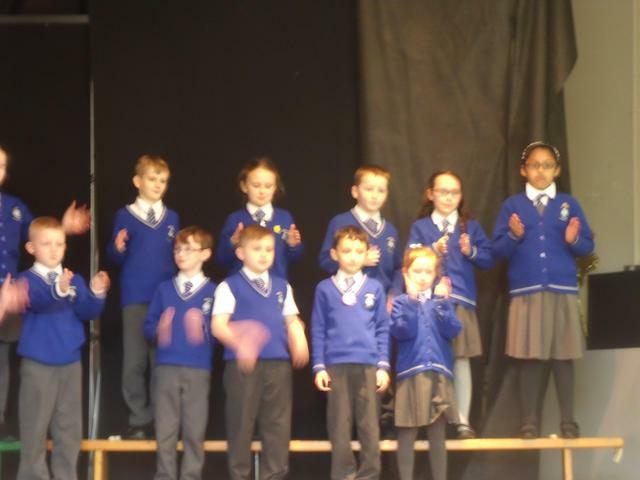 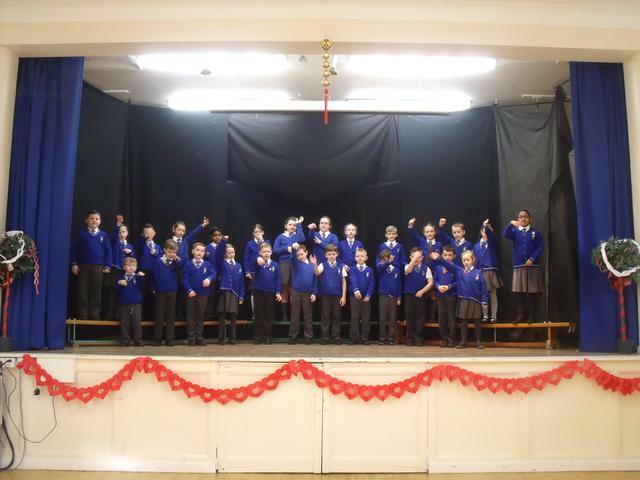 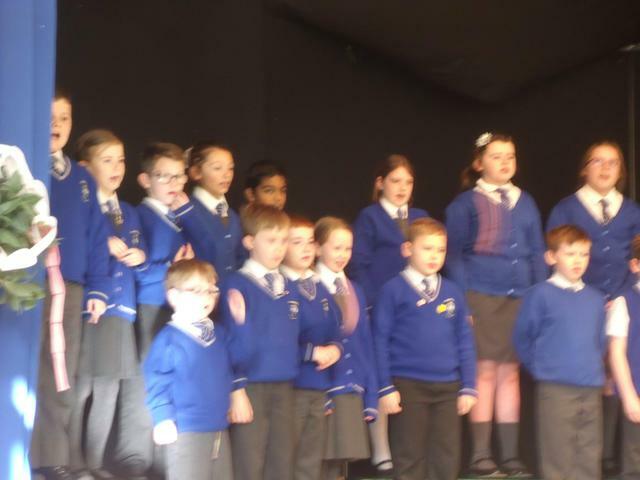 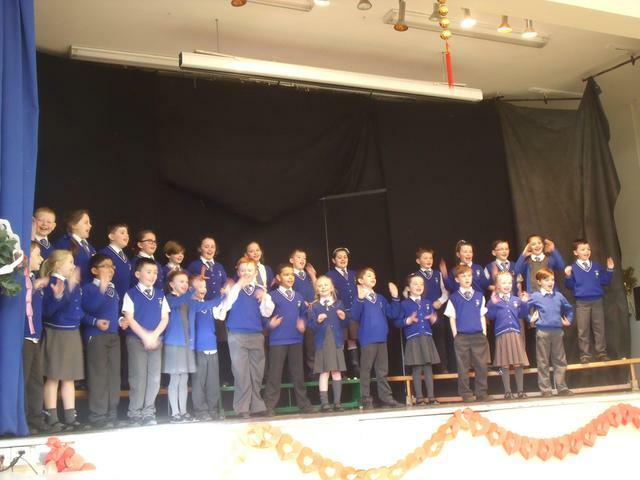 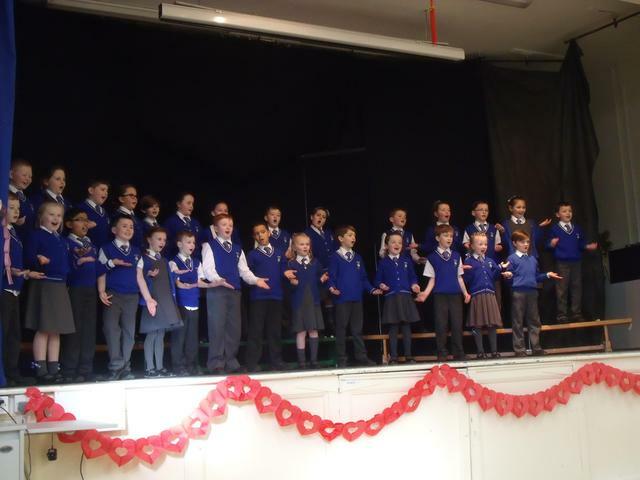 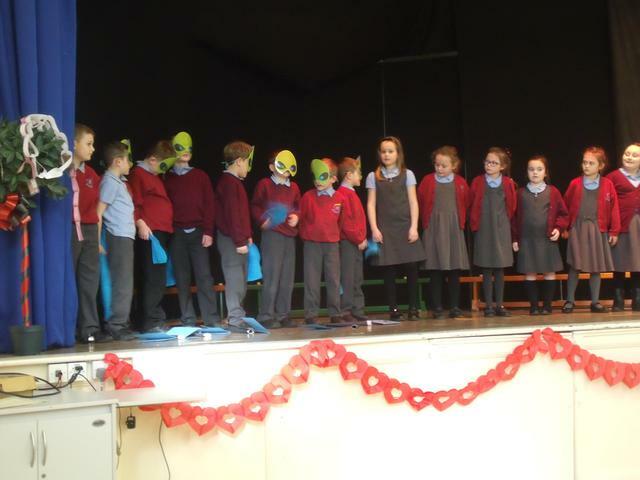 Our class performed this classic poem 'The Four Friends' by A.A.Milne to other Year 3 and 4 classes from our school and from St. Aidan's, Mosscroft Primary and Central Primary. 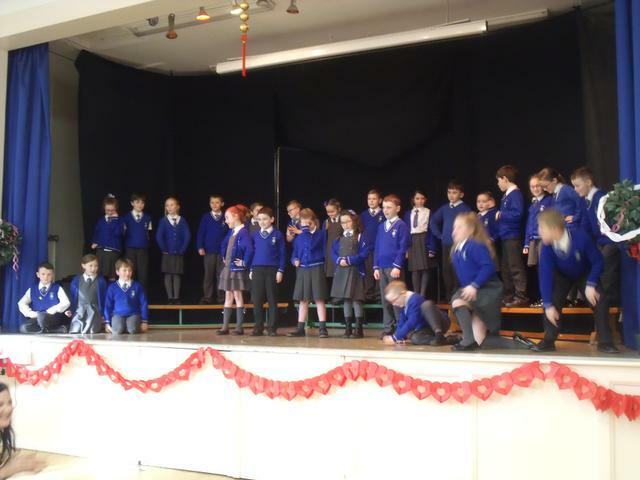 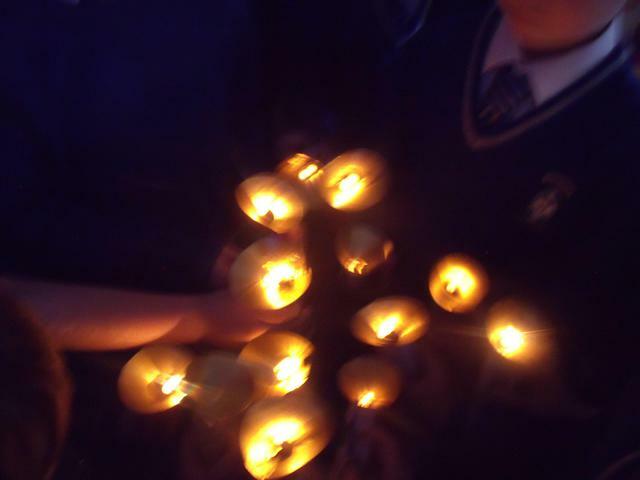 The children performed this poem beautifully. 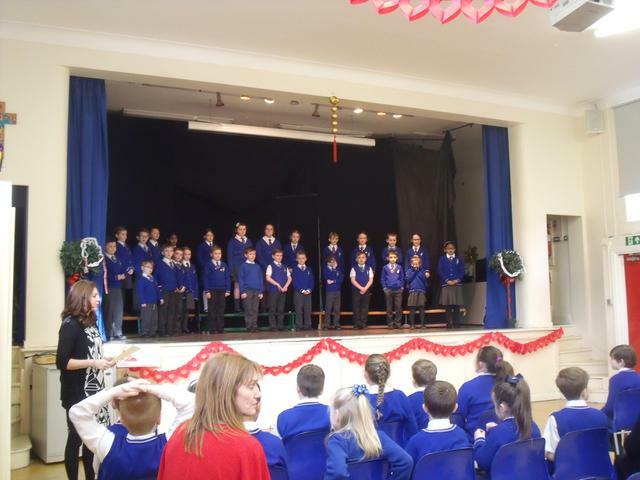 They were word perfect, had great intonation and expression. 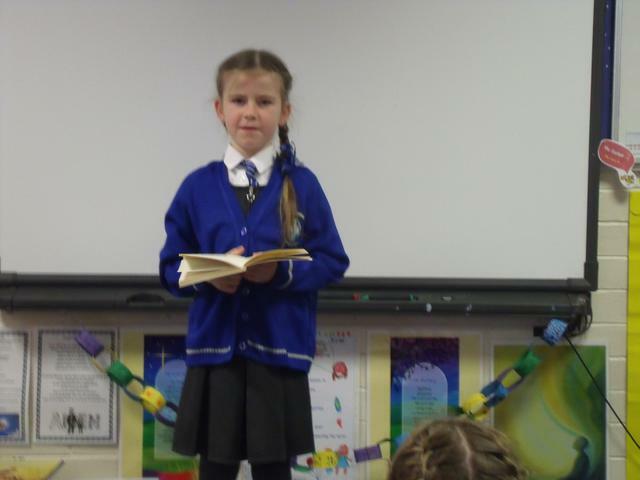 They should be really proud of themselves and I know they all worked really hard to learn this poem off by heart! 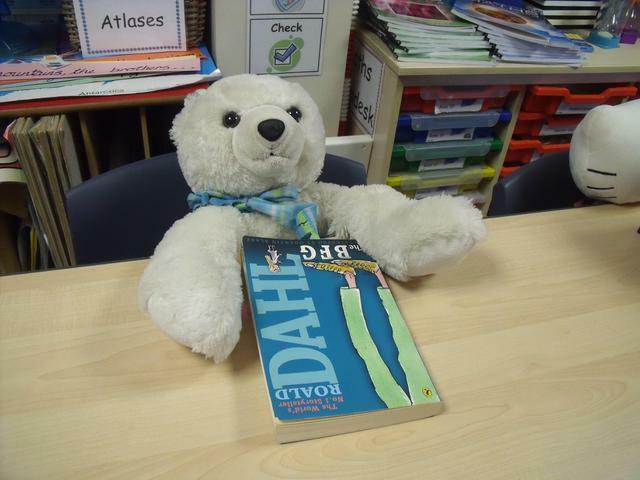 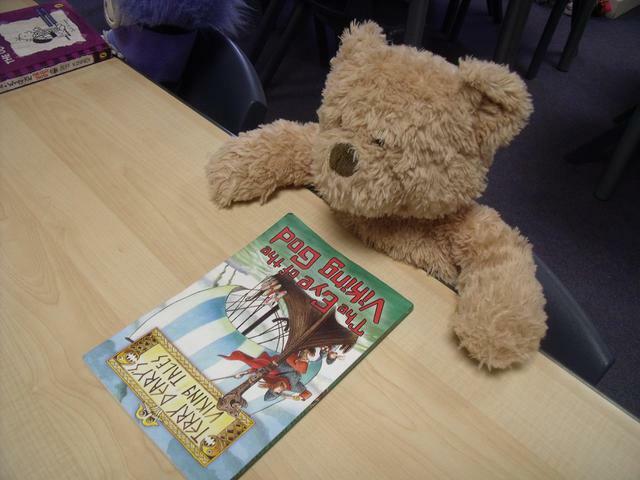 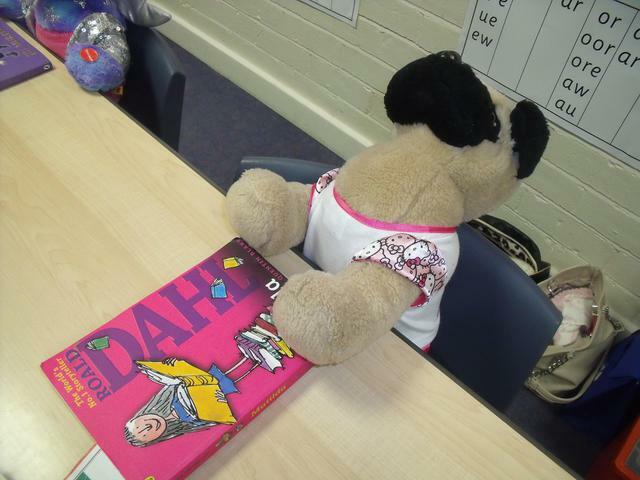 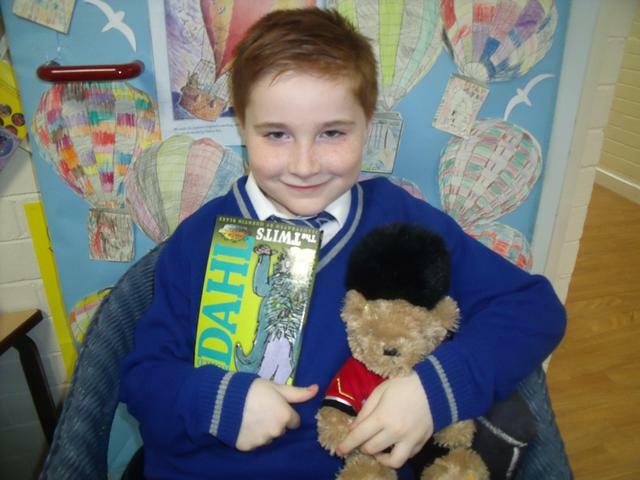 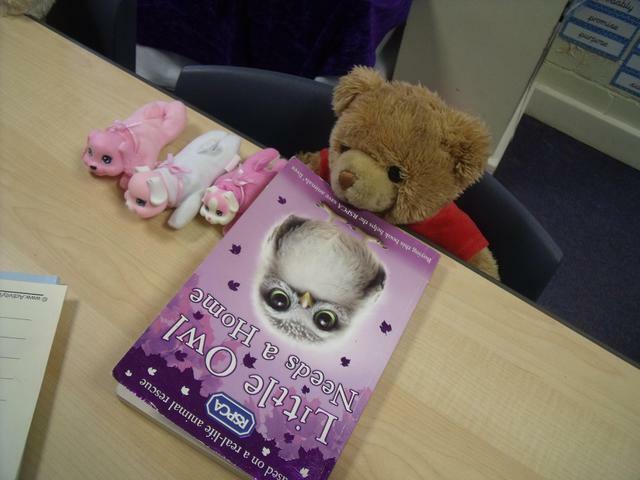 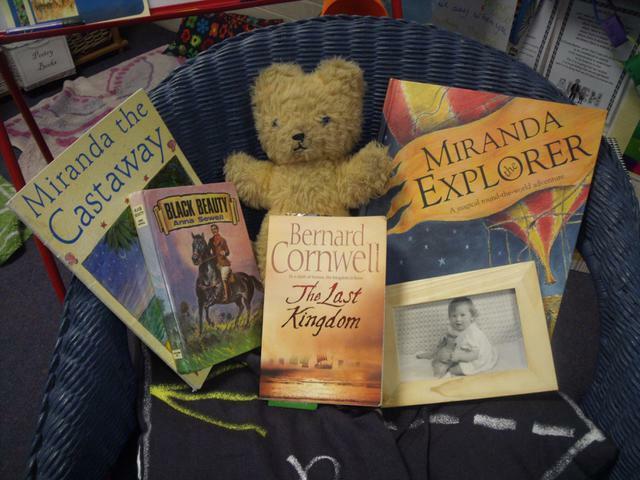 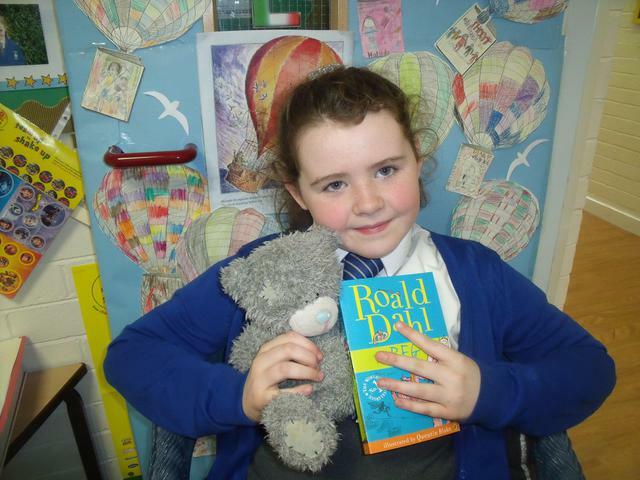 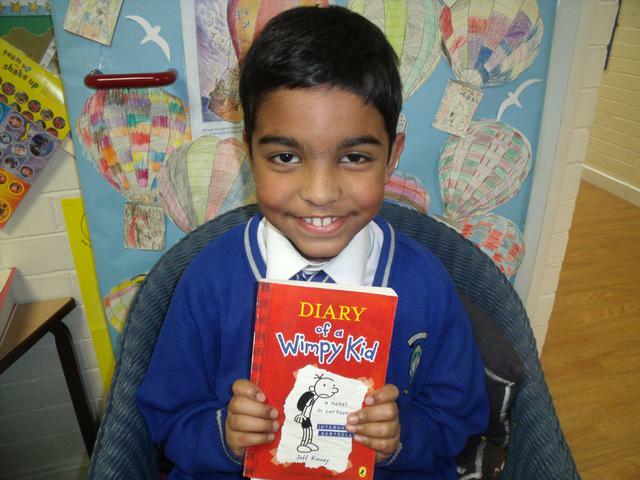 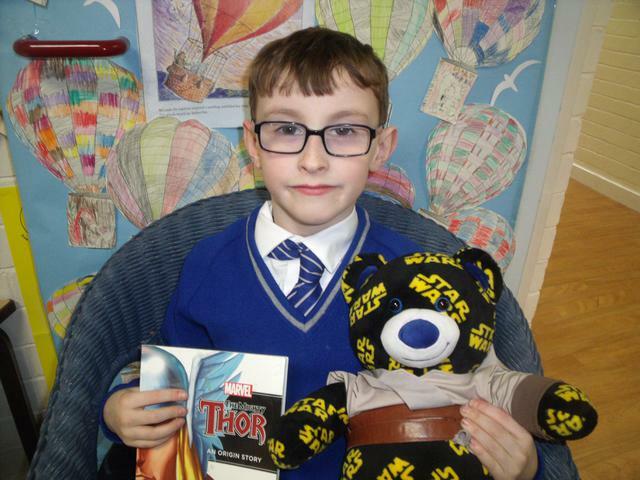 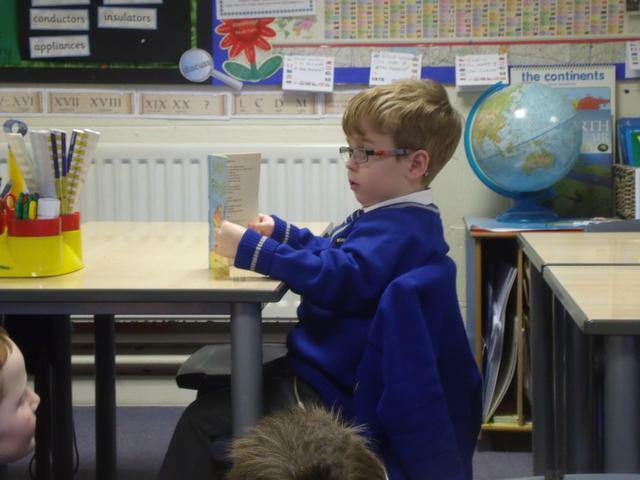 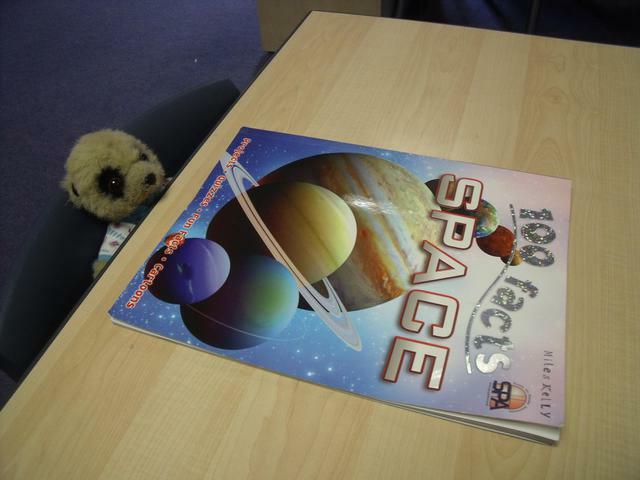 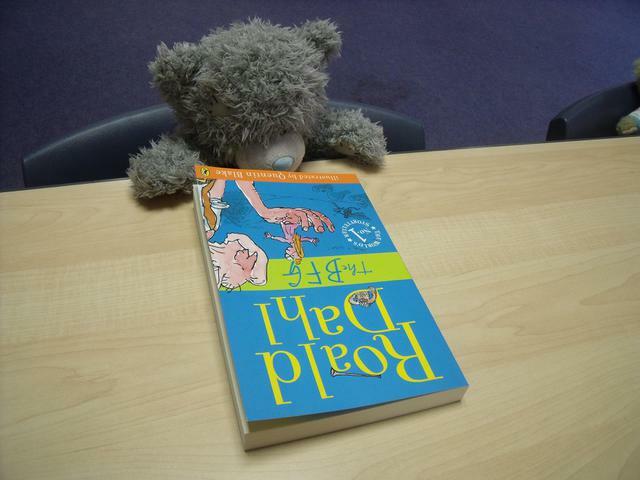 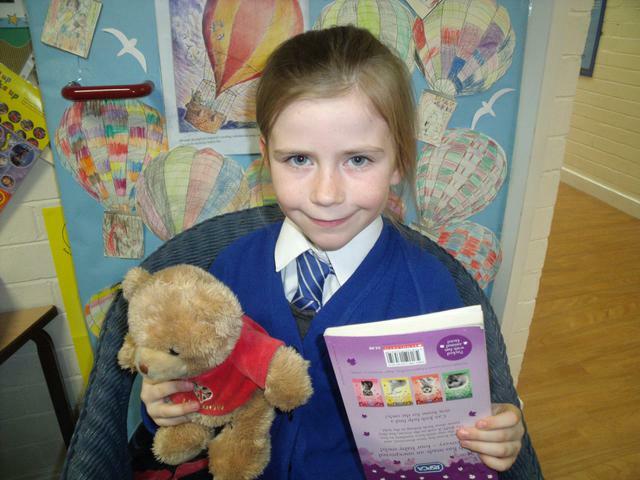 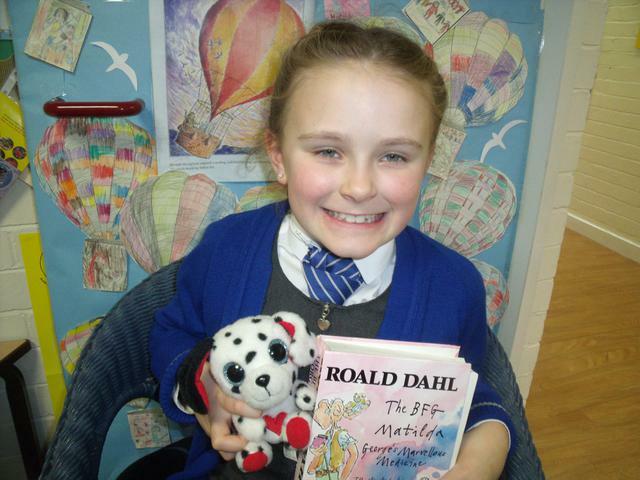 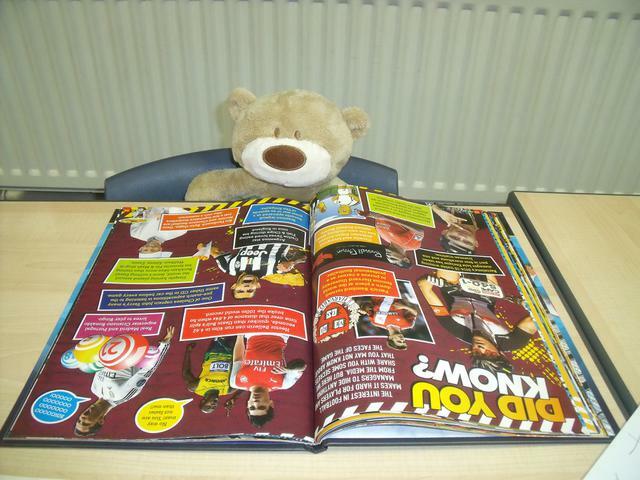 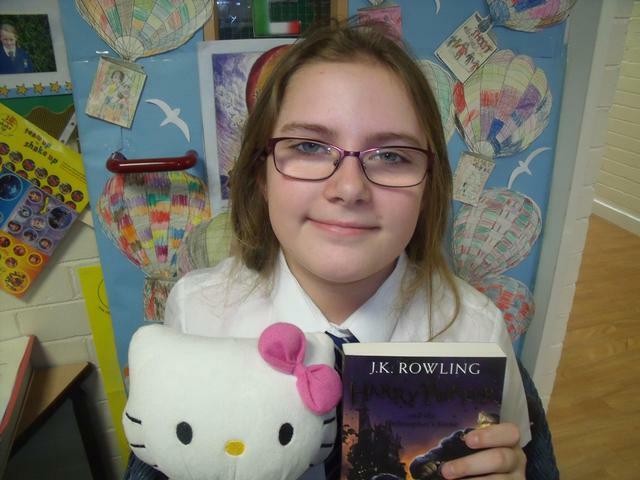 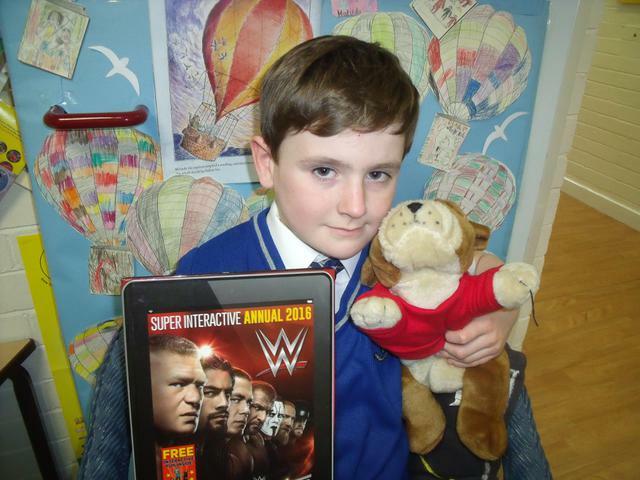 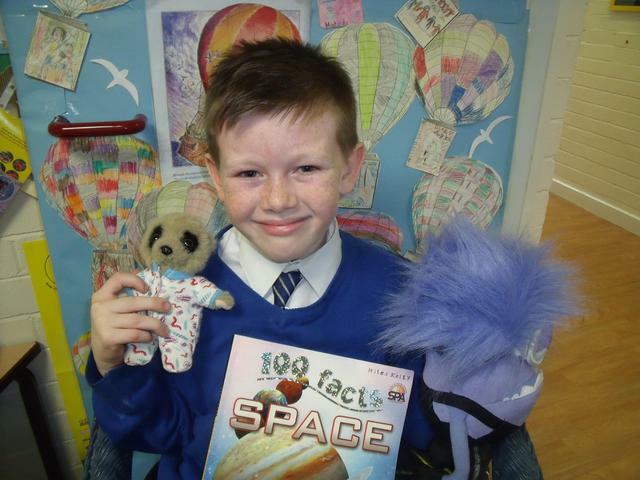 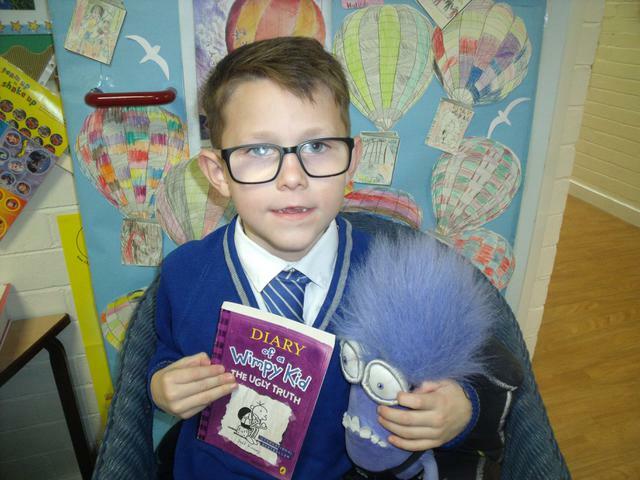 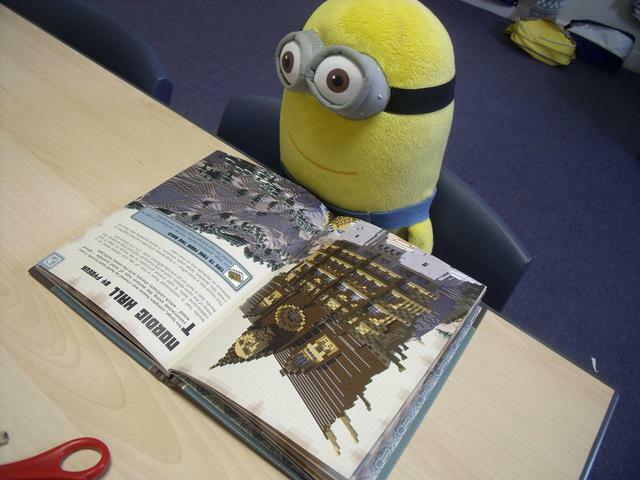 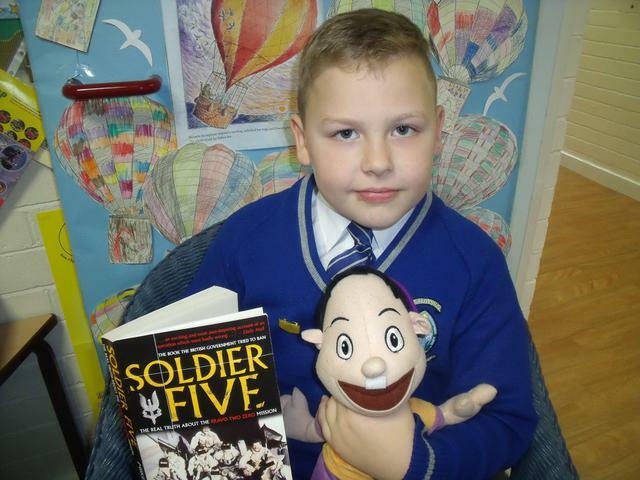 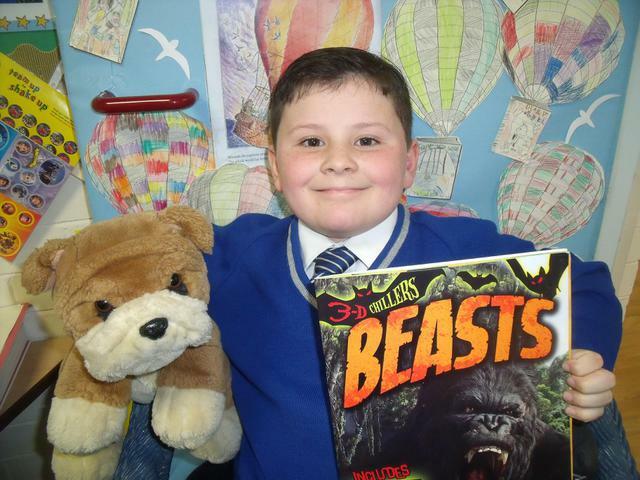 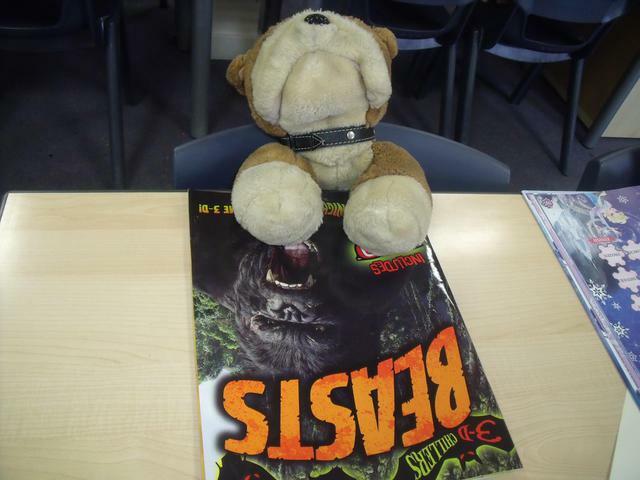 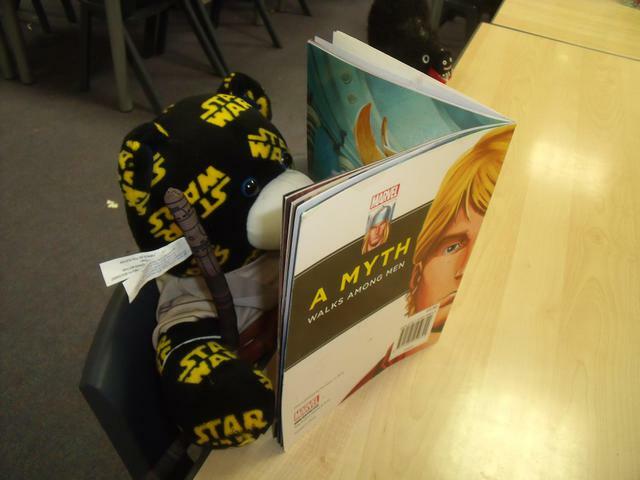 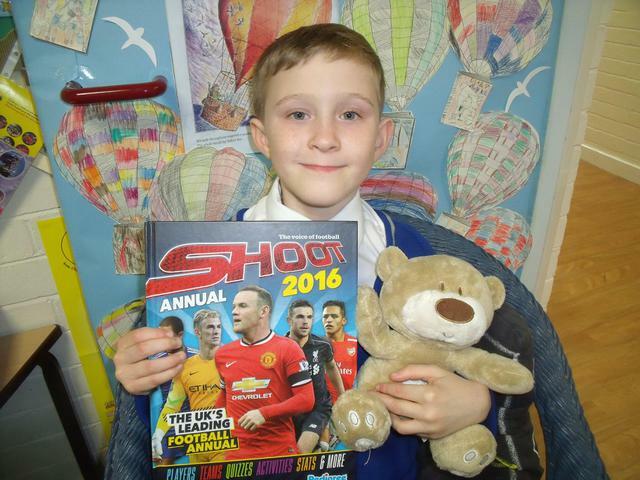 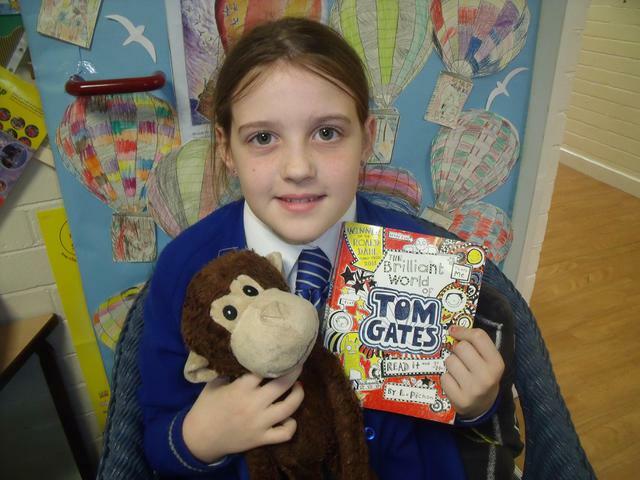 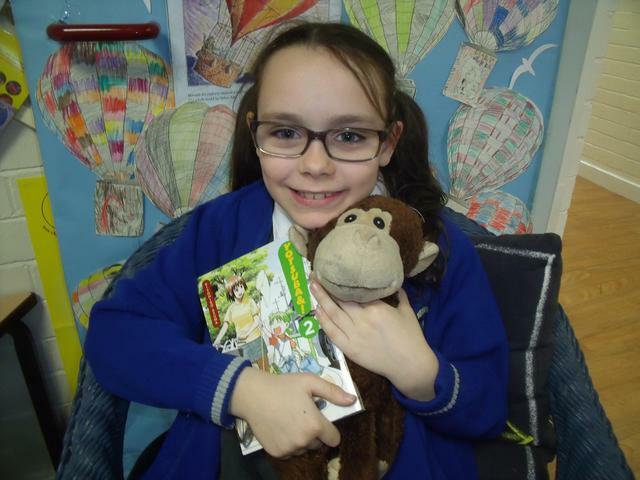 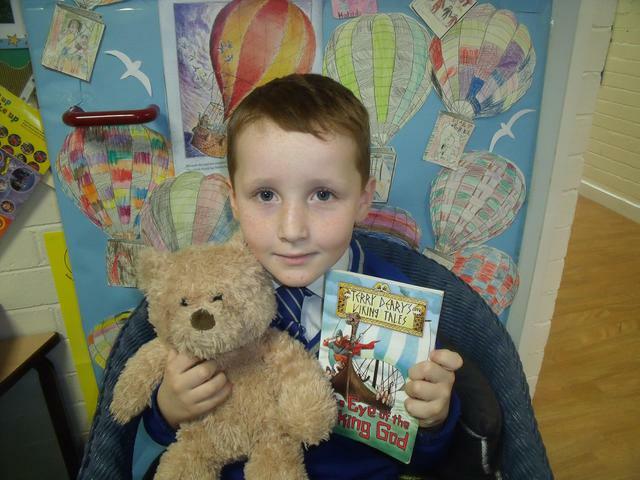 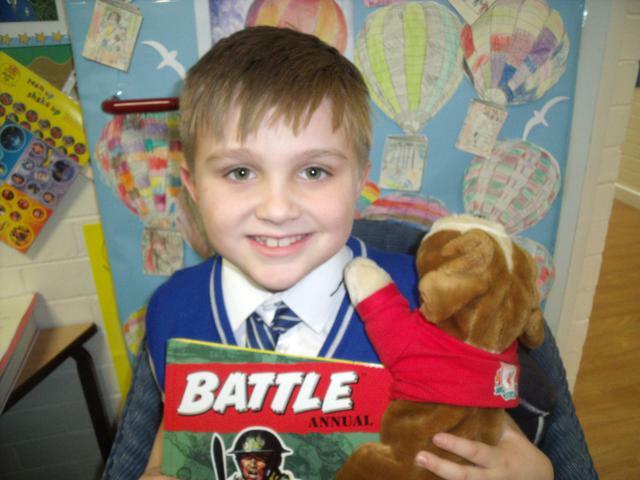 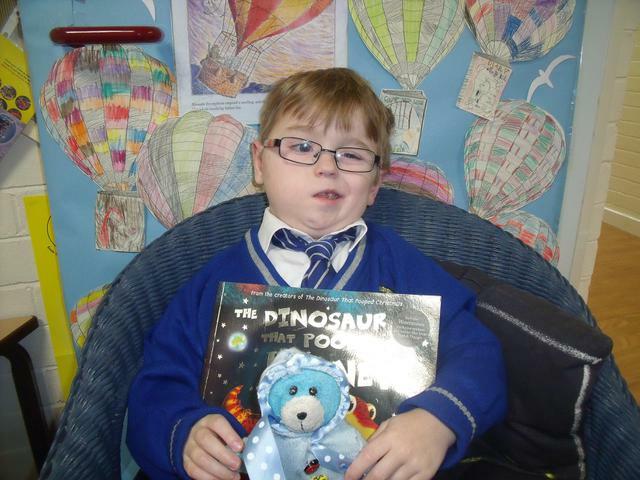 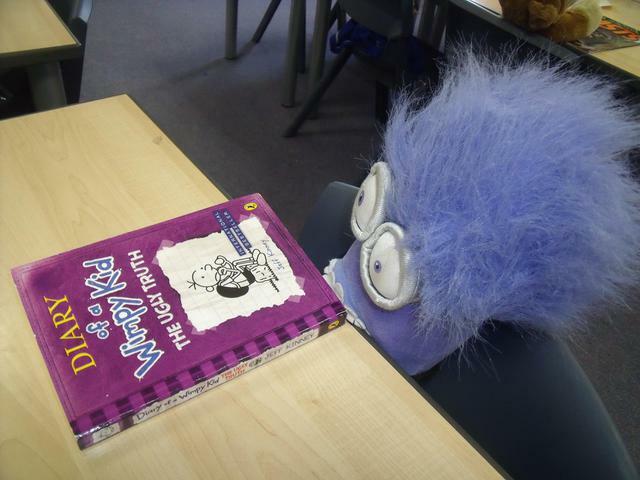 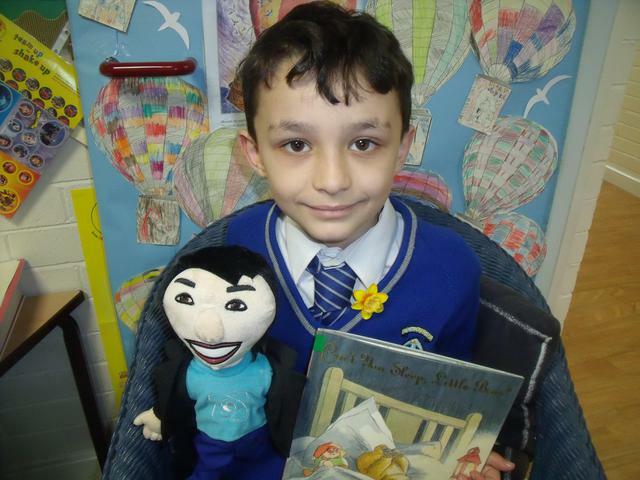 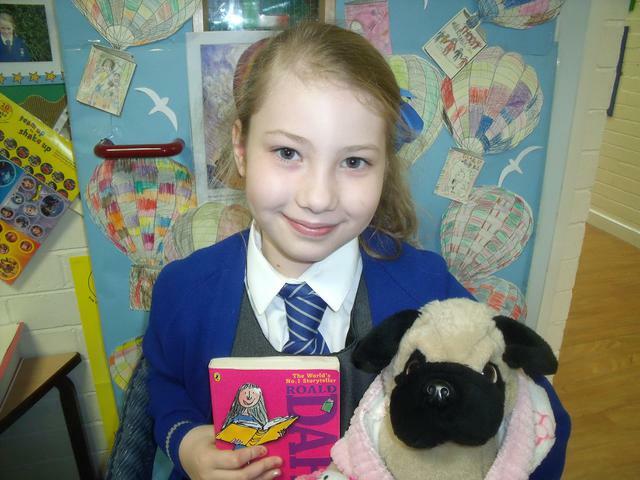 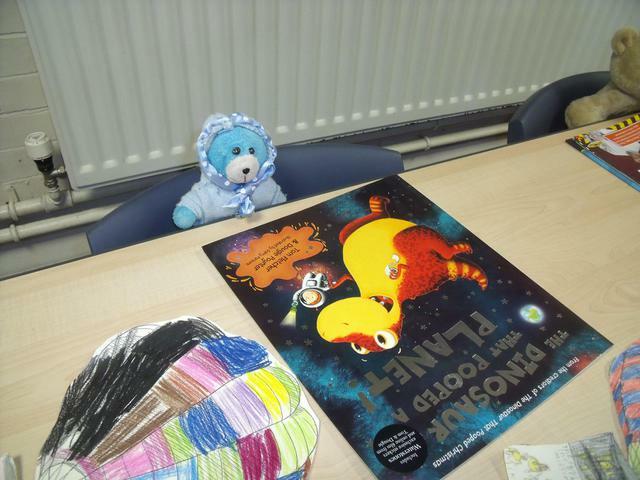 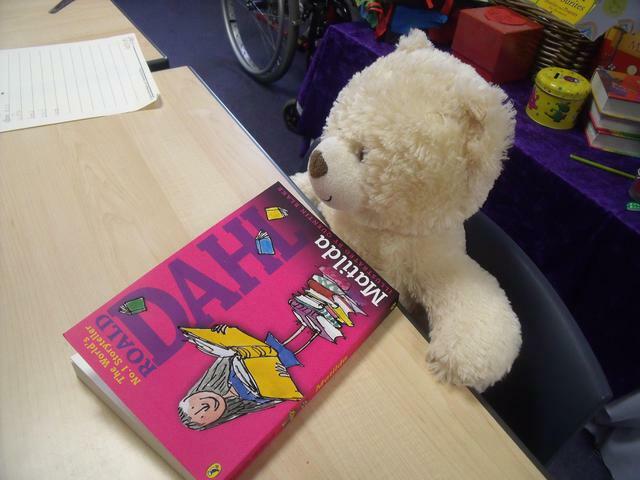 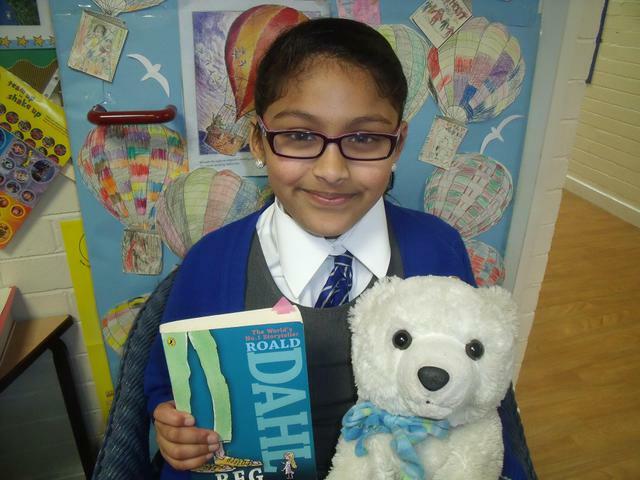 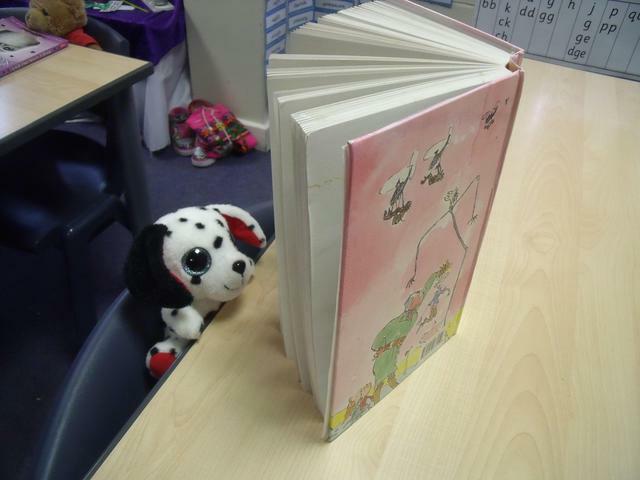 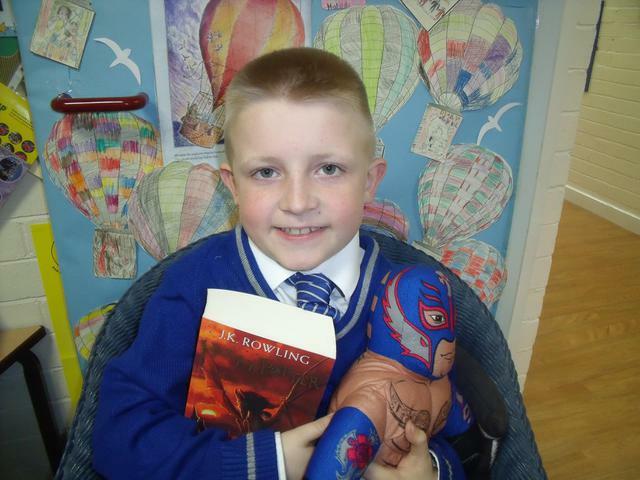 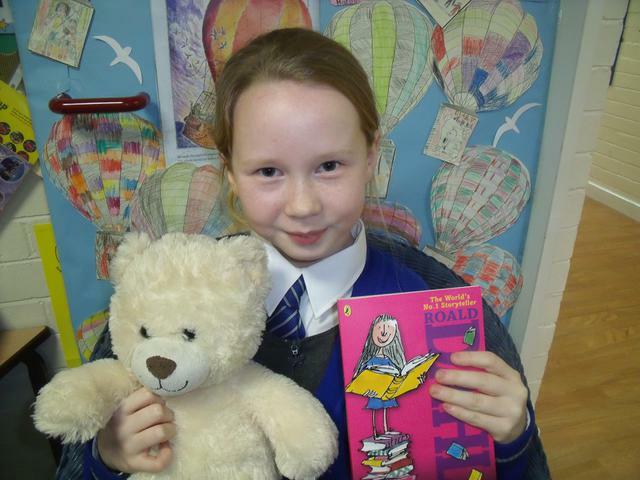 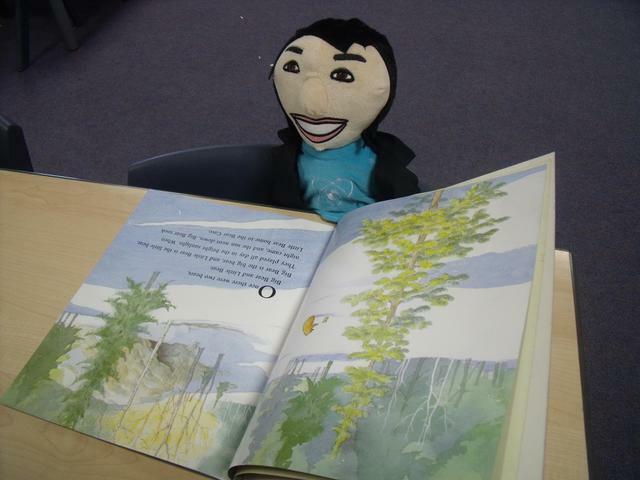 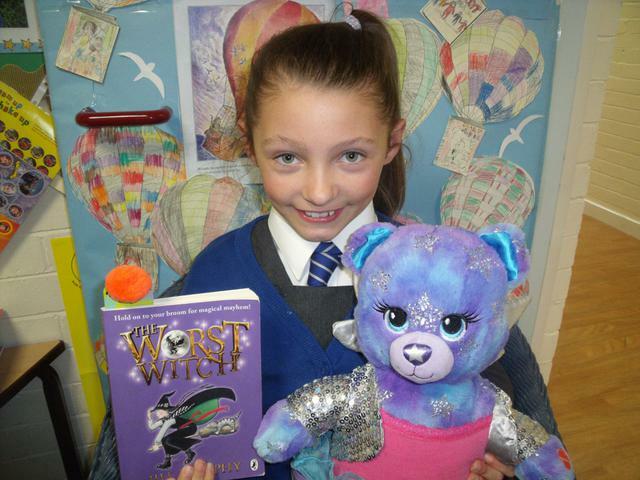 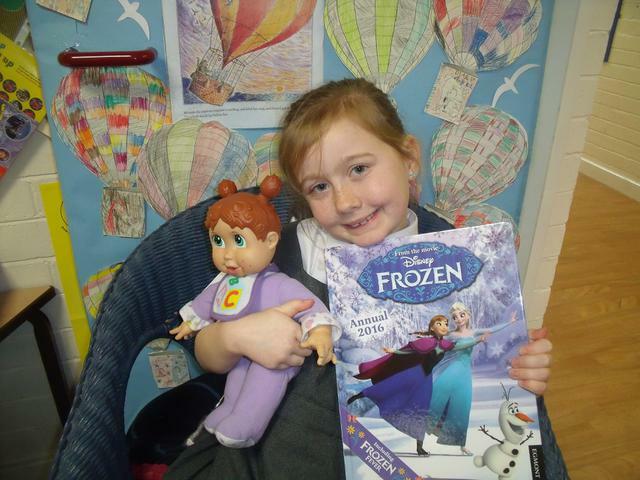 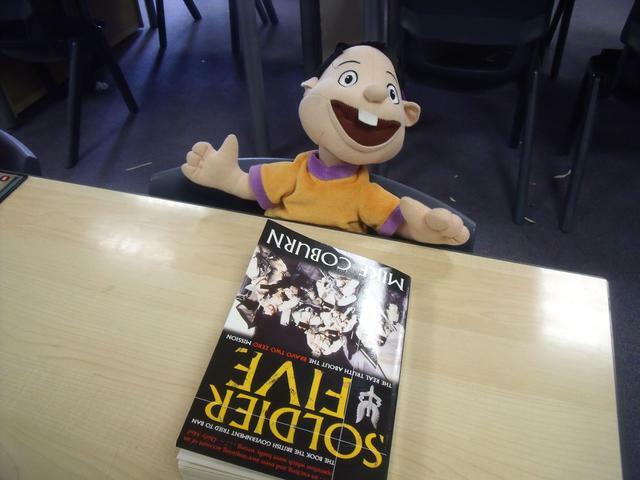 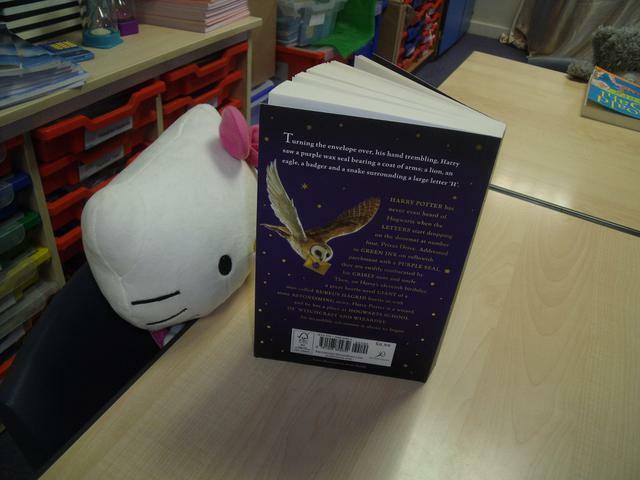 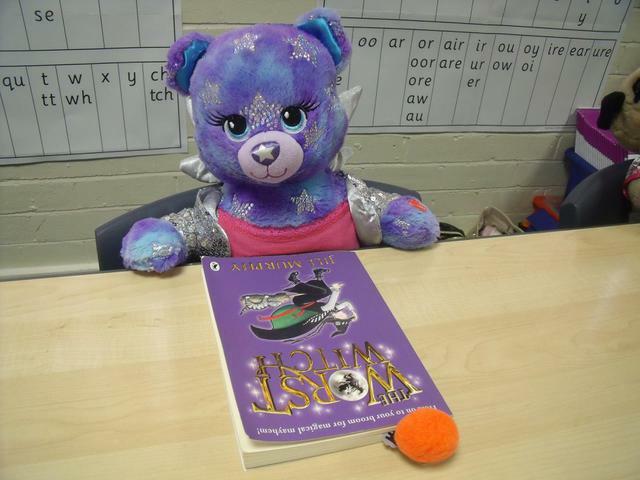 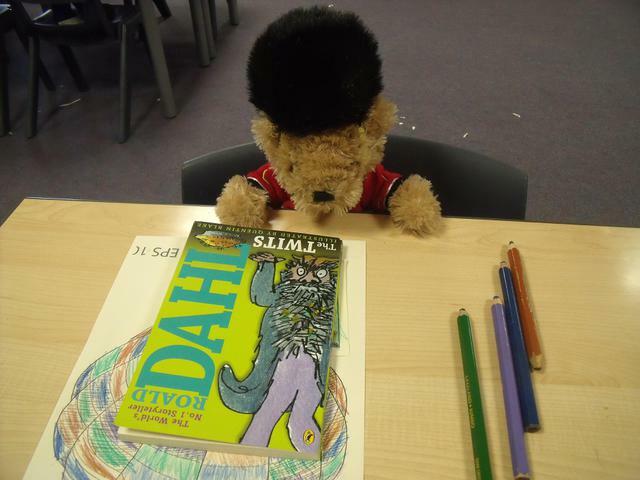 The children brought in their favourite books along with a teddy. 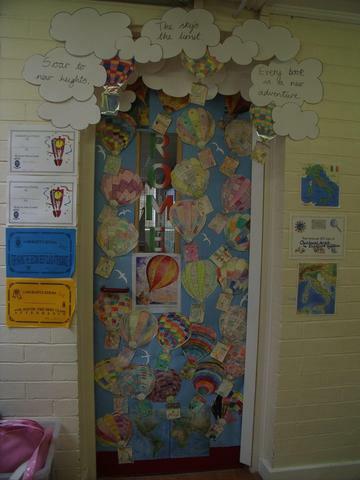 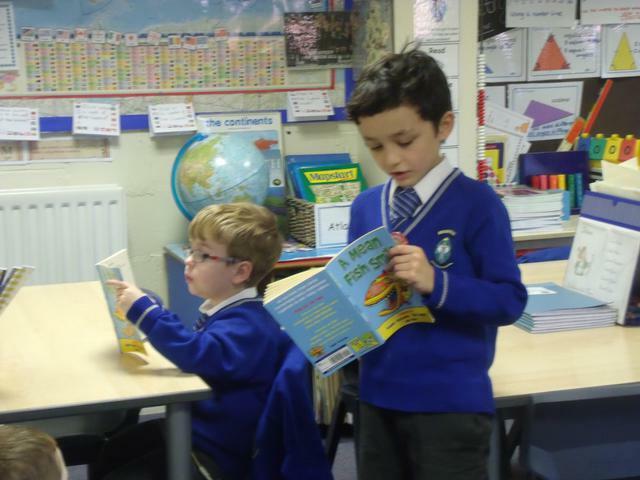 They had a great time reading their stories, drawing the front cover, writing a book review and helping to decorate the classroom door with hot air balloons.